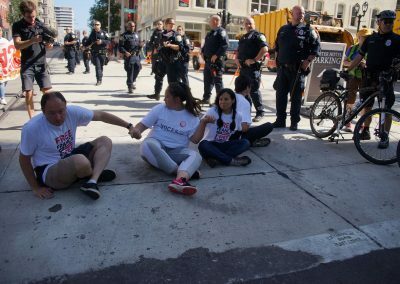 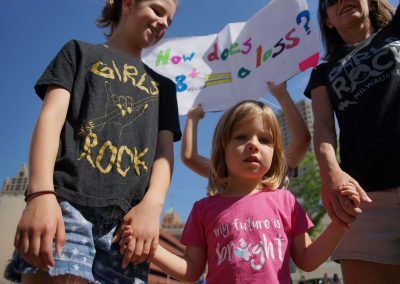 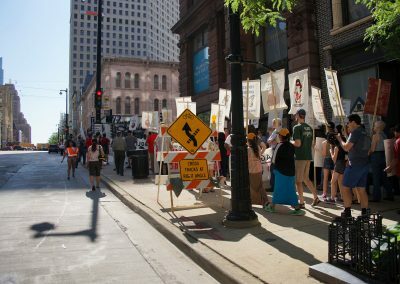 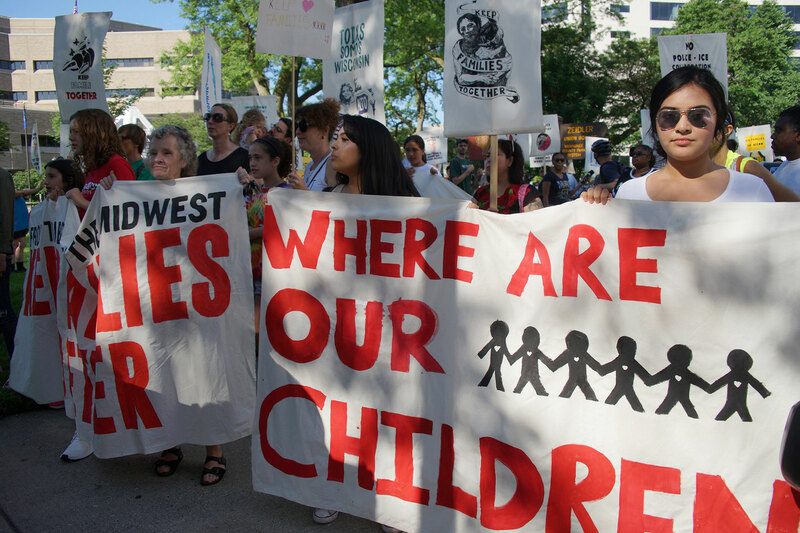 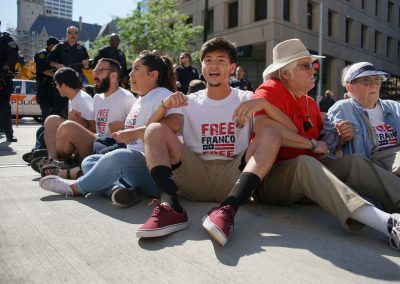 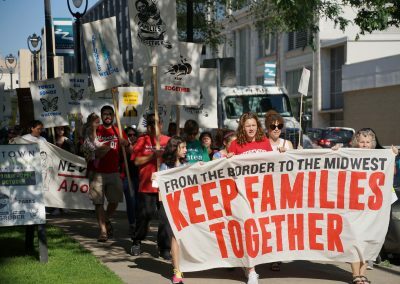 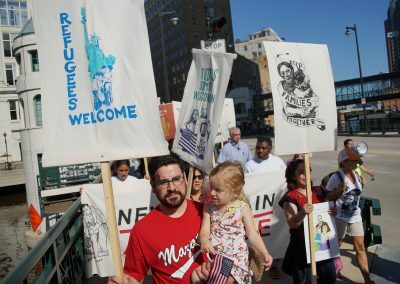 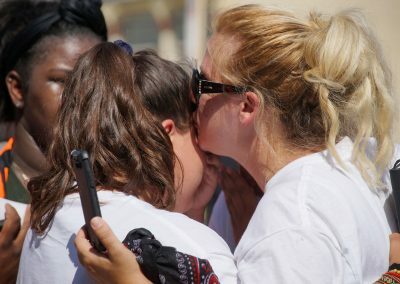 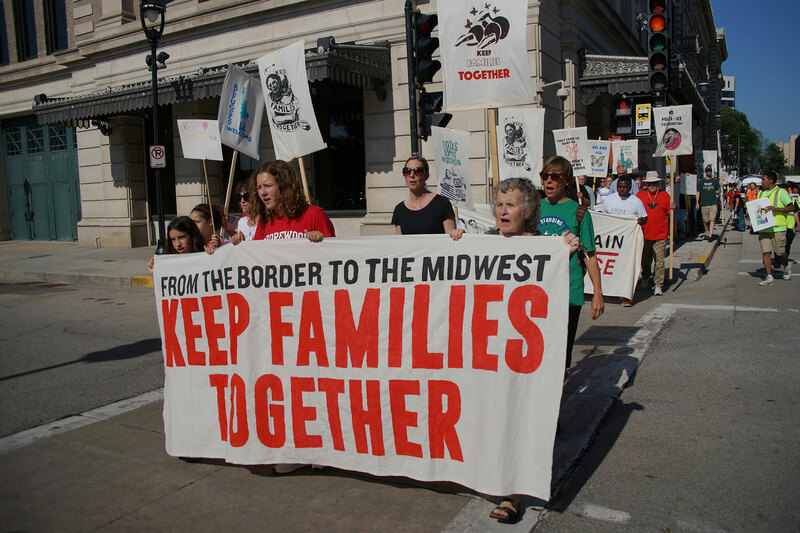 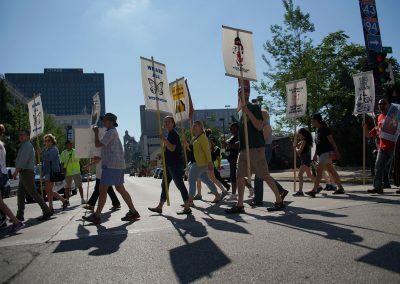 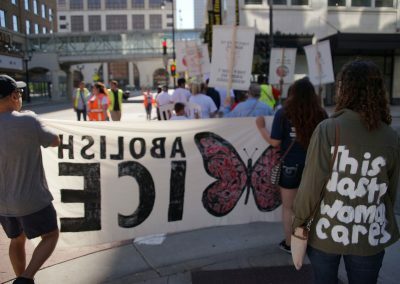 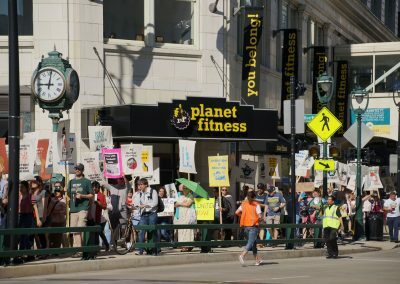 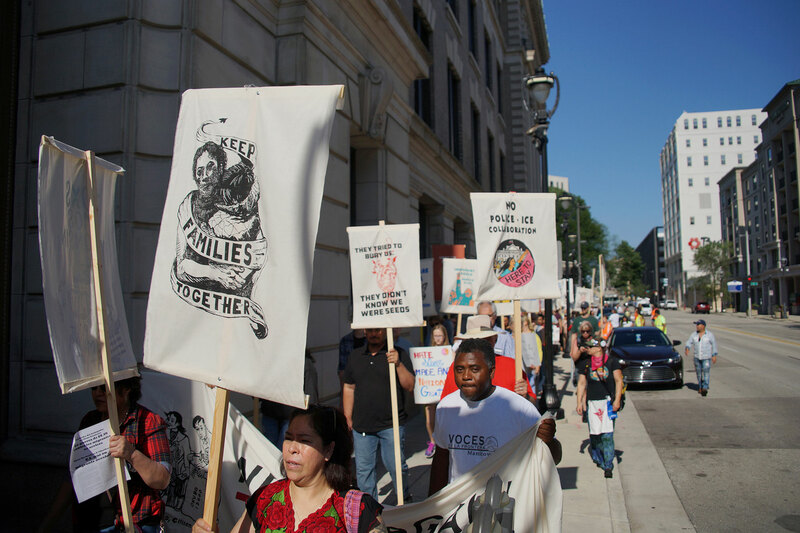 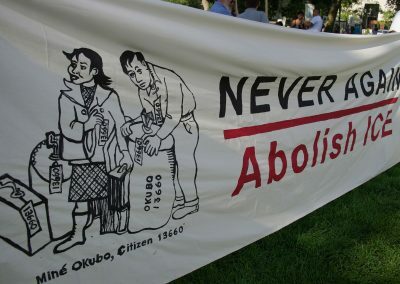 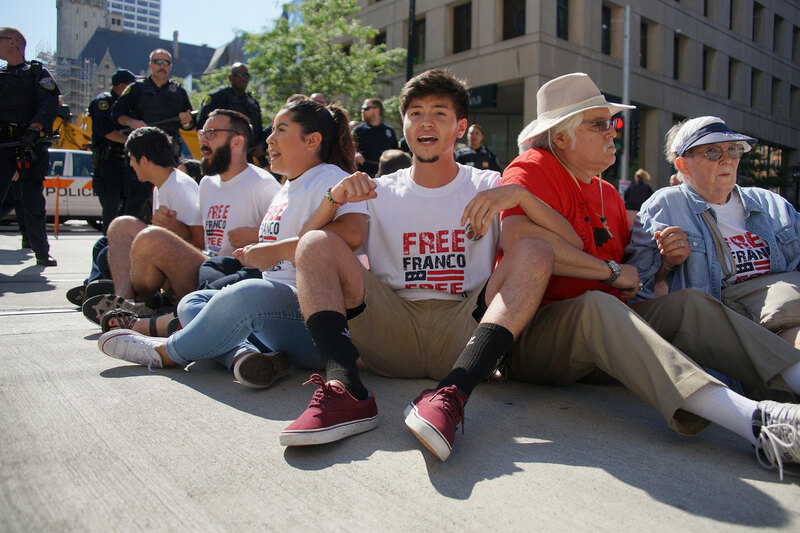 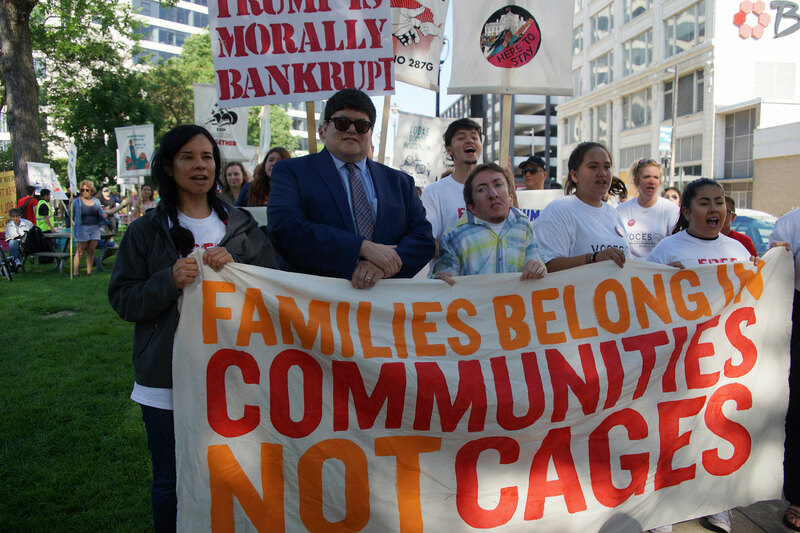 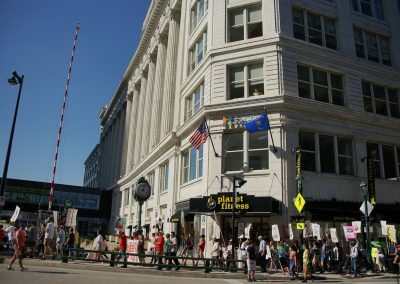 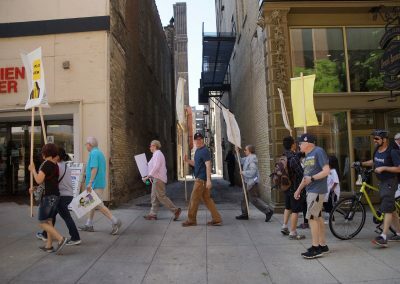 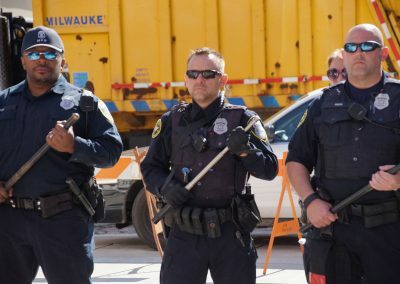 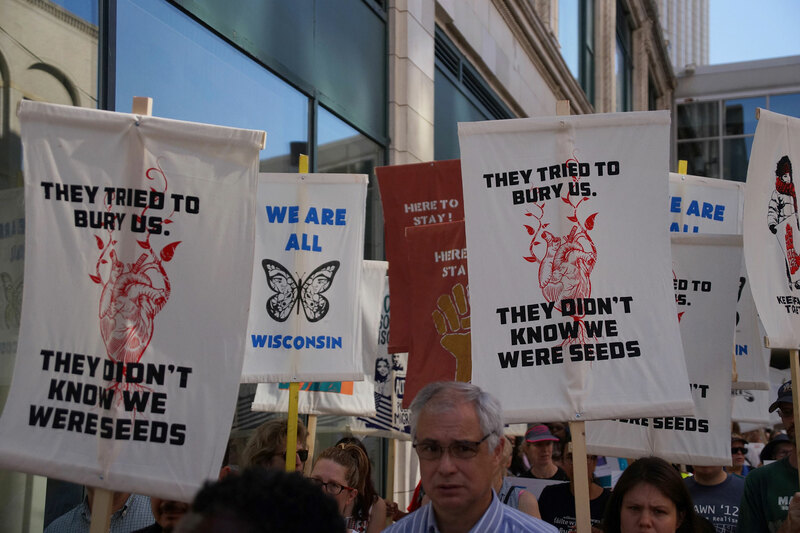 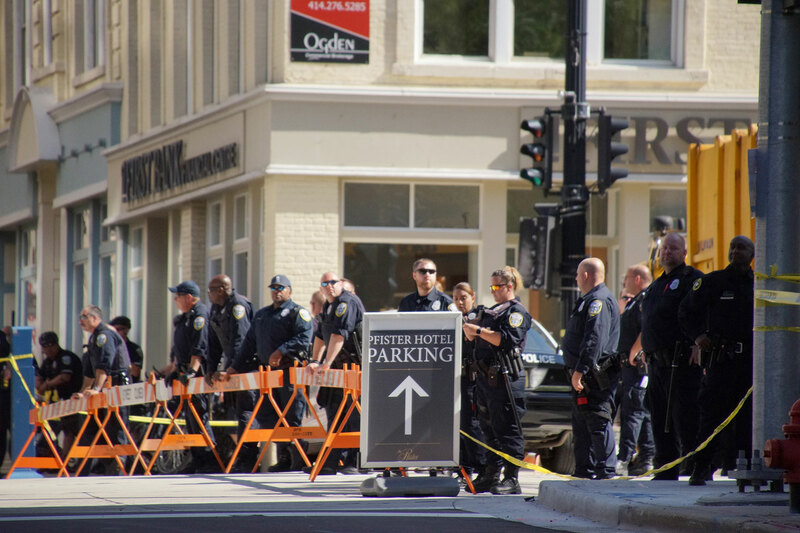 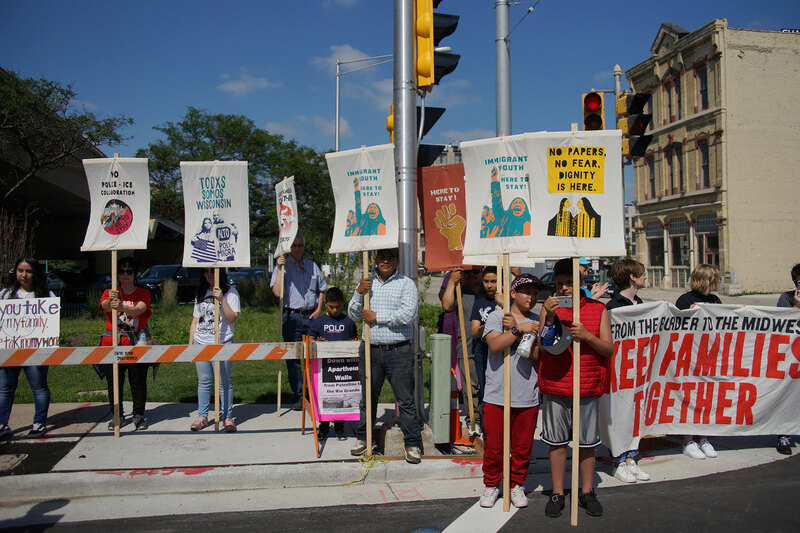 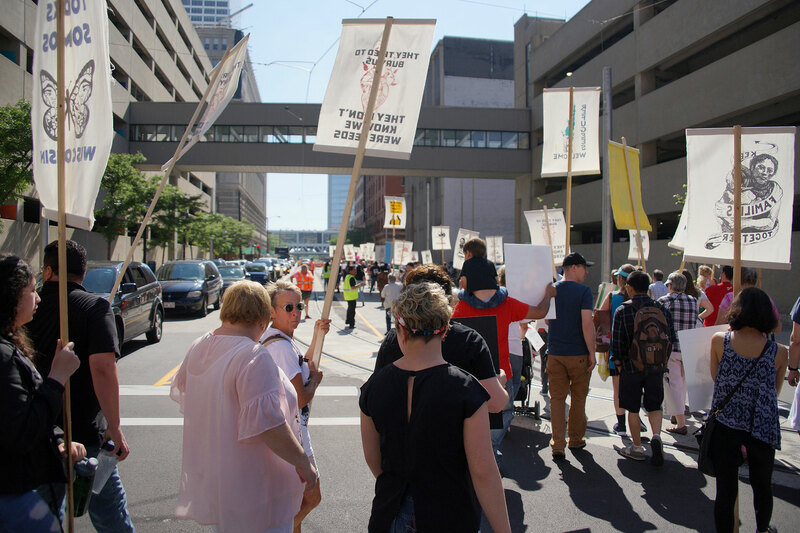 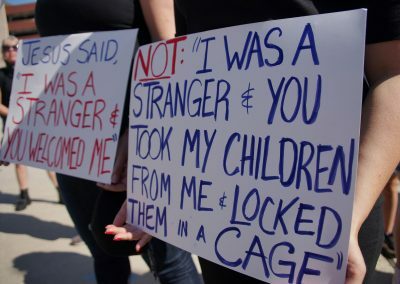 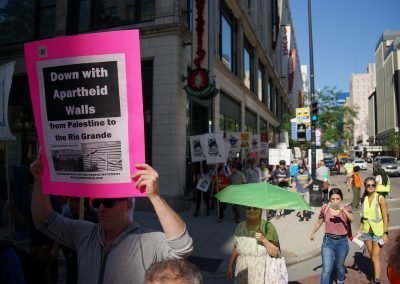 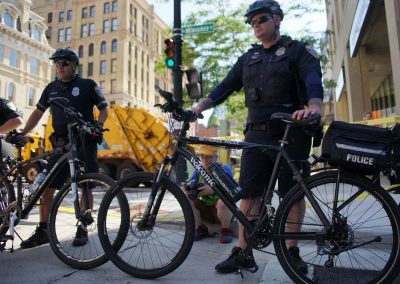 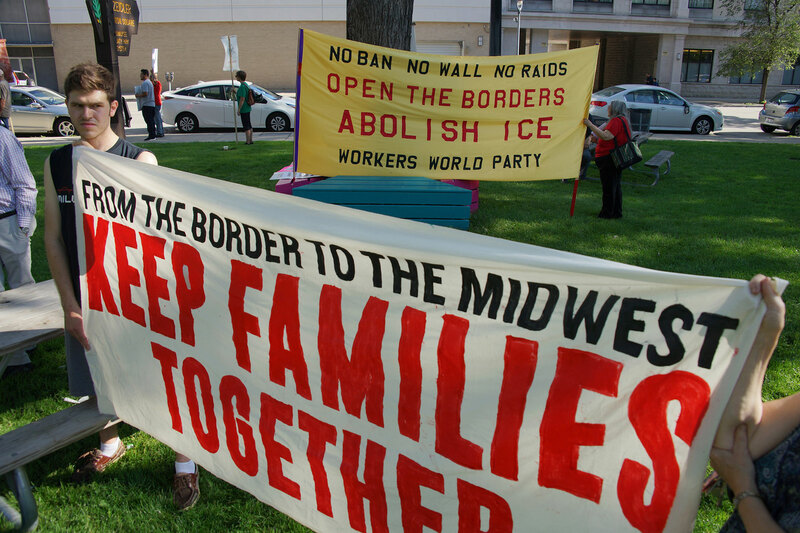 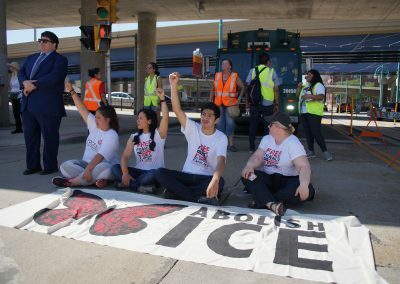 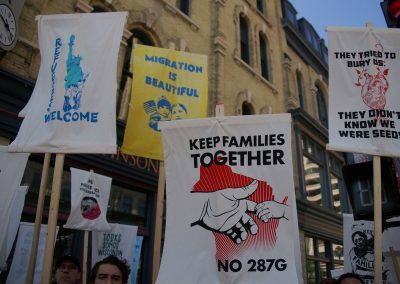 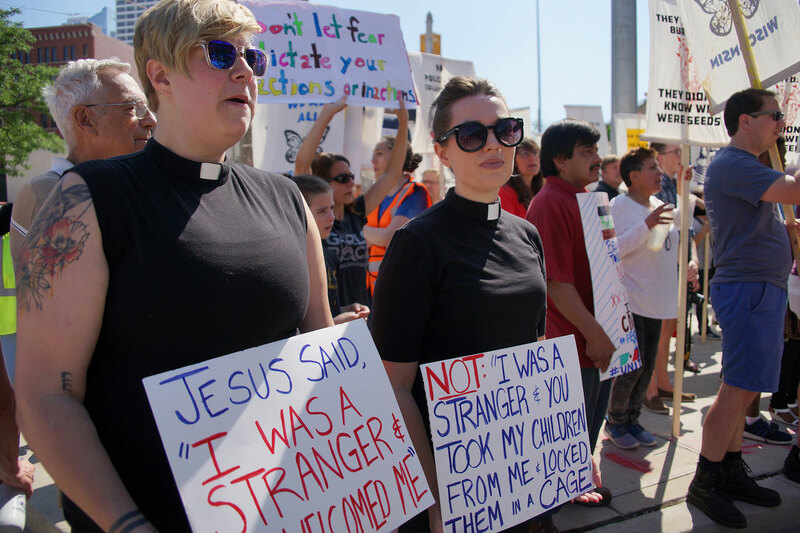 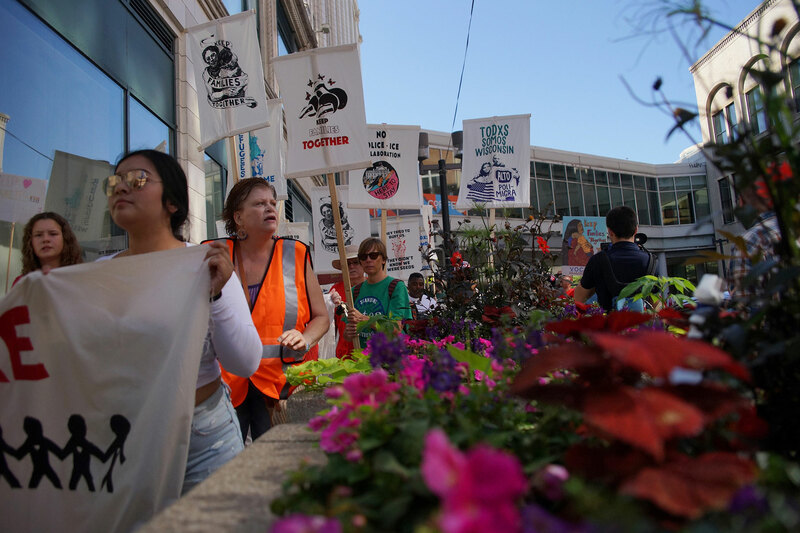 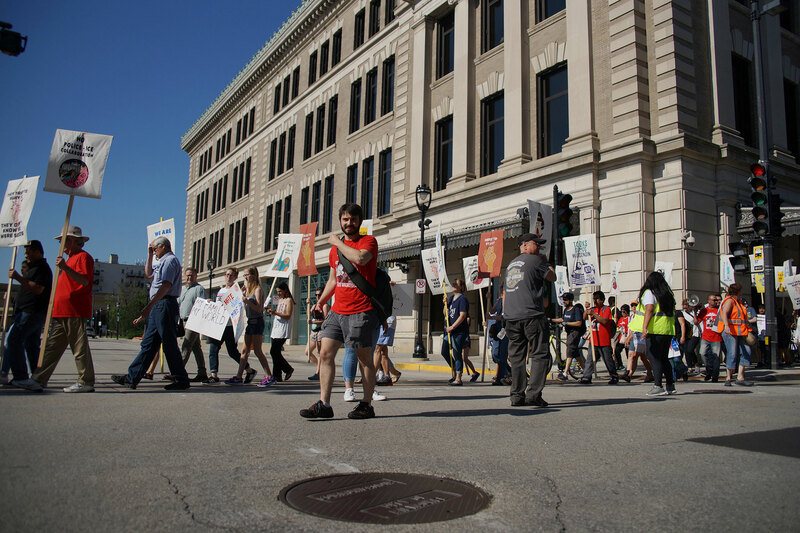 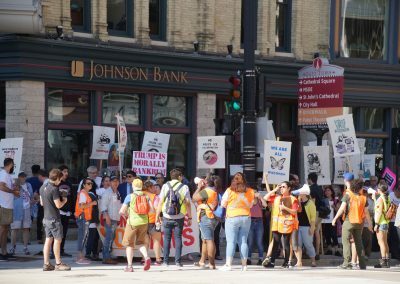 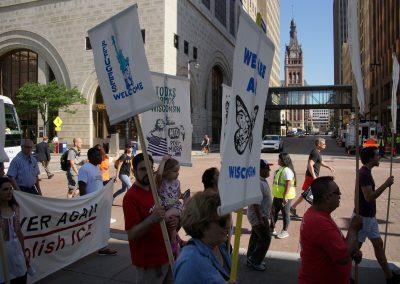 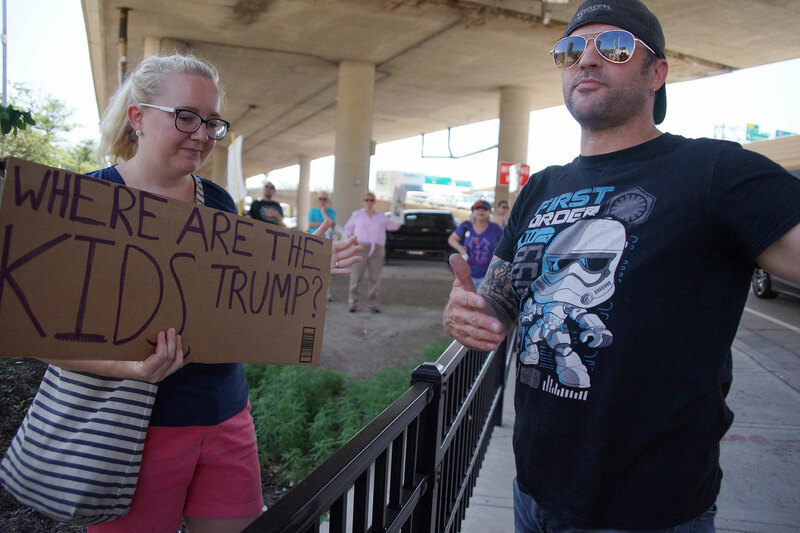 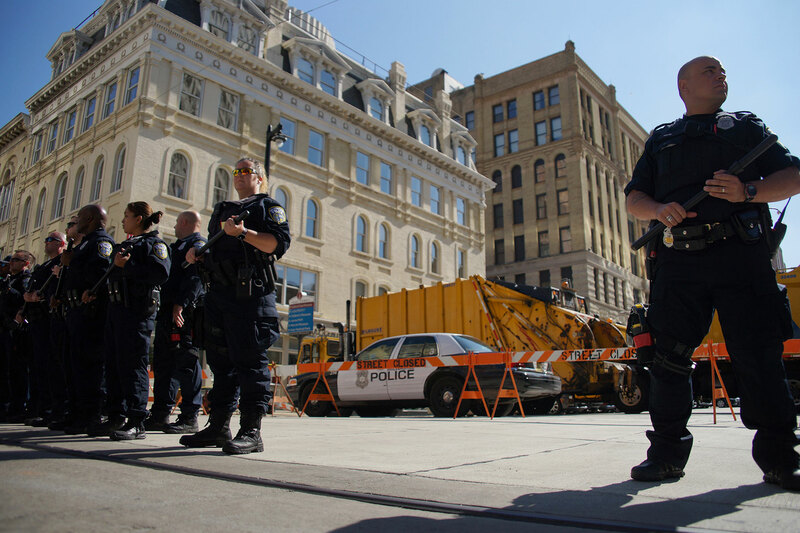 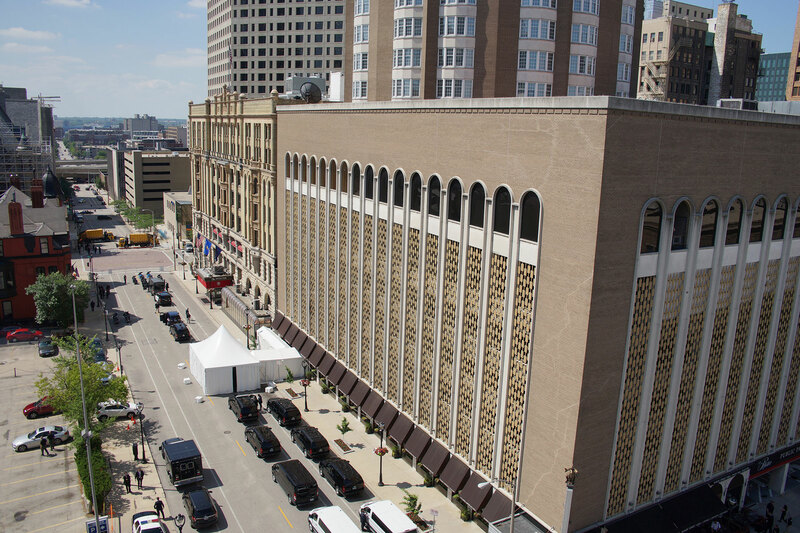 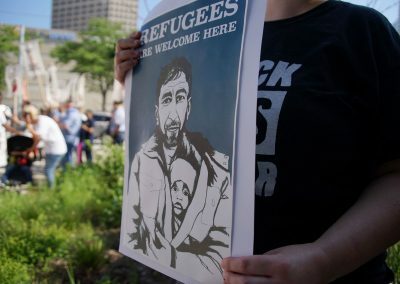 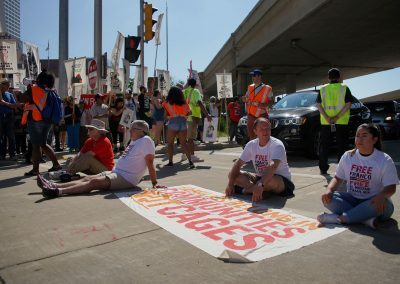 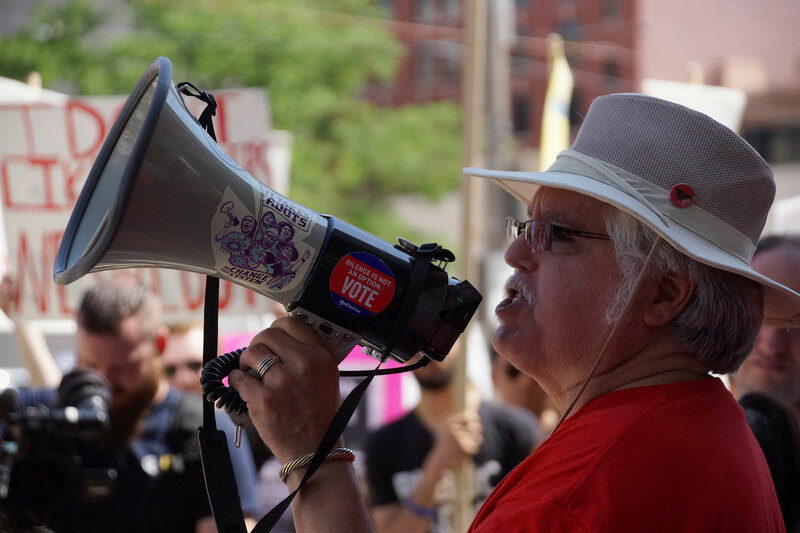 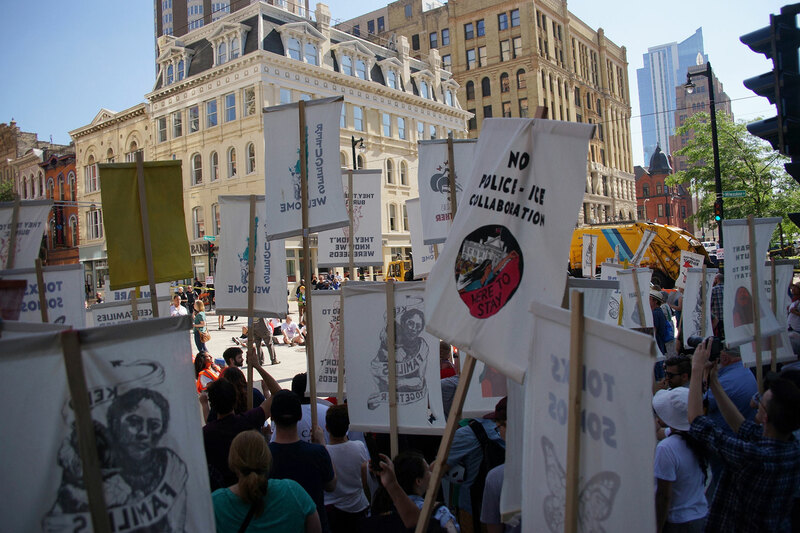 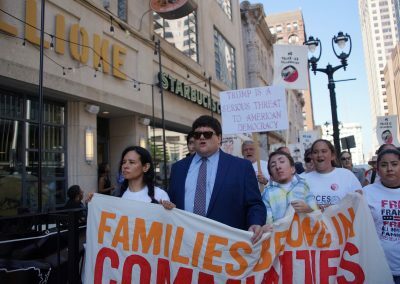 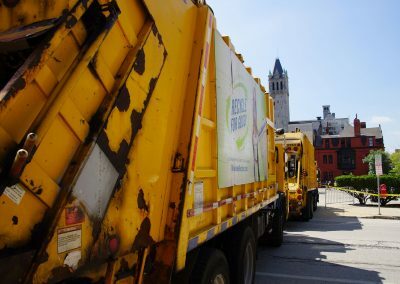 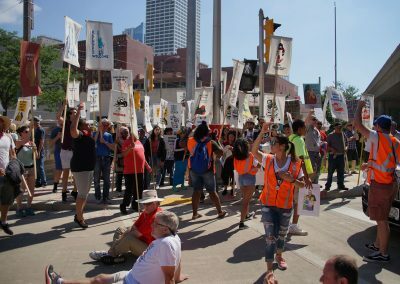 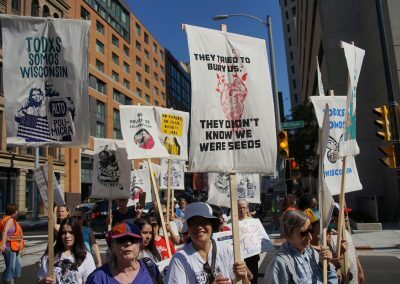 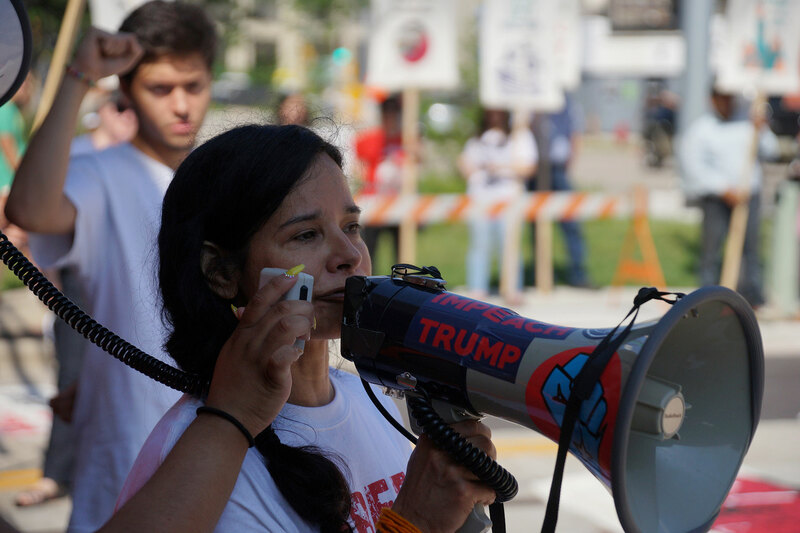 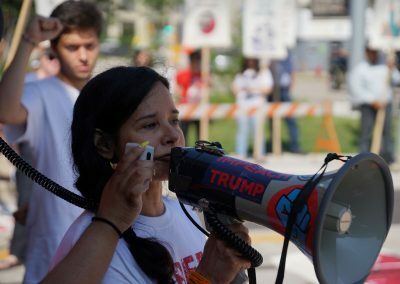 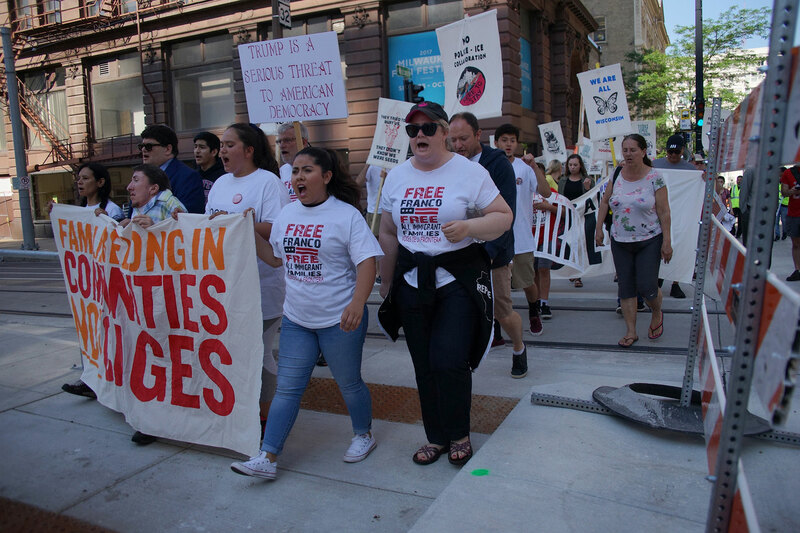 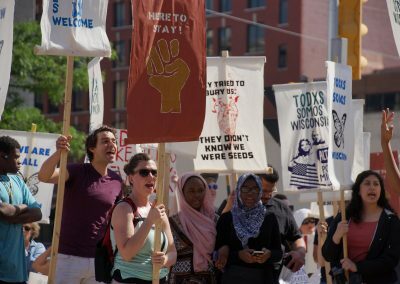 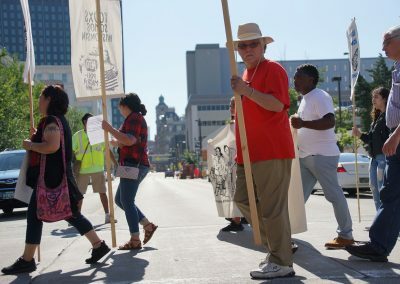 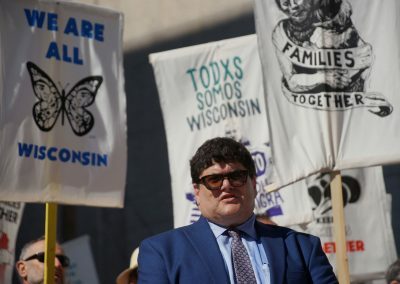 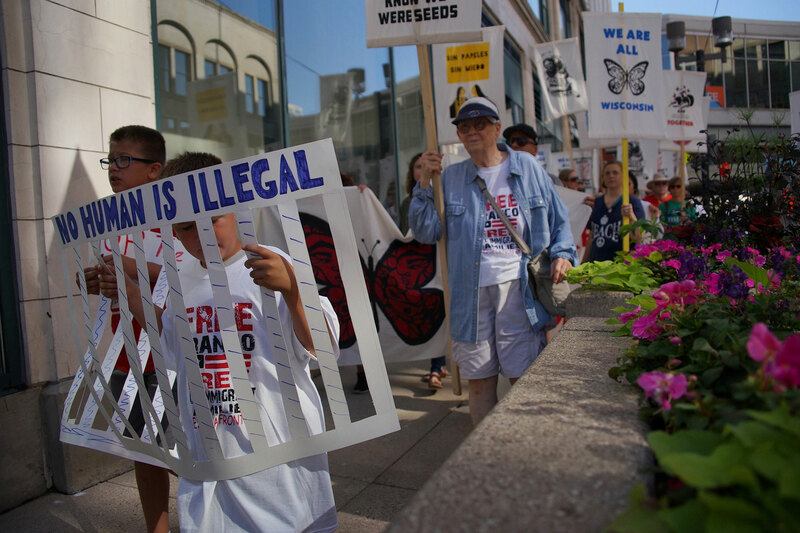 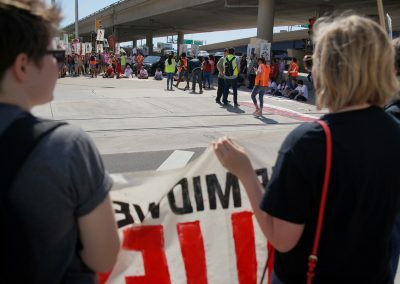 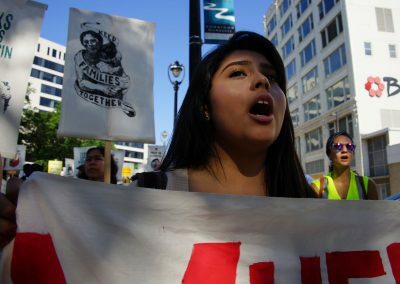 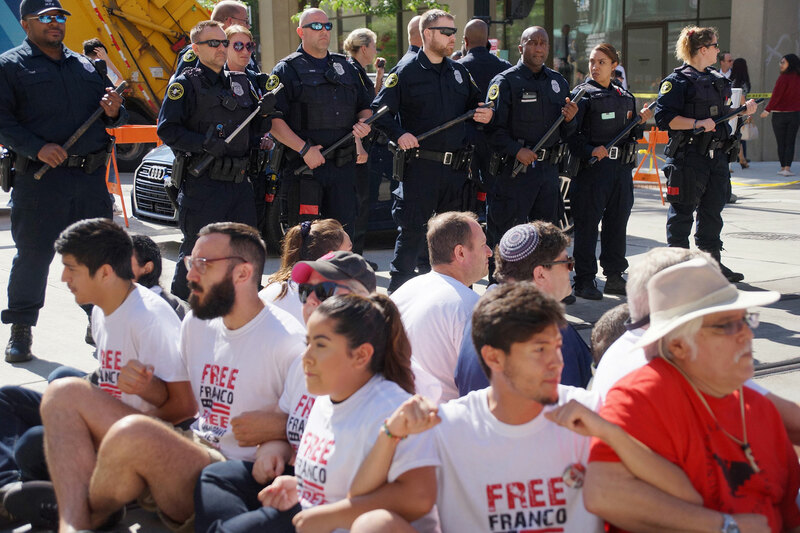 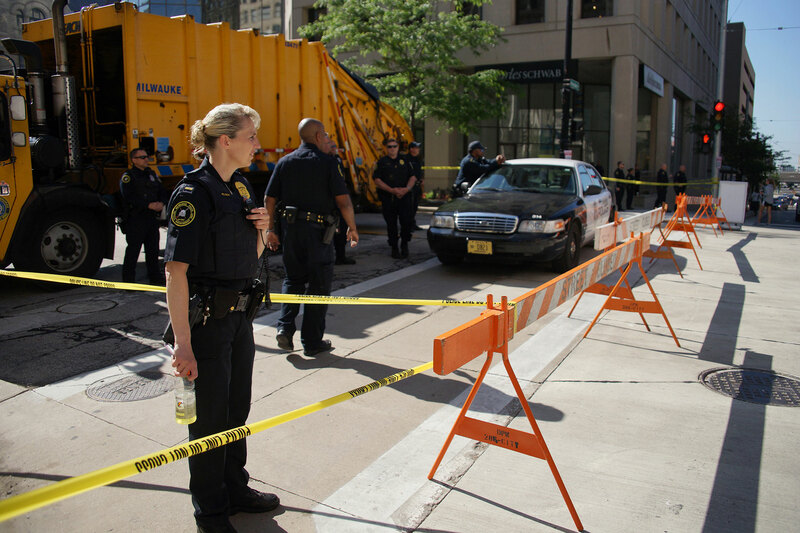 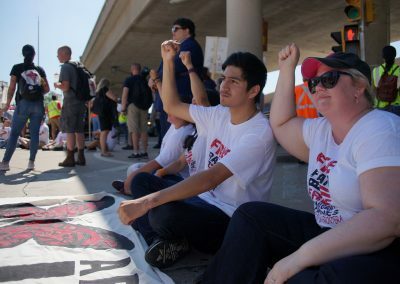 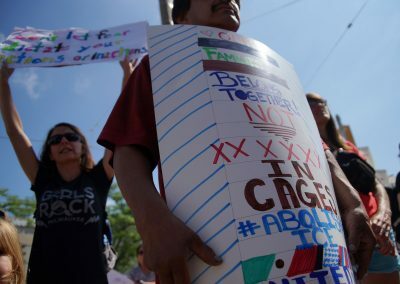 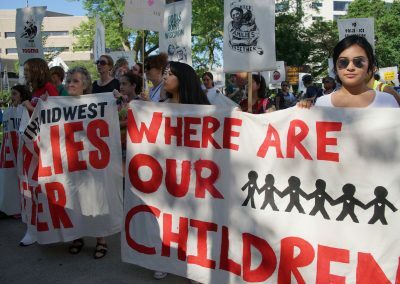 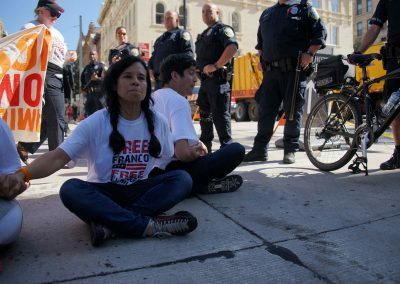 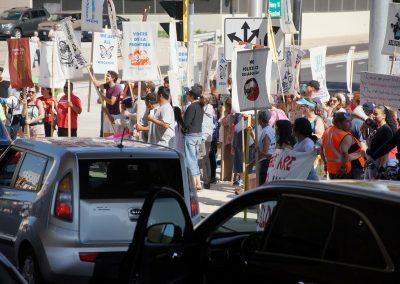 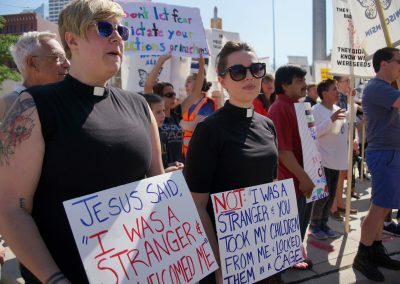 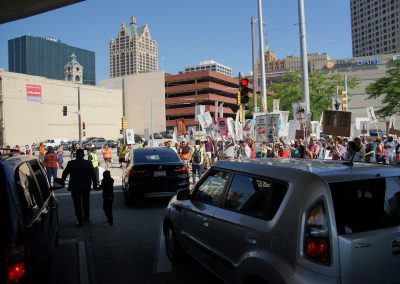 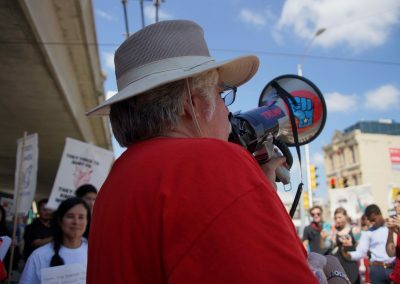 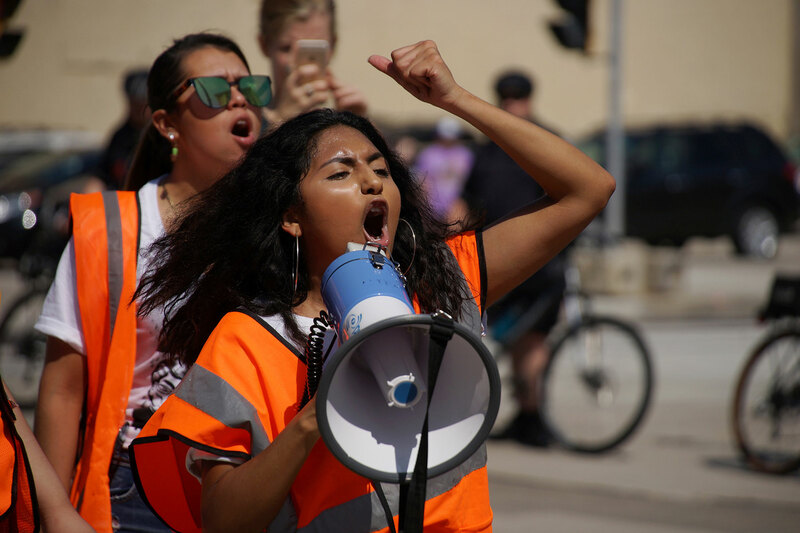 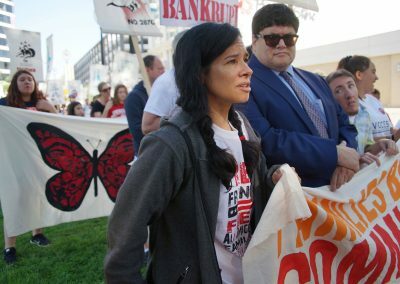 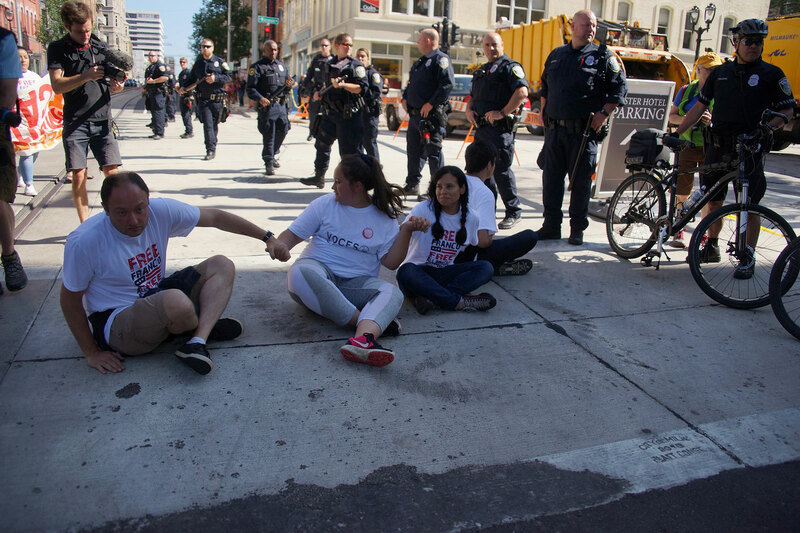 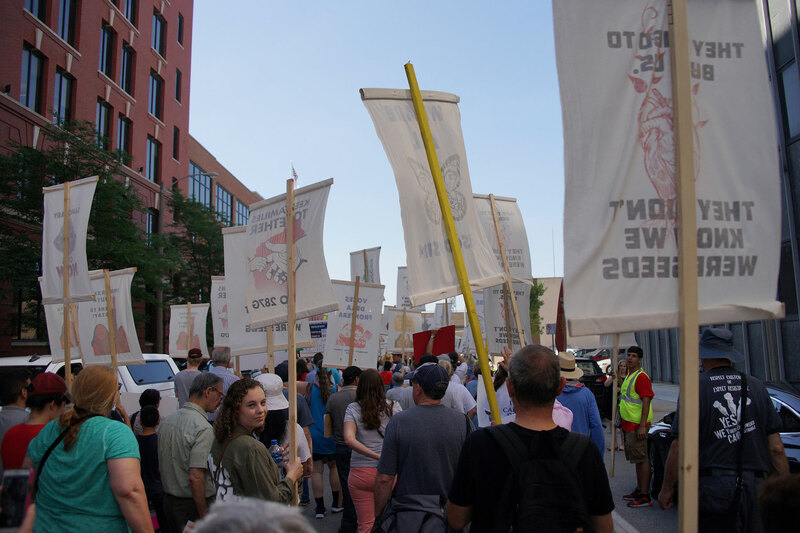 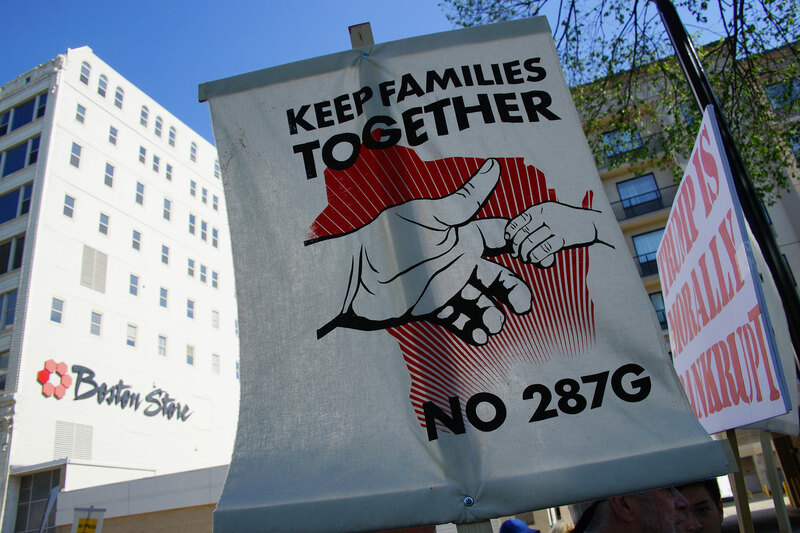 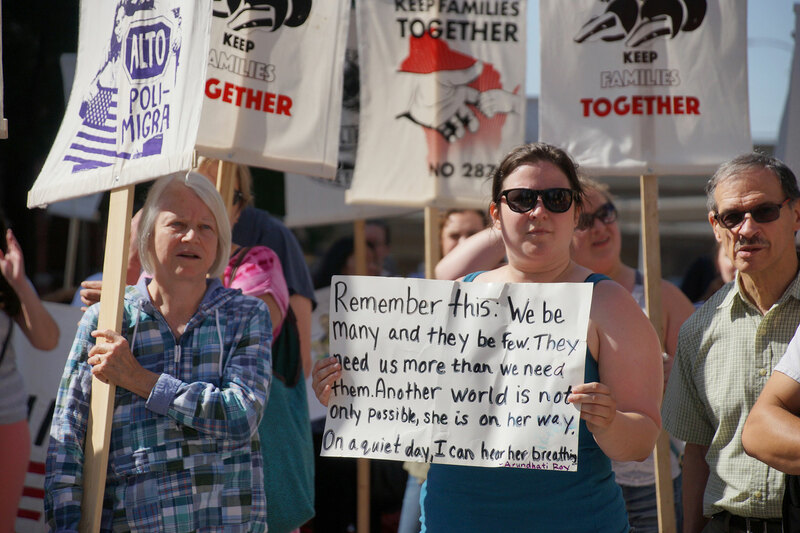 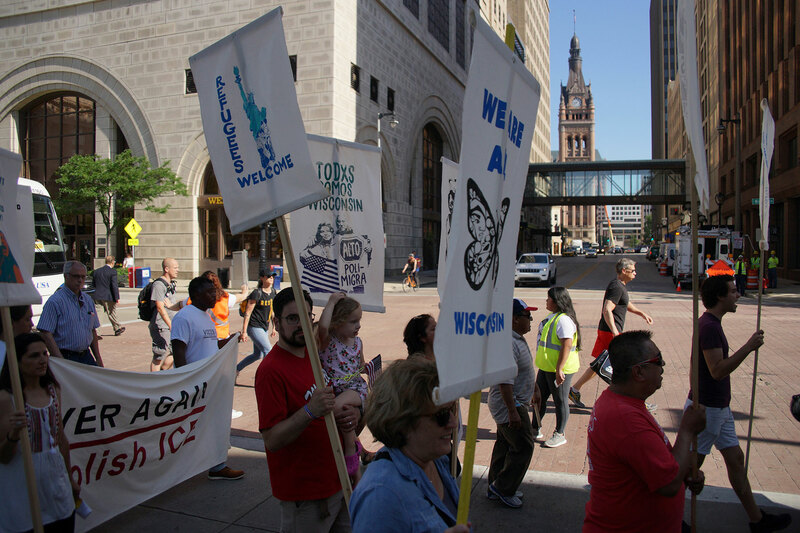 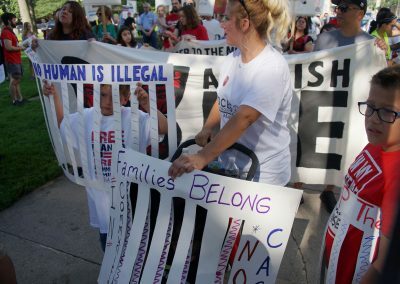 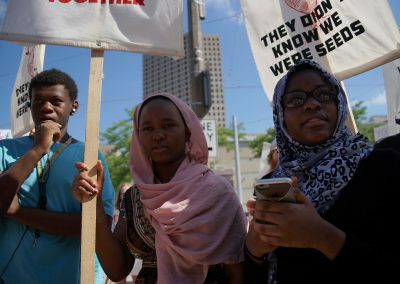 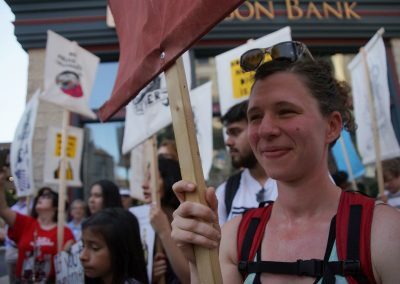 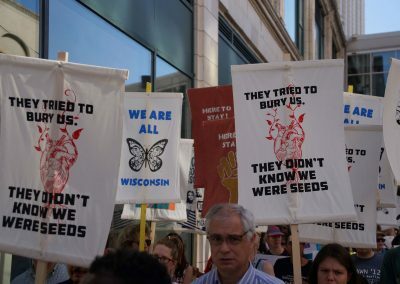 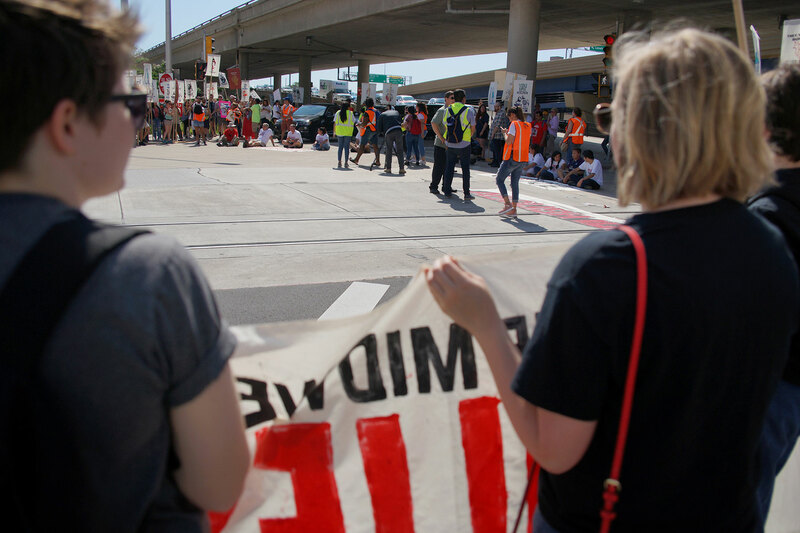 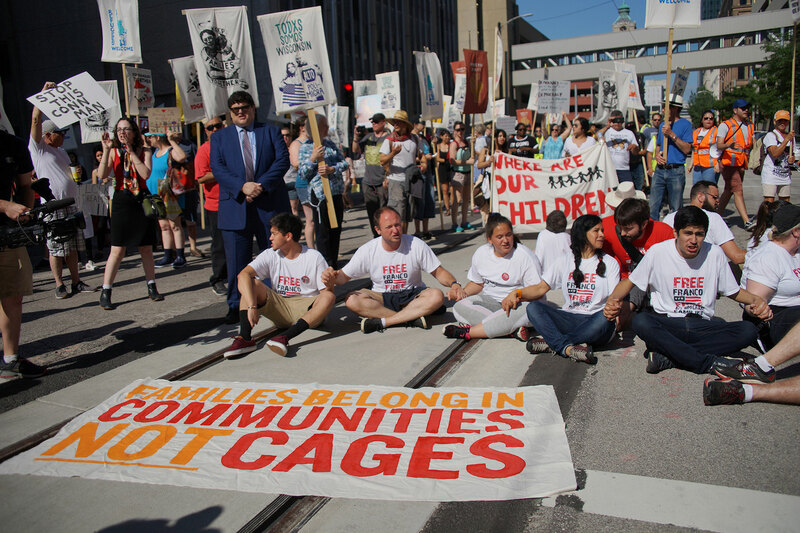 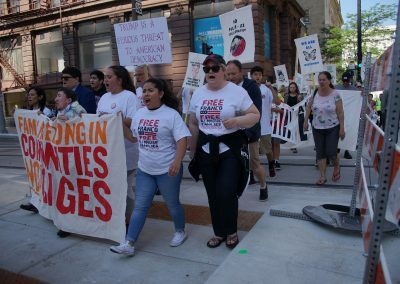 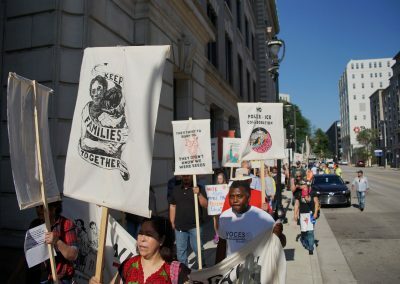 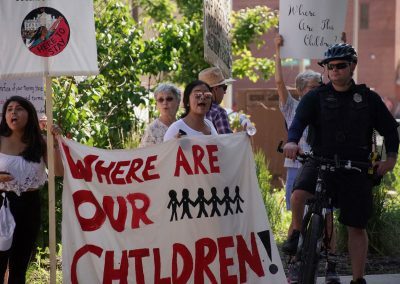 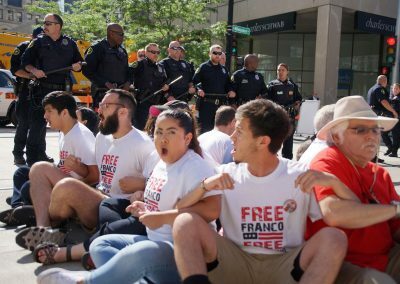 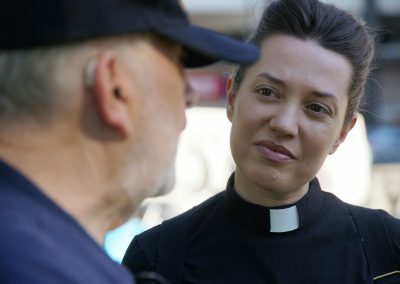 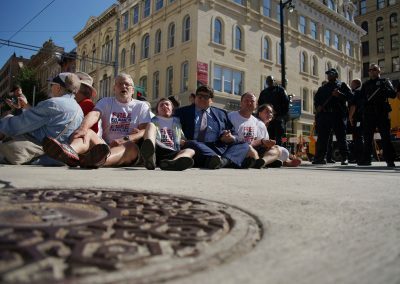 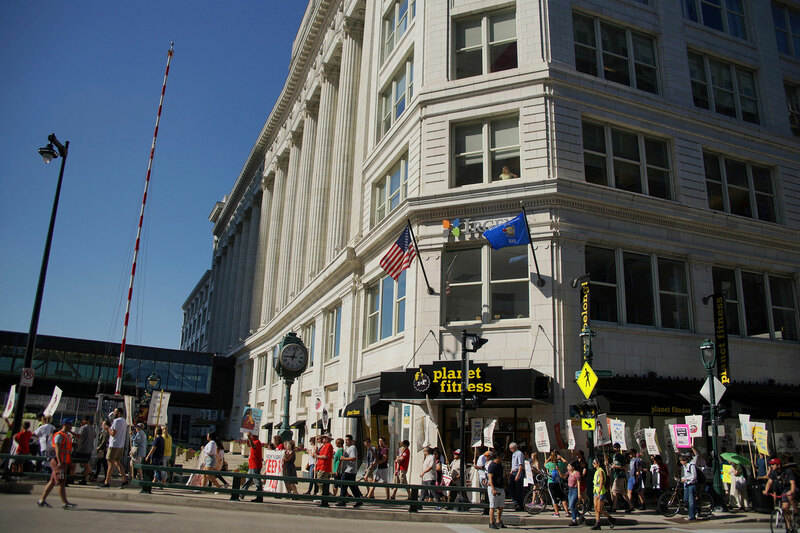 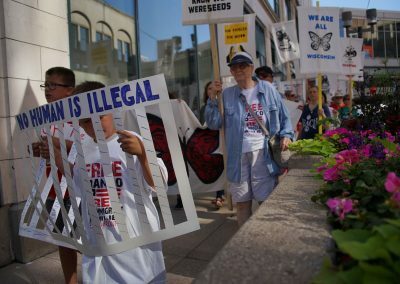 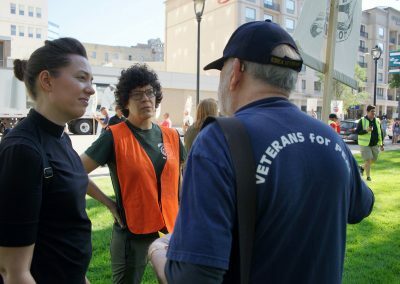 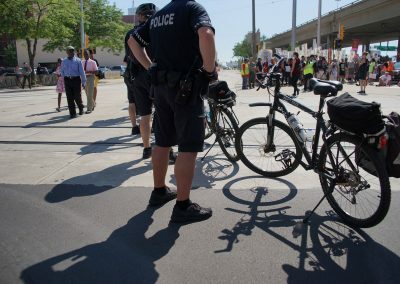 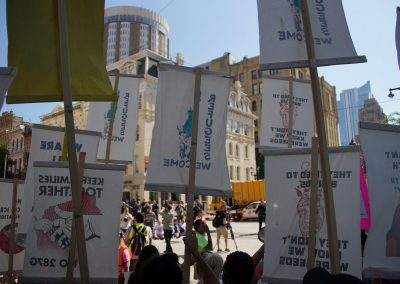 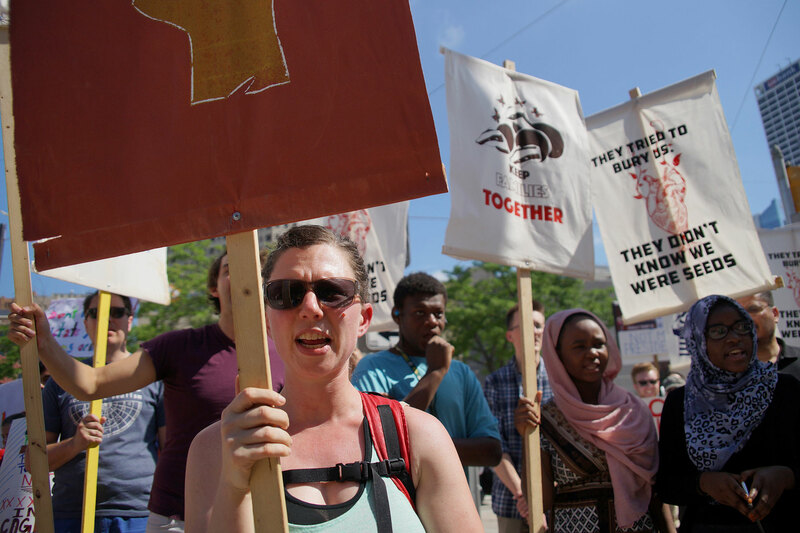 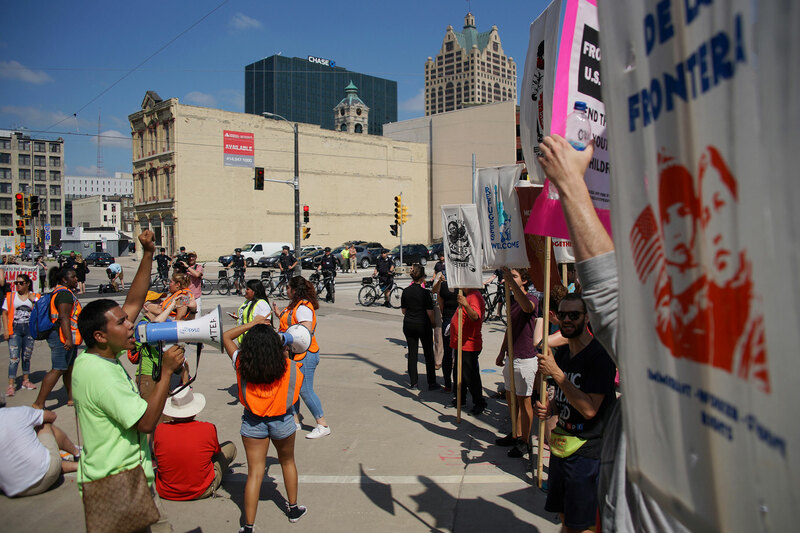 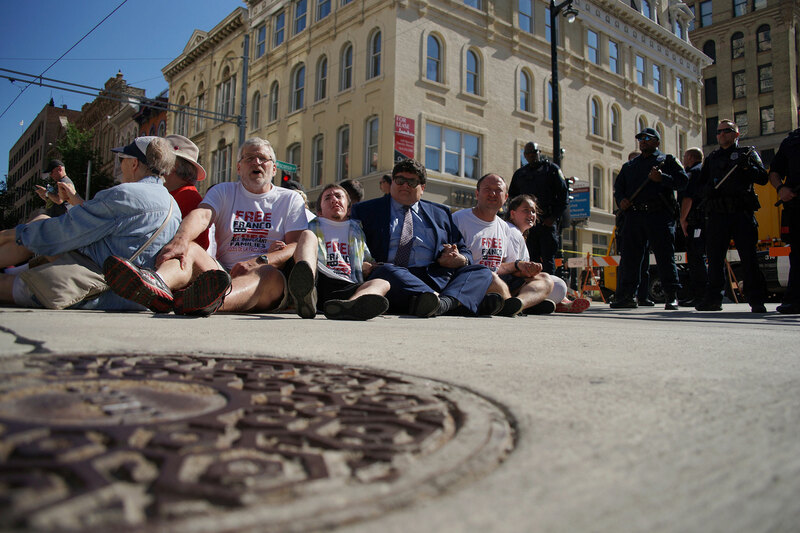 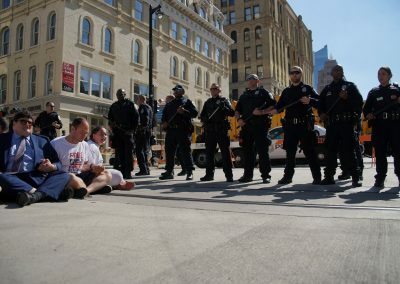 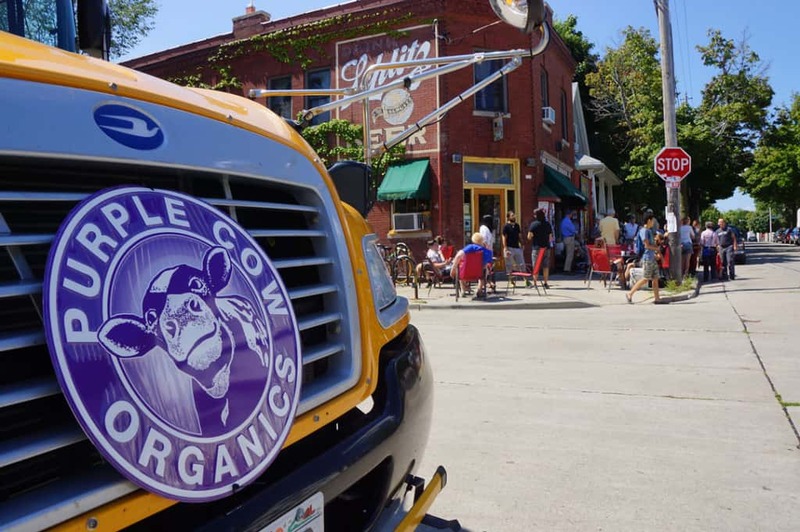 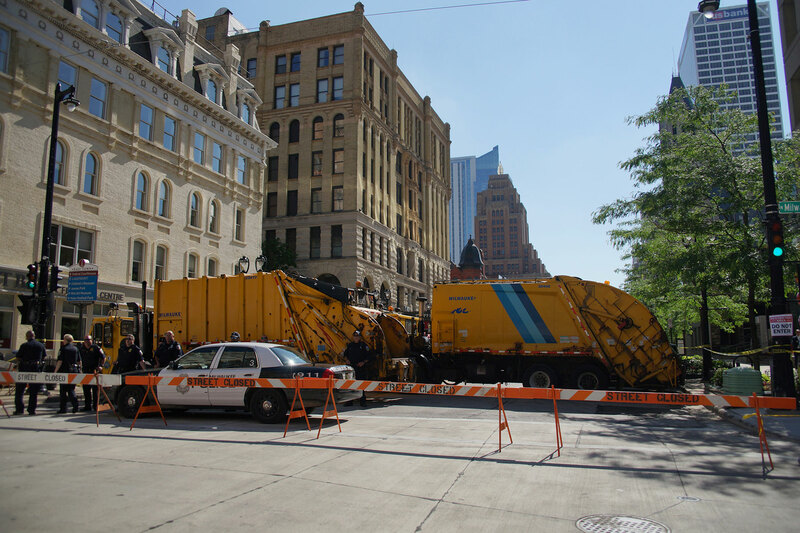 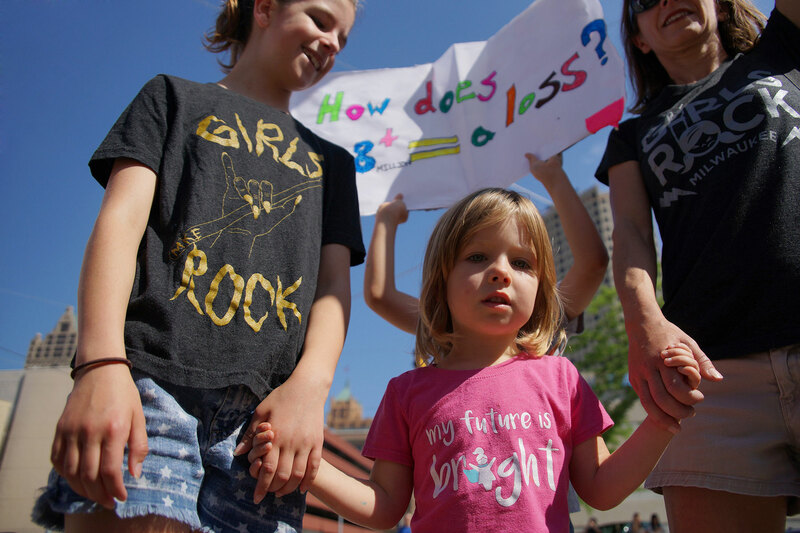 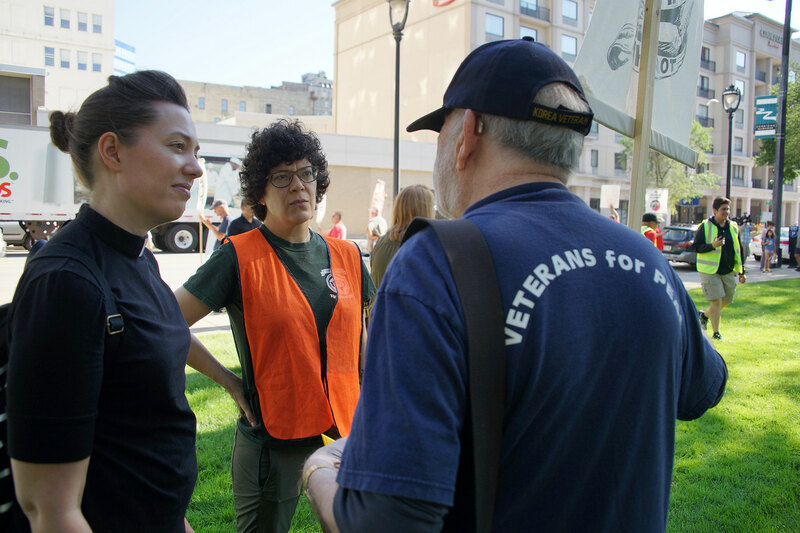 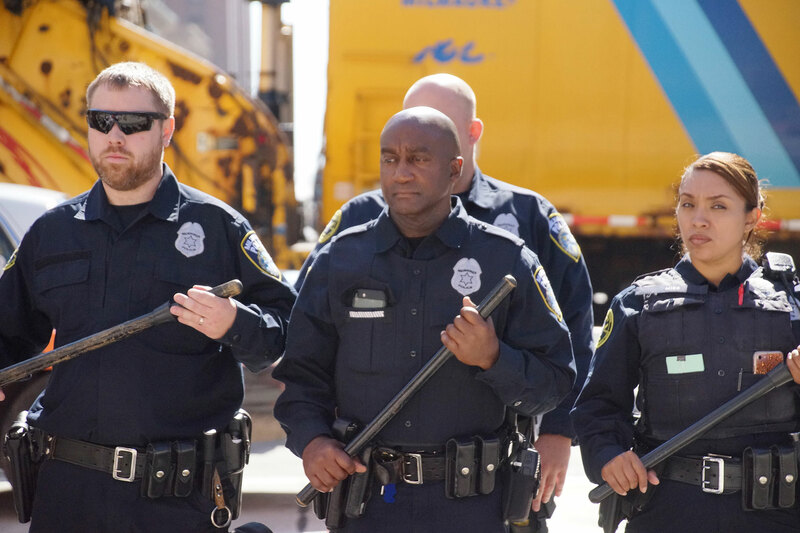 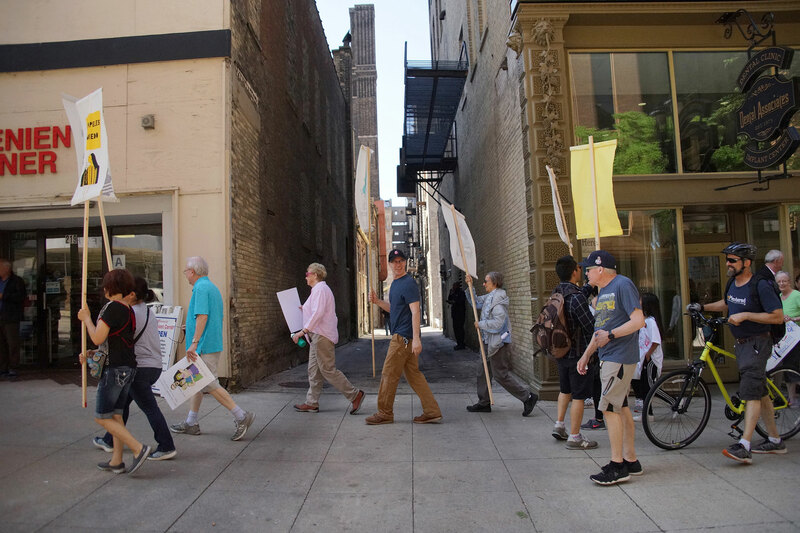 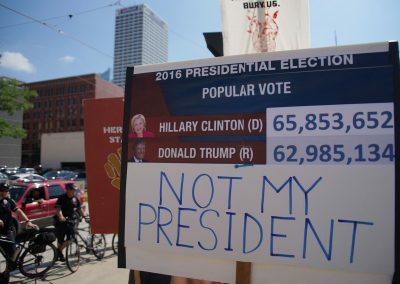 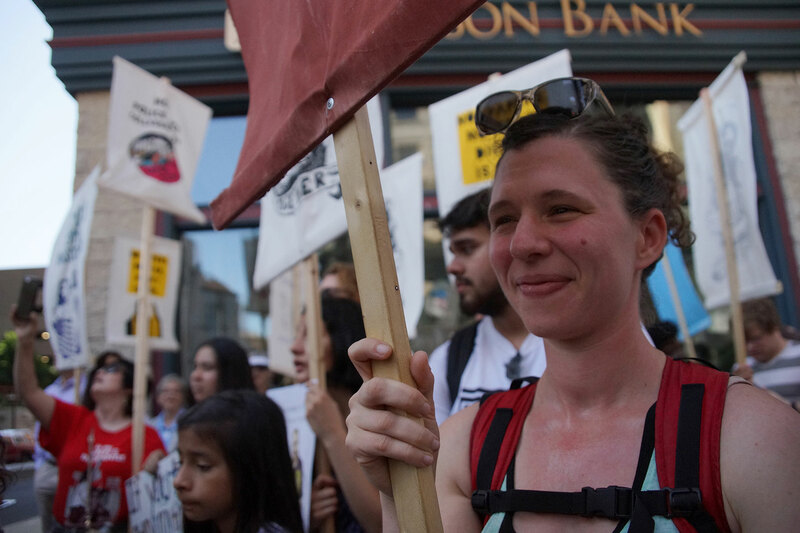 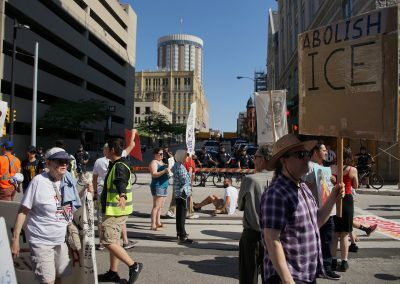 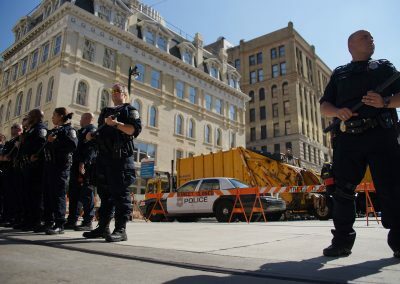 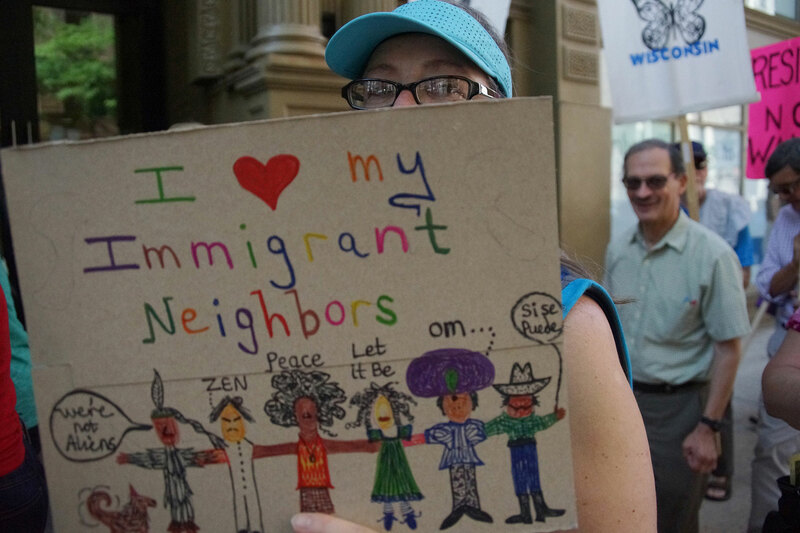 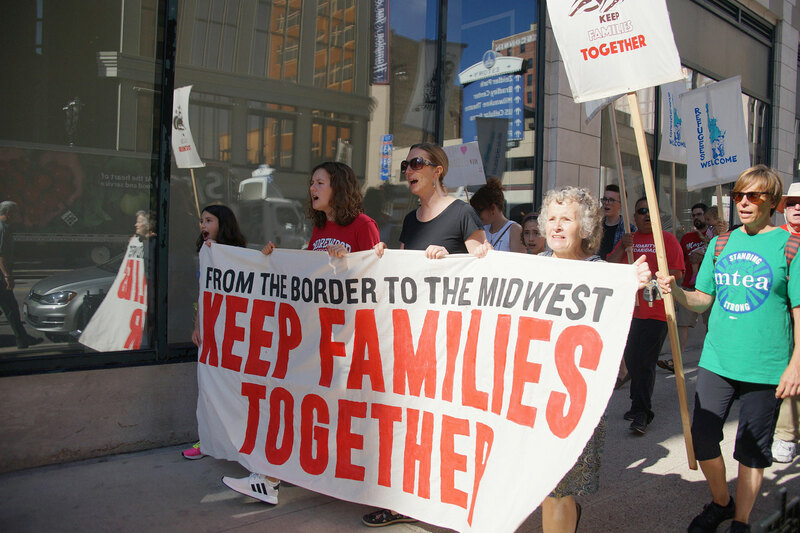 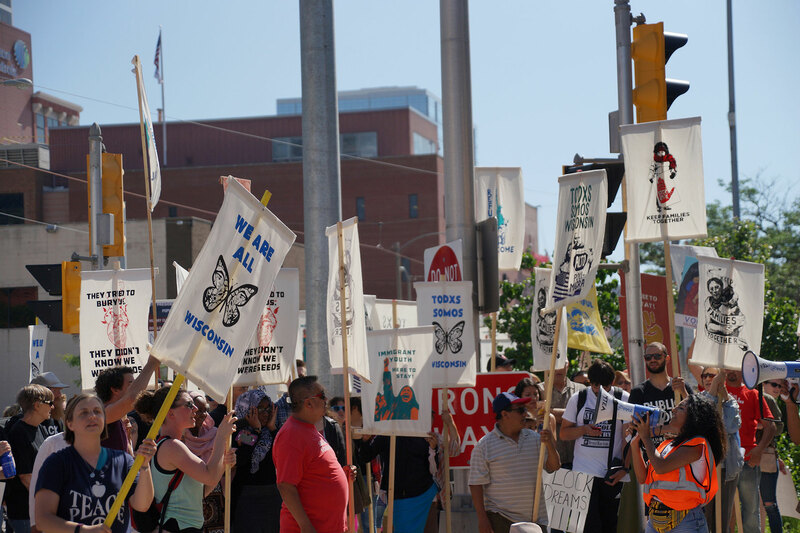 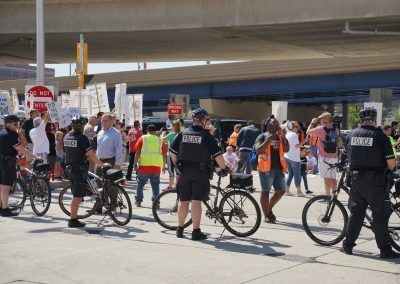 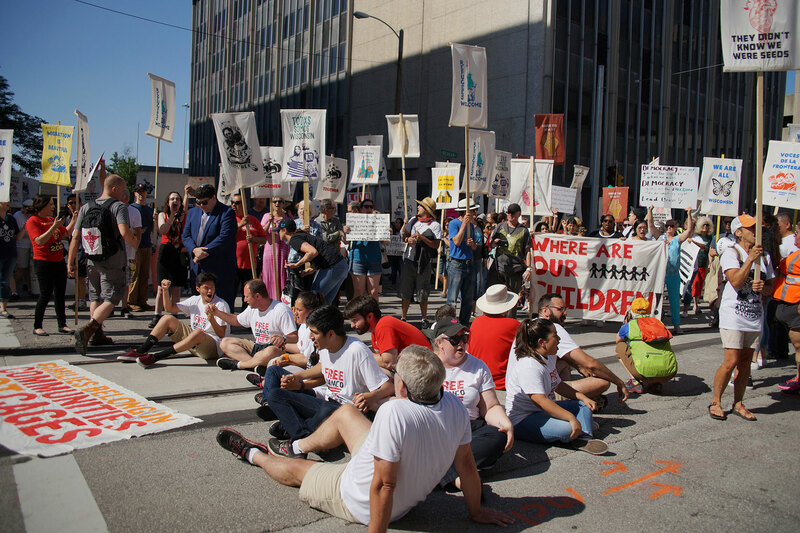 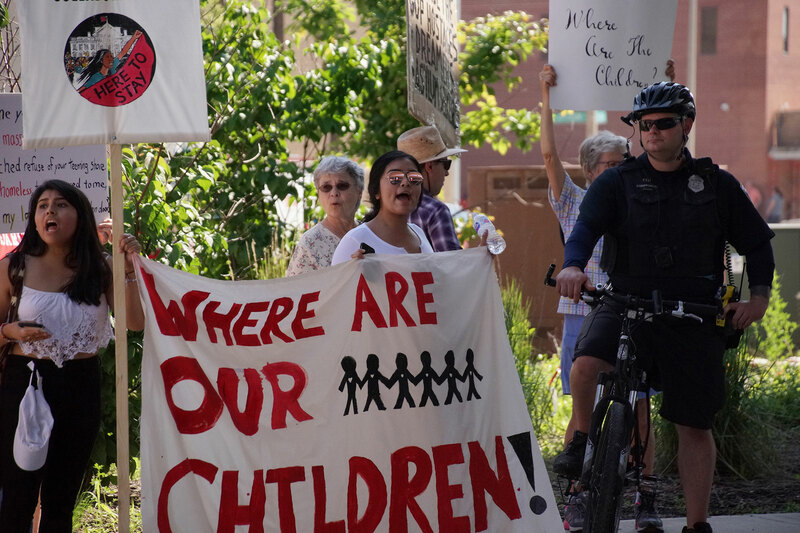 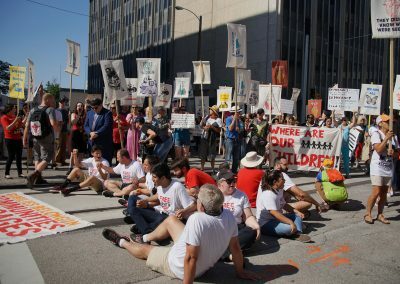 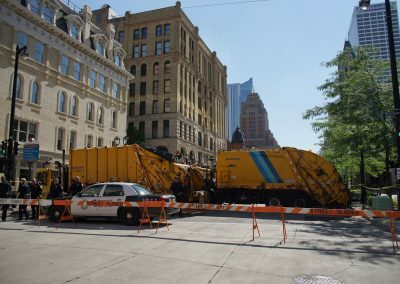 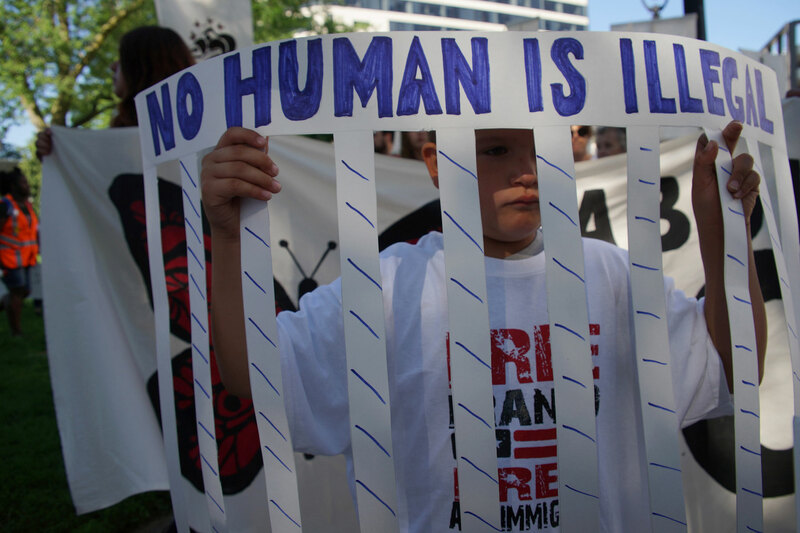 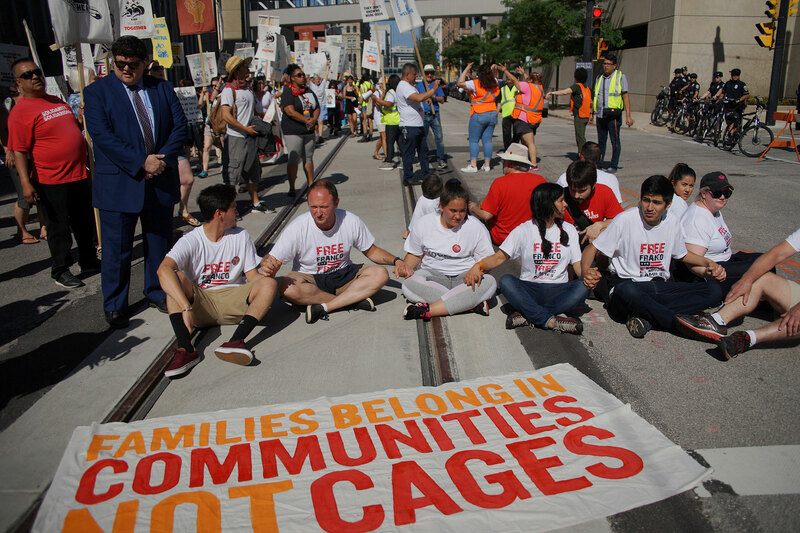 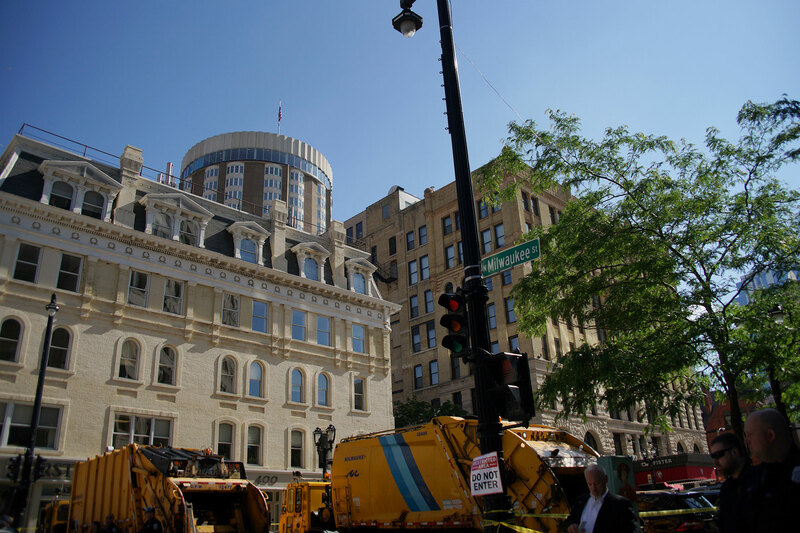 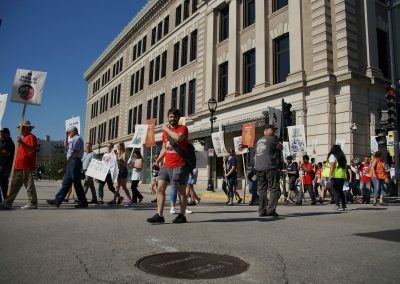 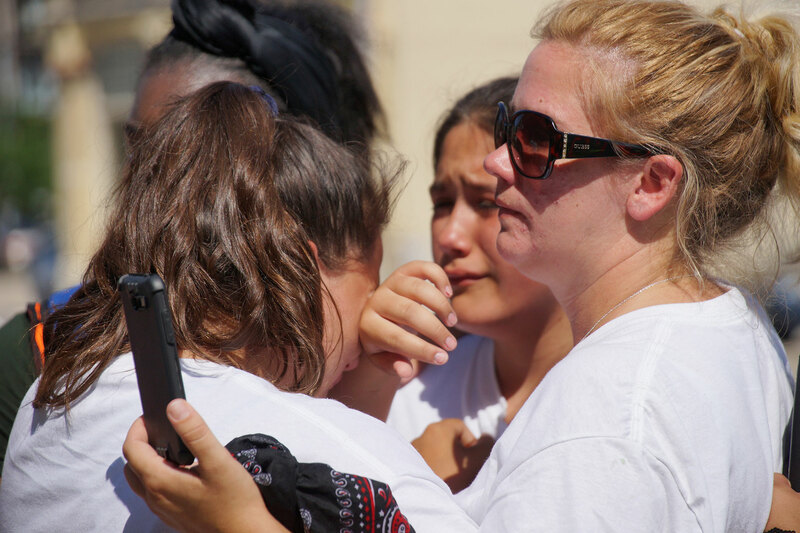 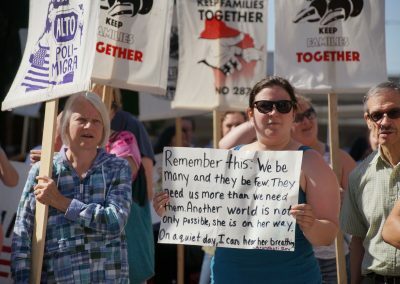 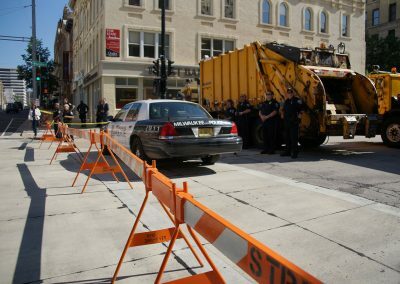 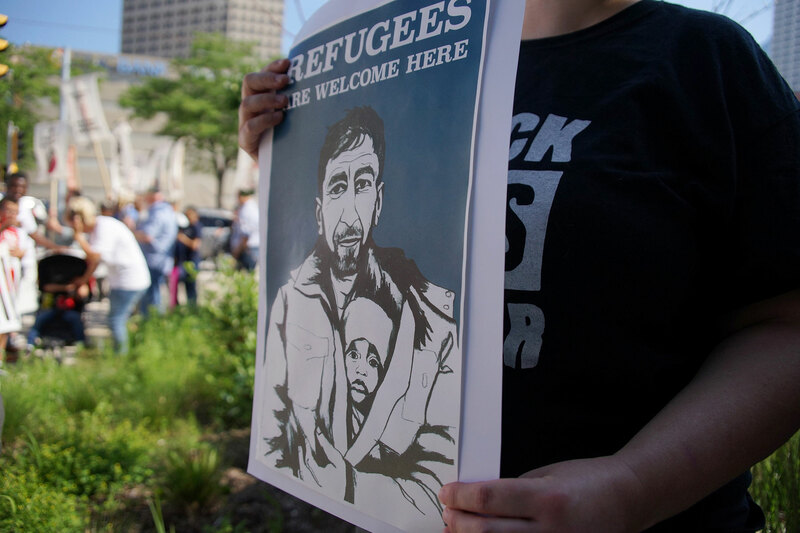 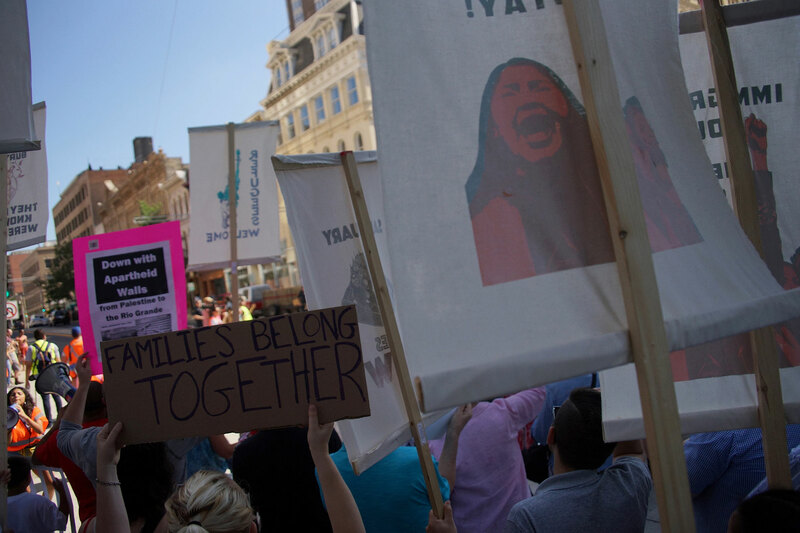 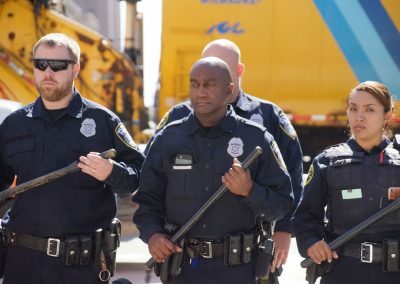 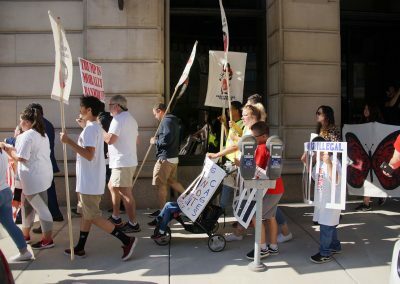 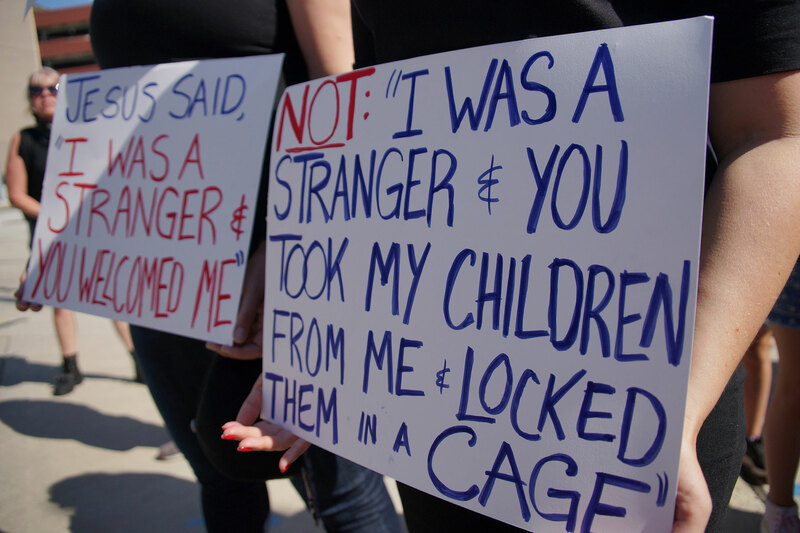 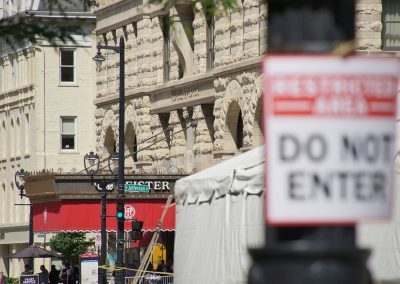 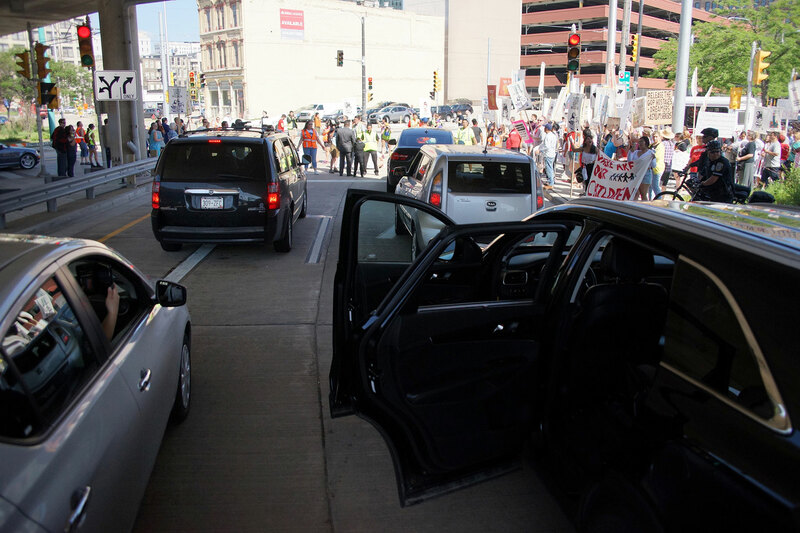 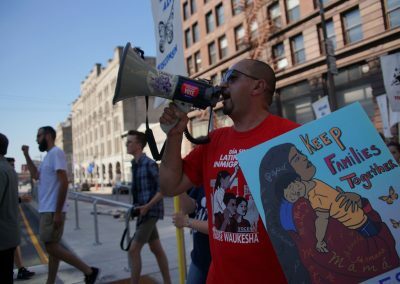 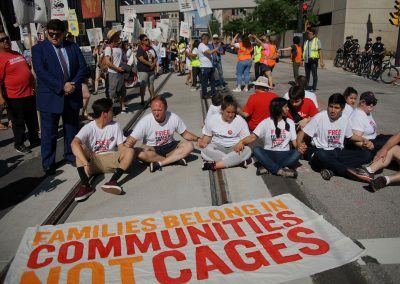 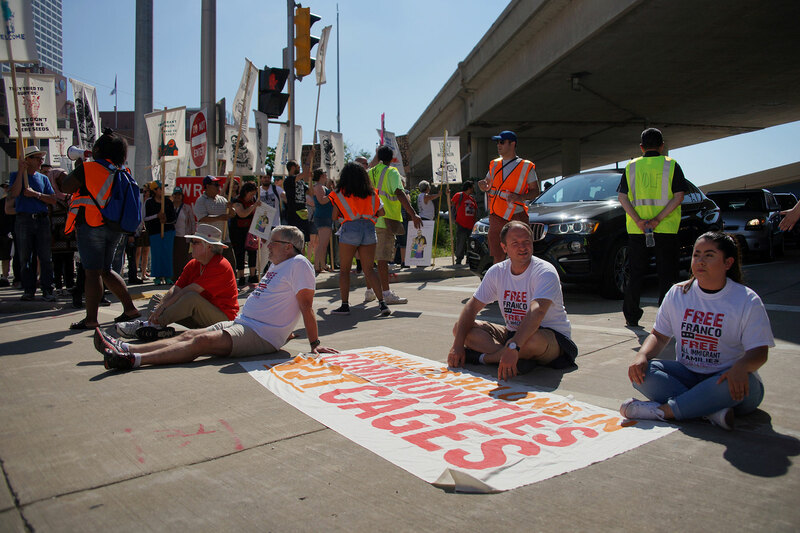 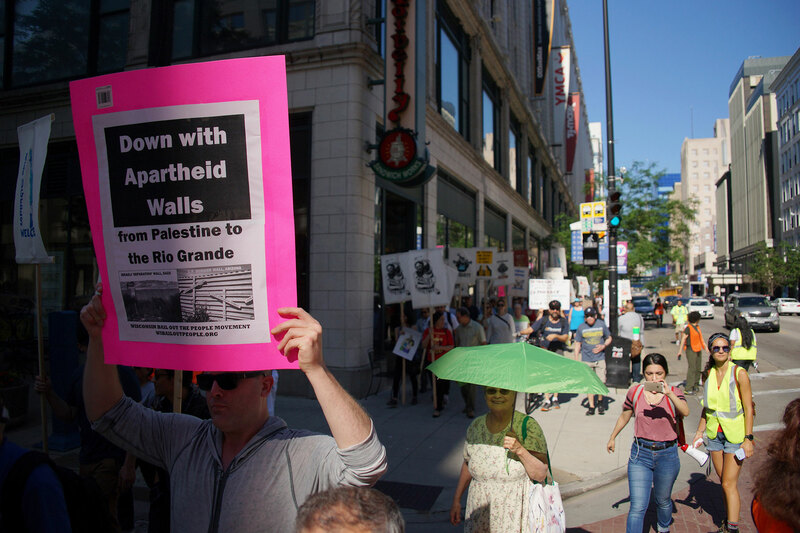 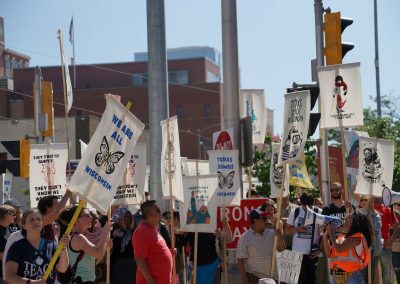 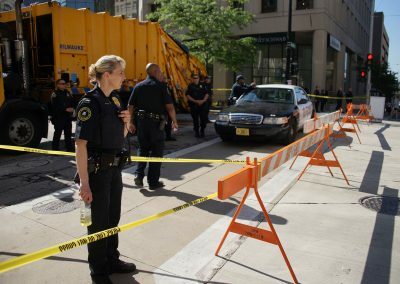 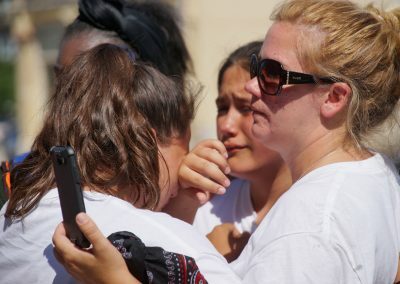 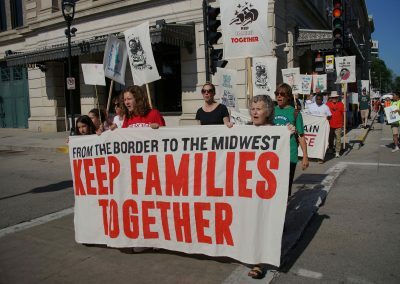 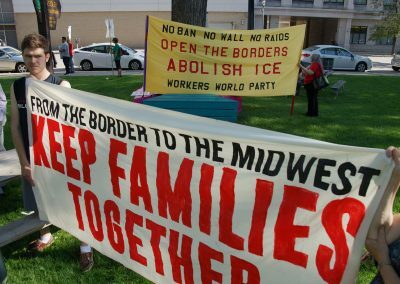 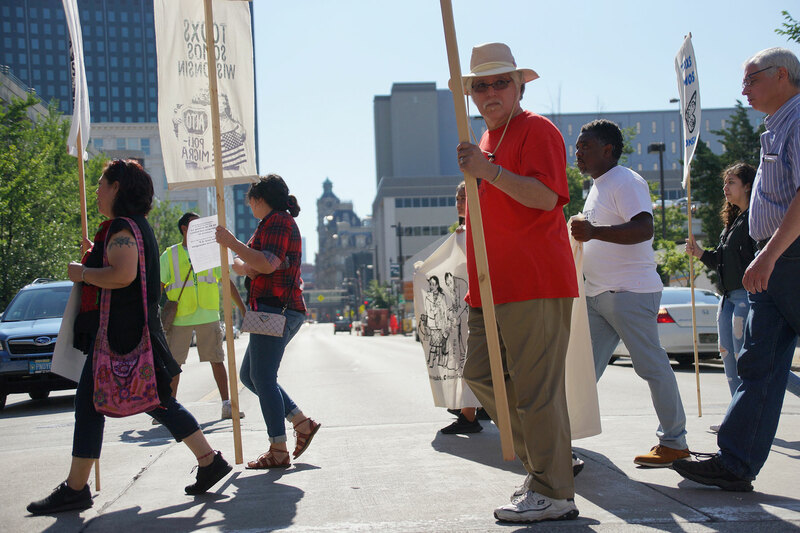 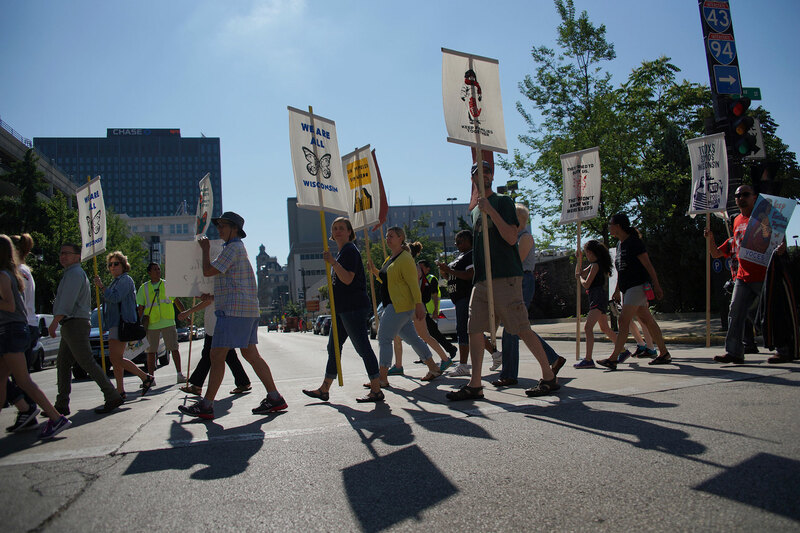 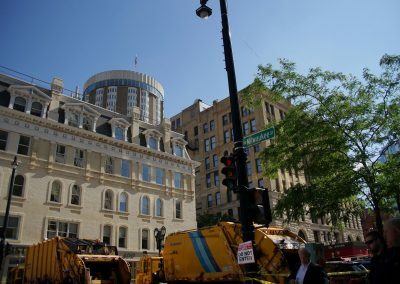 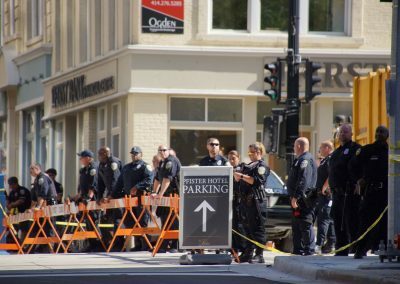 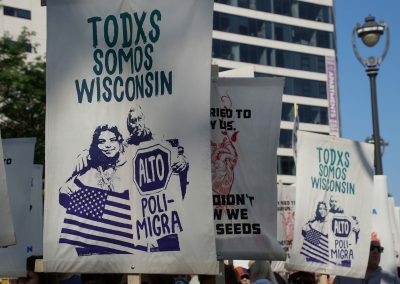 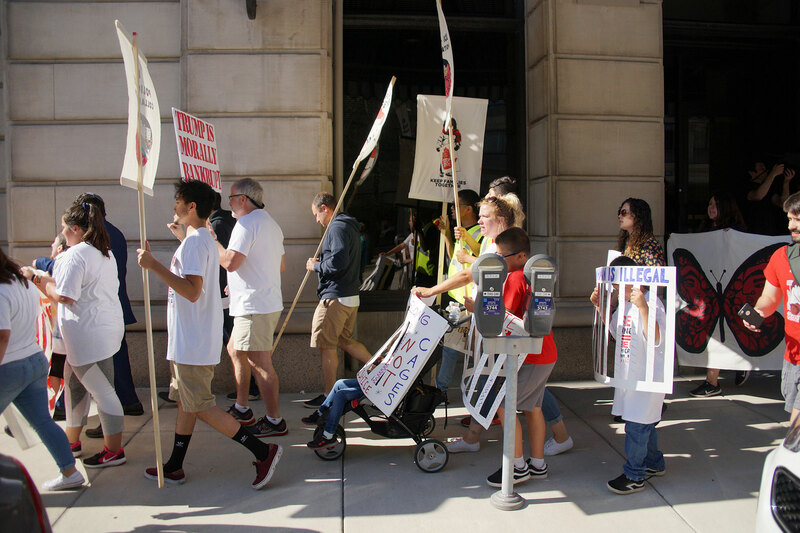 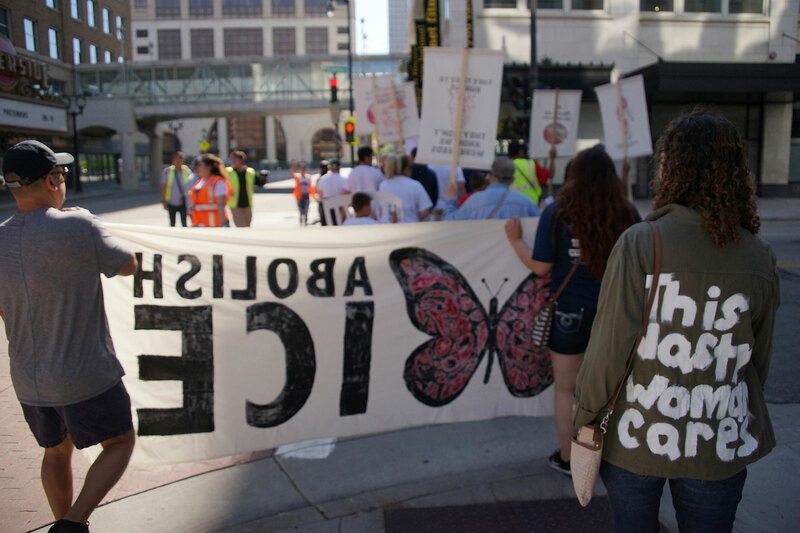 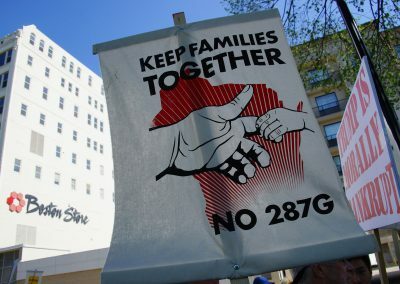 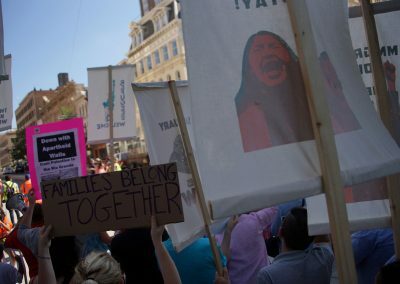 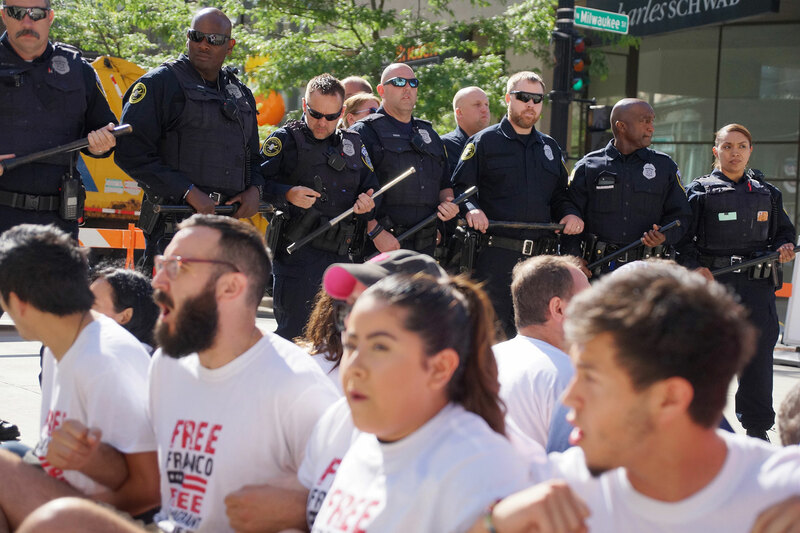 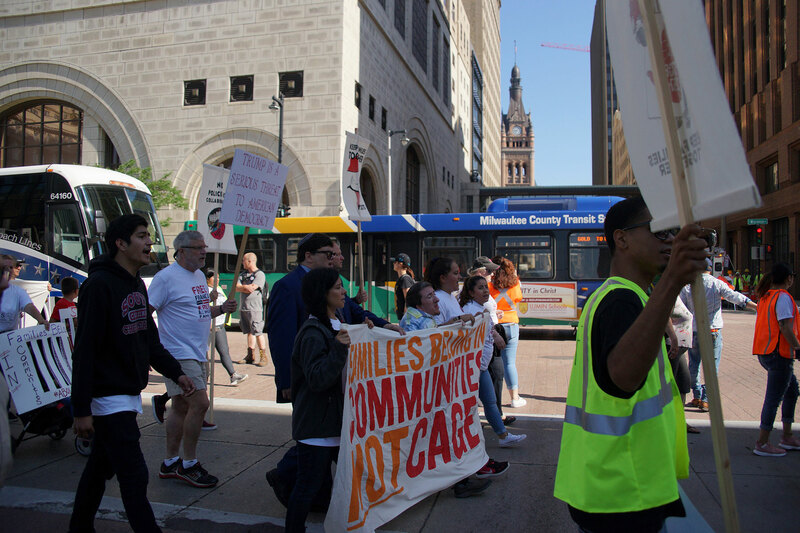 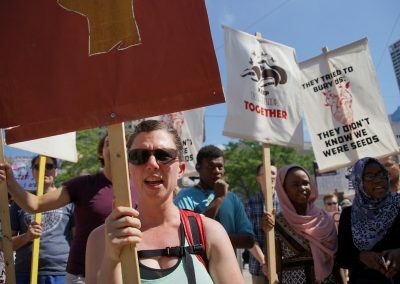 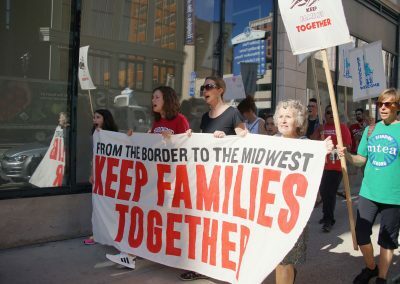 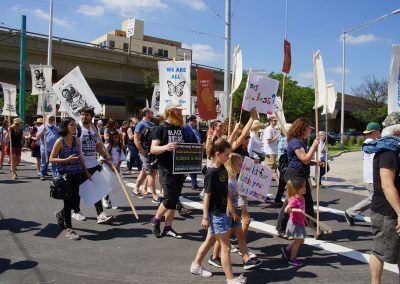 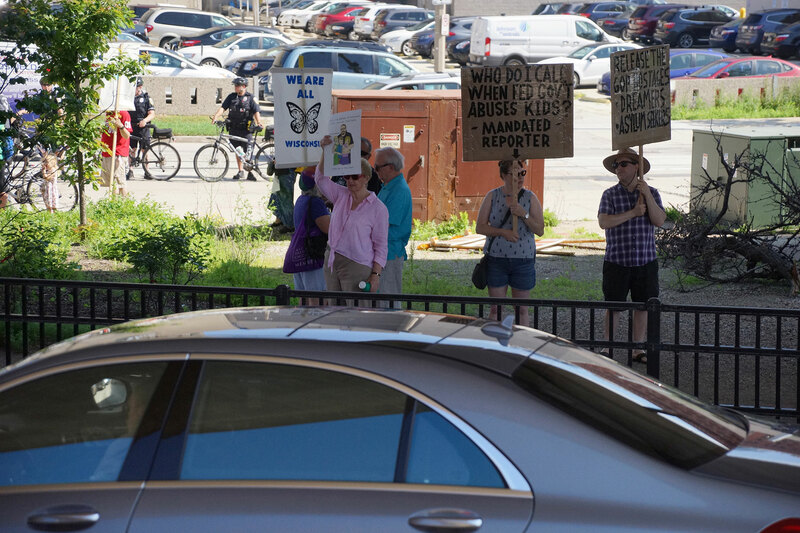 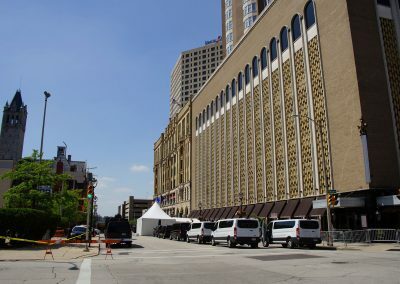 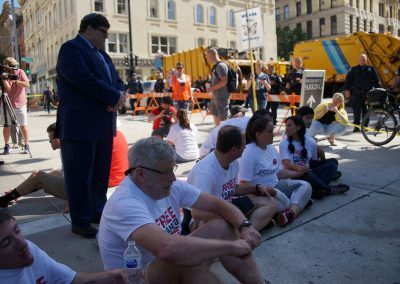 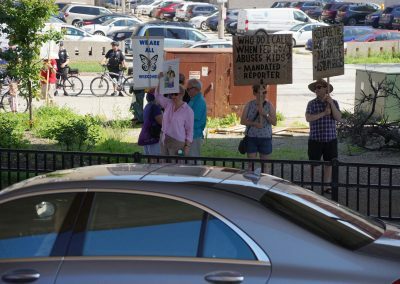 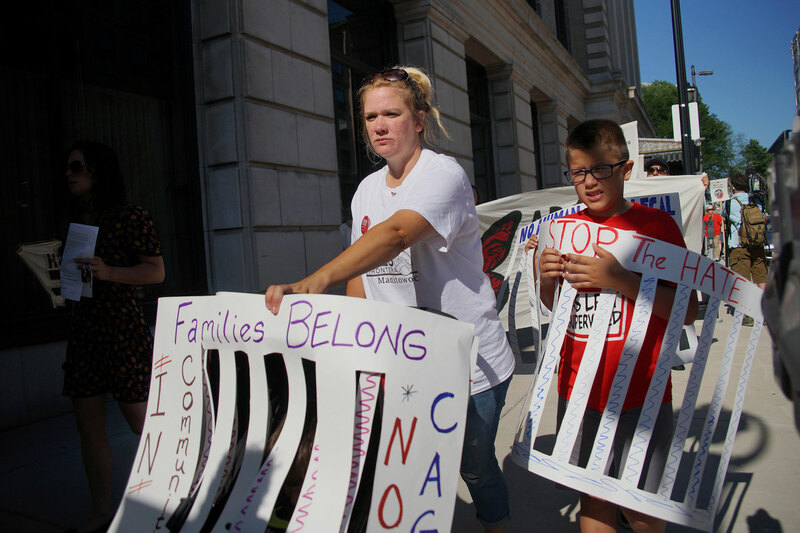 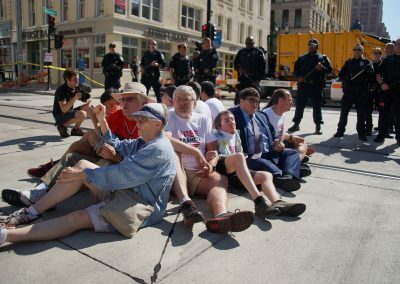 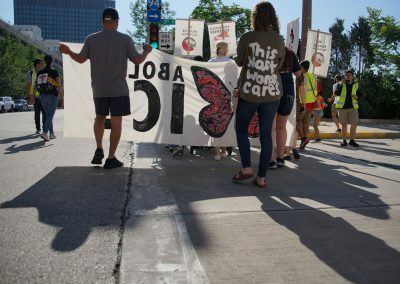 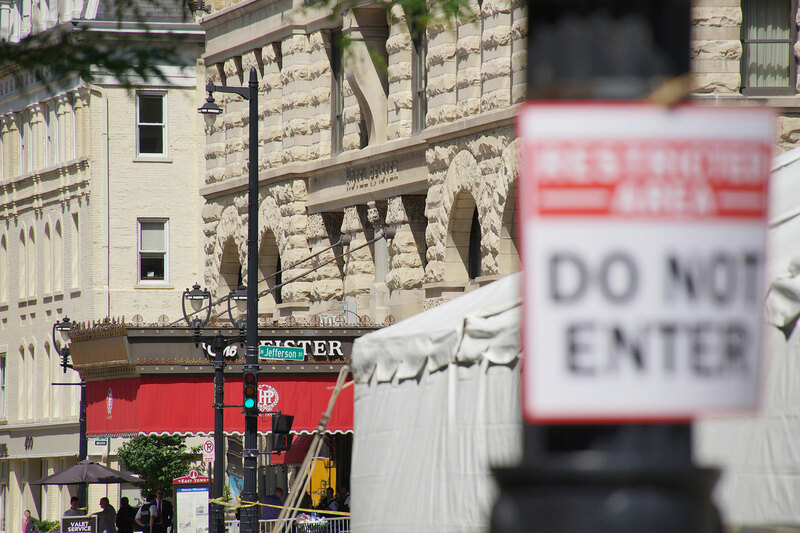 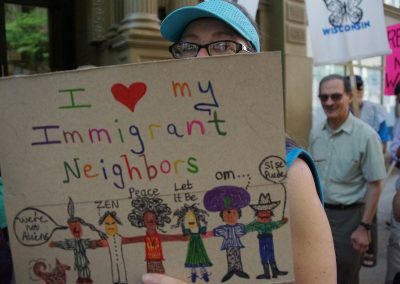 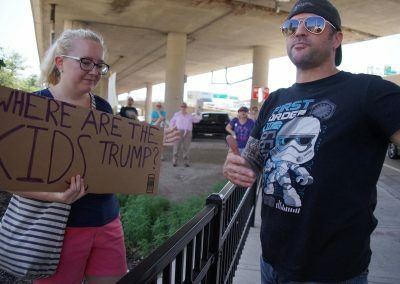 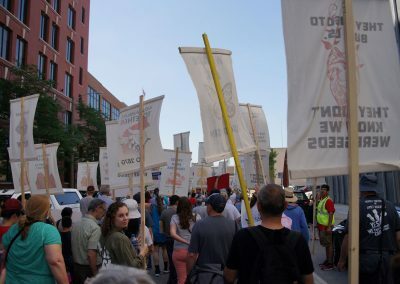 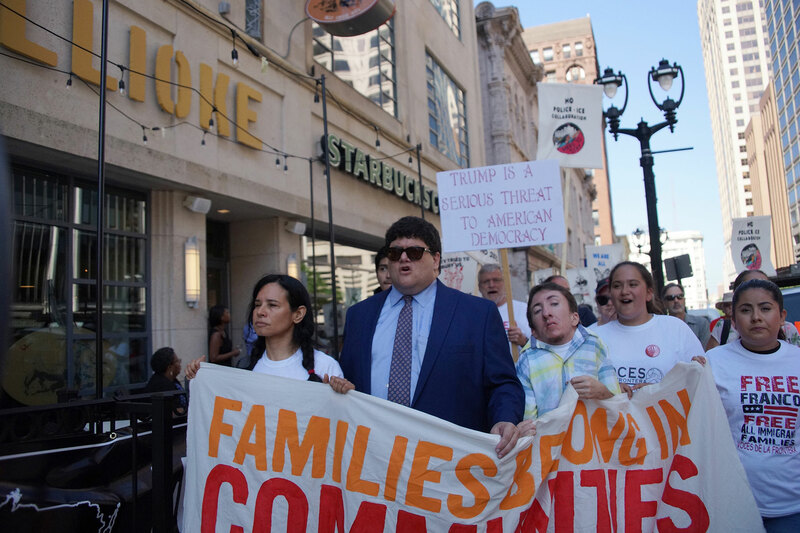 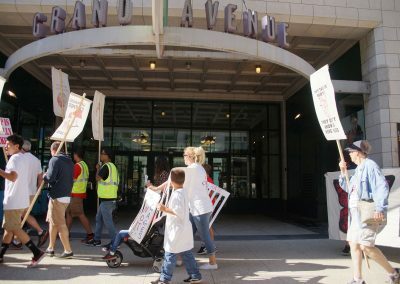 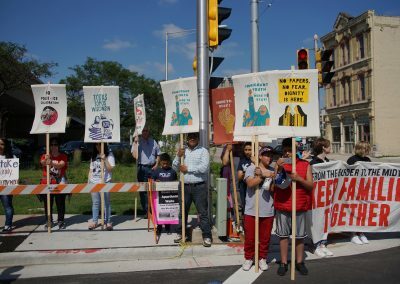 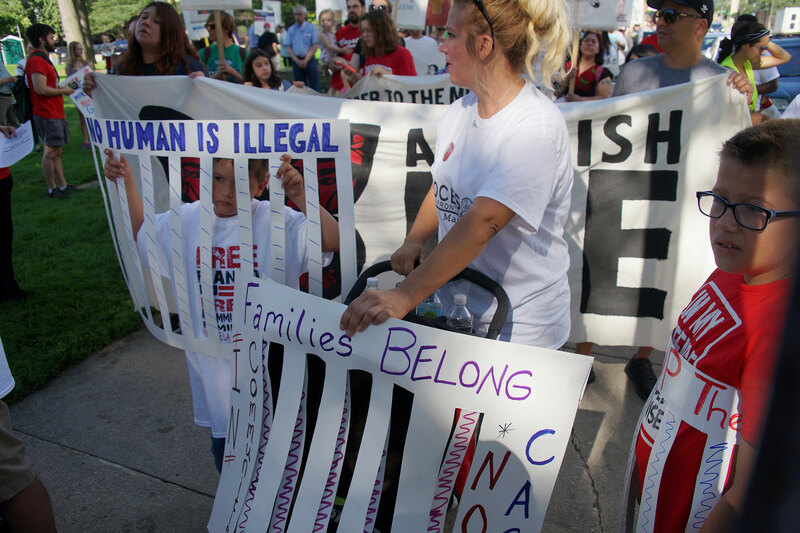 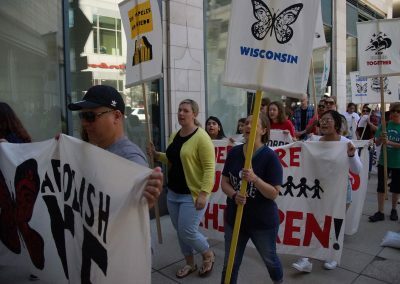 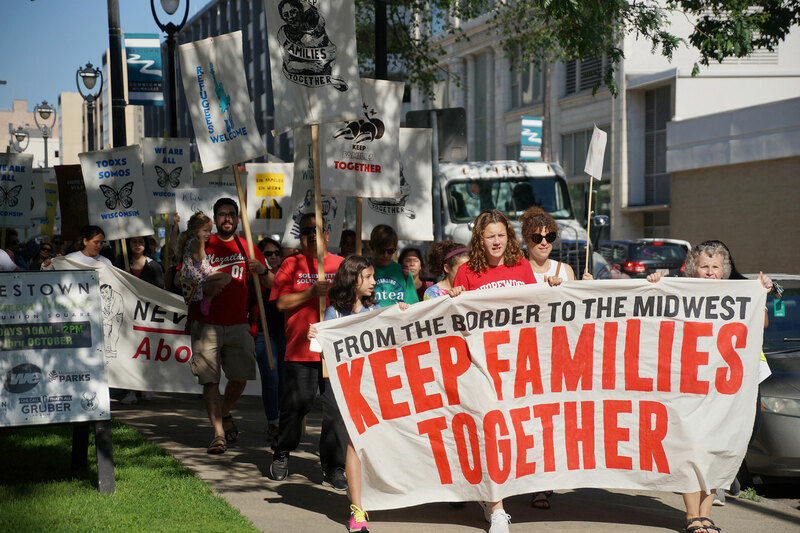 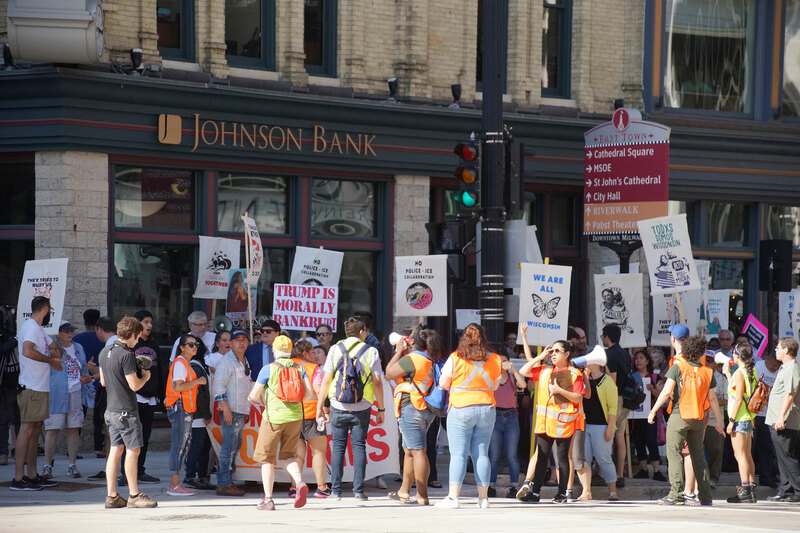 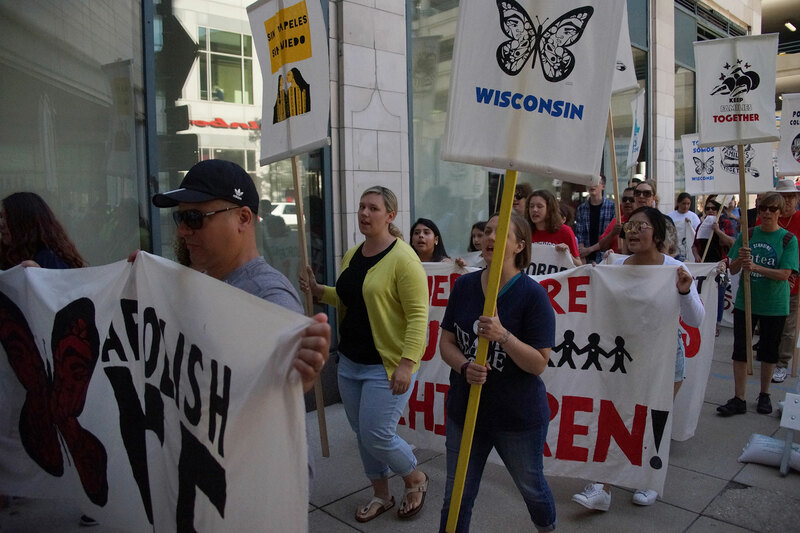 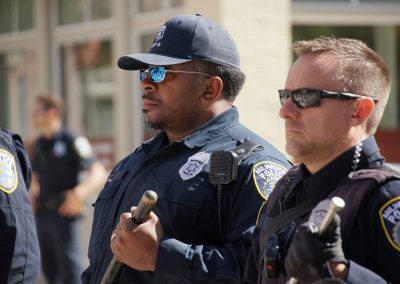 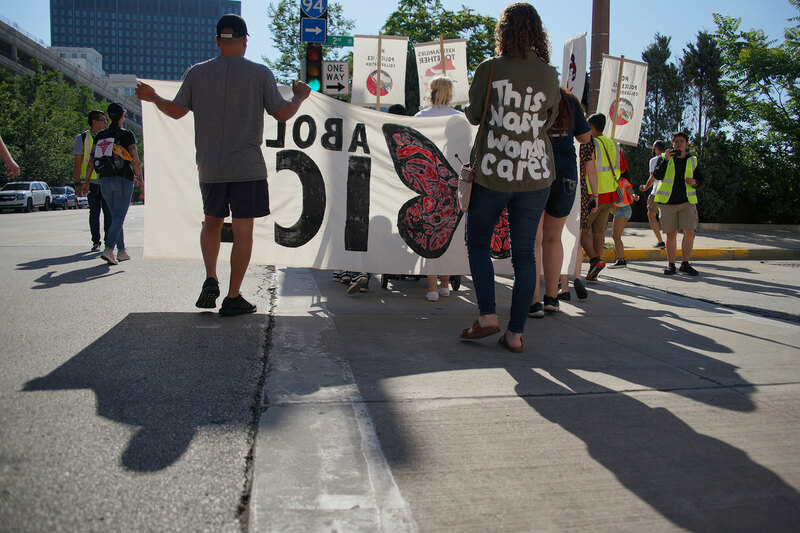 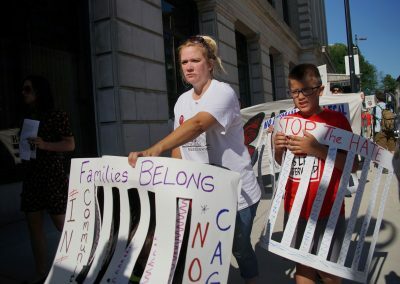 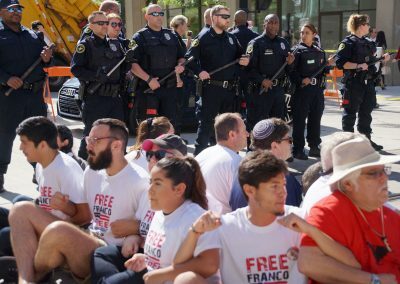 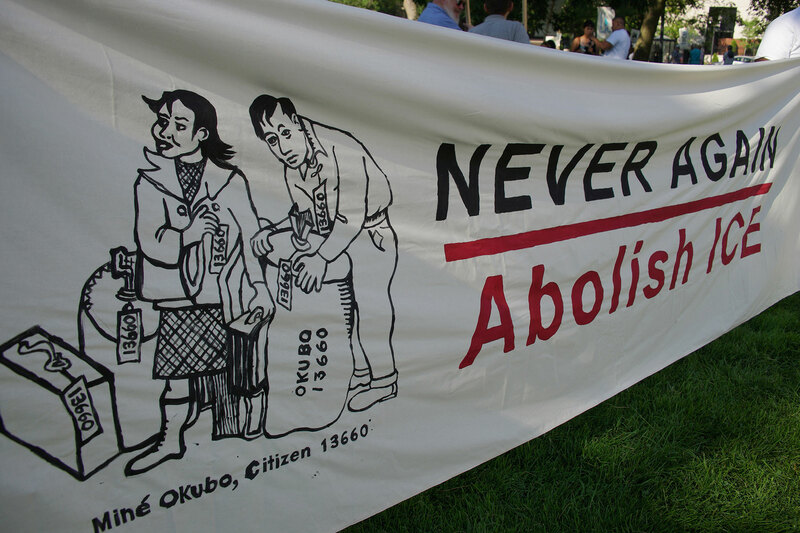 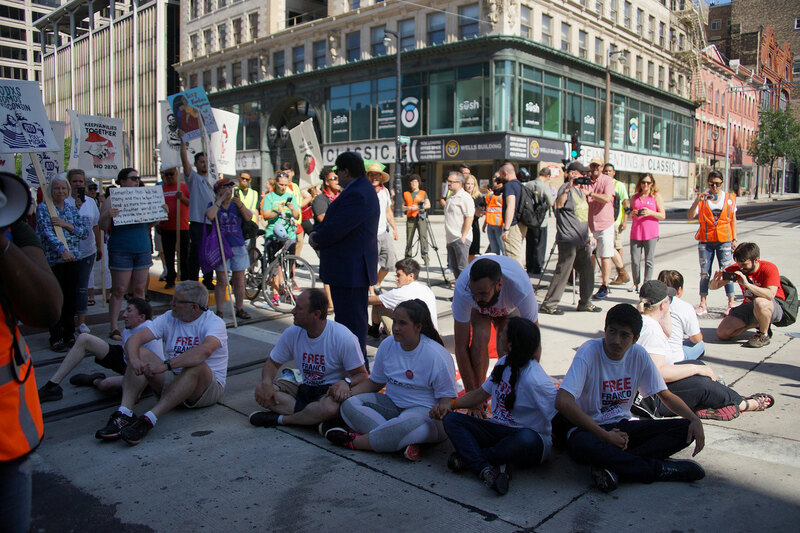 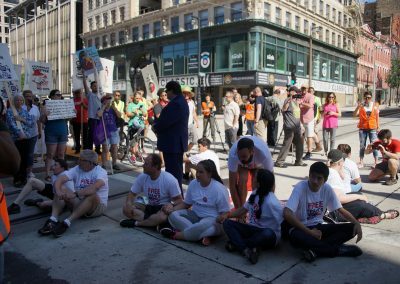 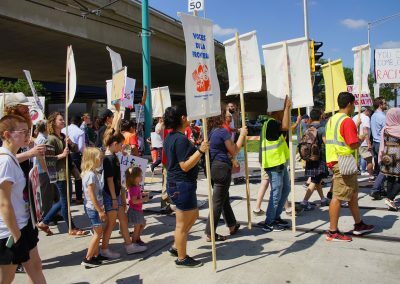 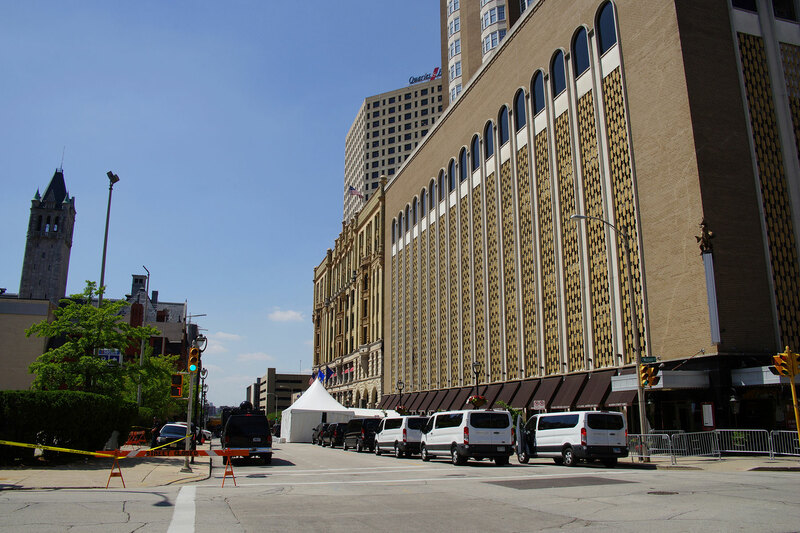 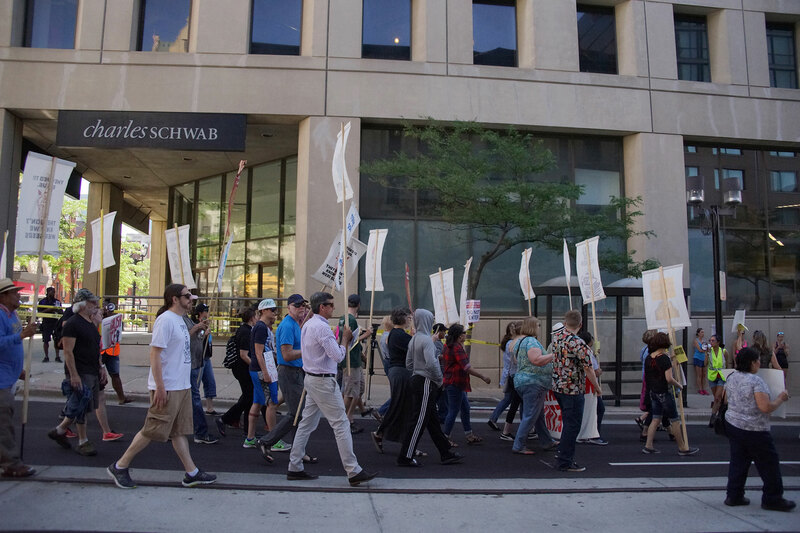 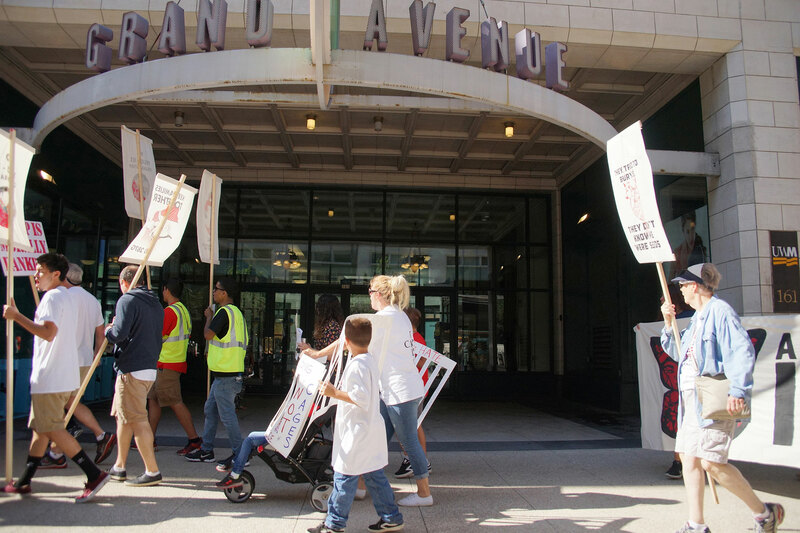 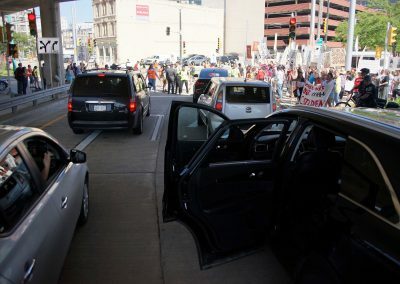 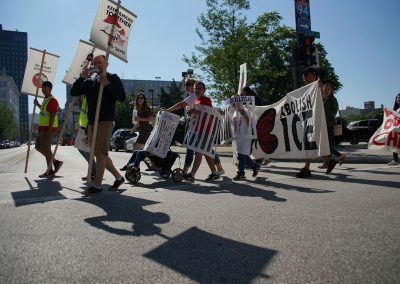 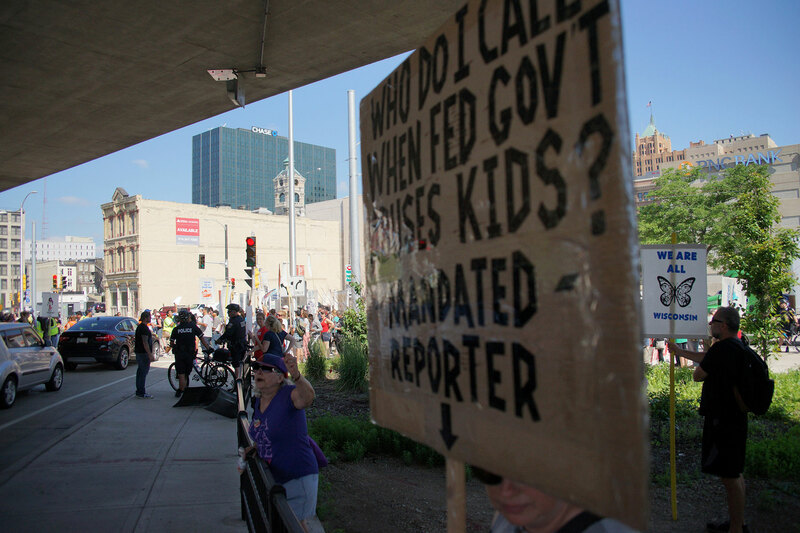 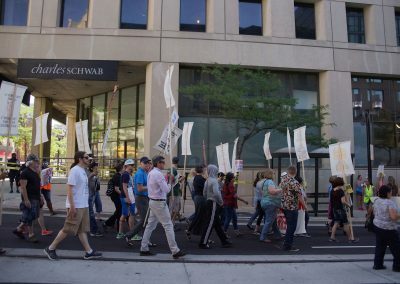 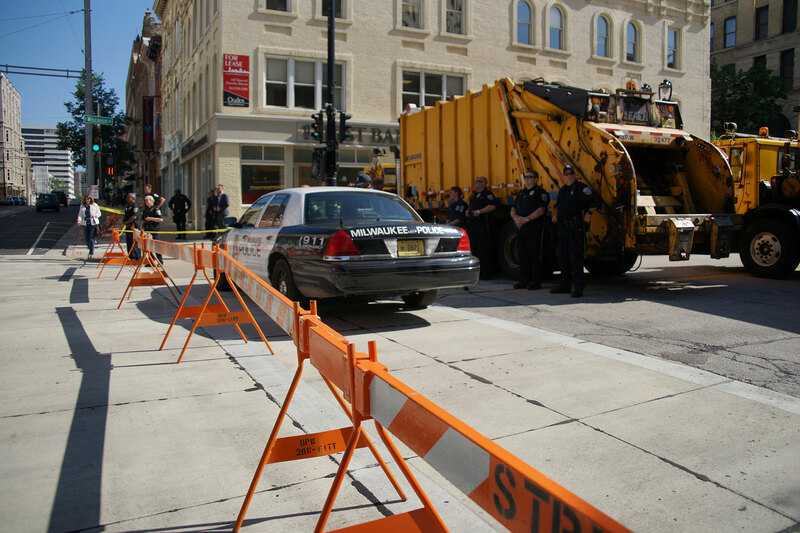 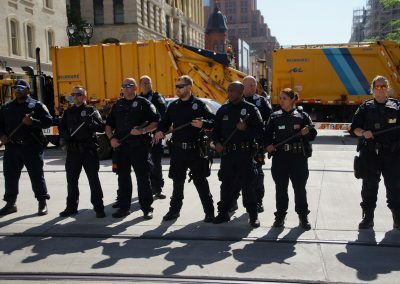 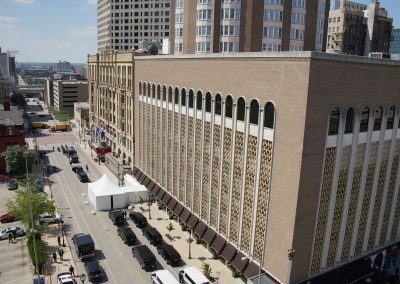 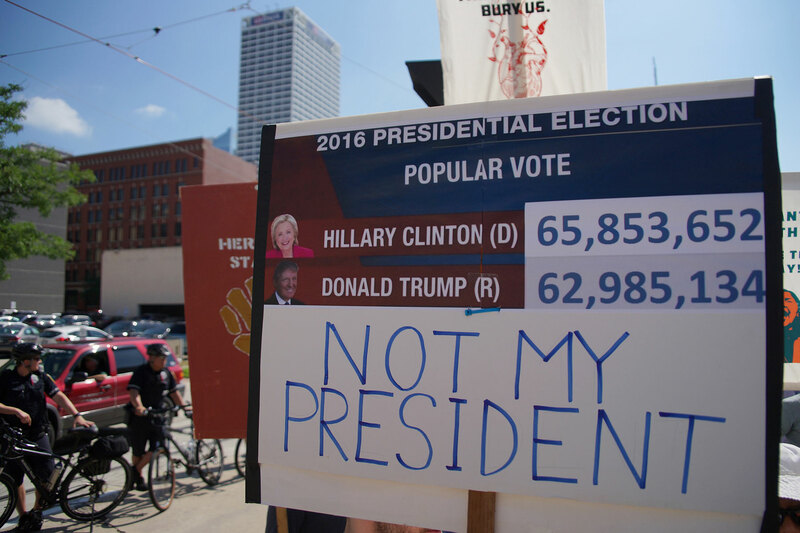 Hundreds of people marched and blocked streets around a fundraiser Donald Trump held for Wisconsin Republicans, in protest of his plans to intern tens of thousands of immigrant families in border camps on June 28. 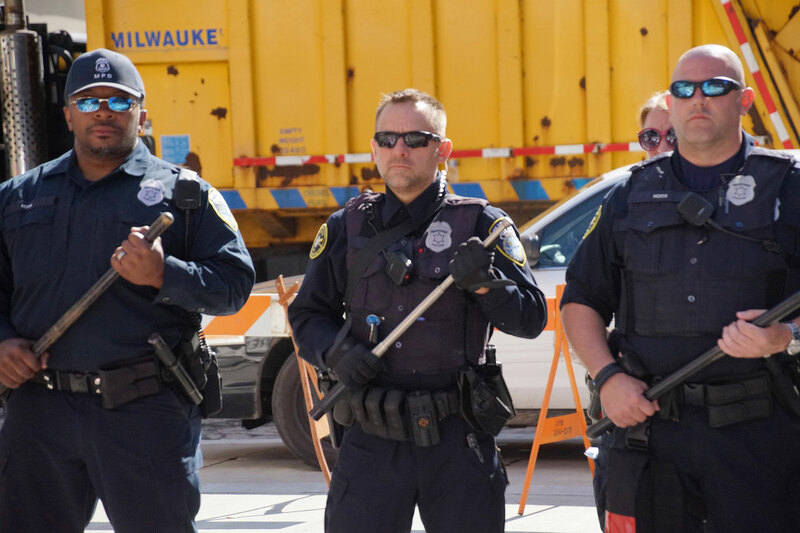 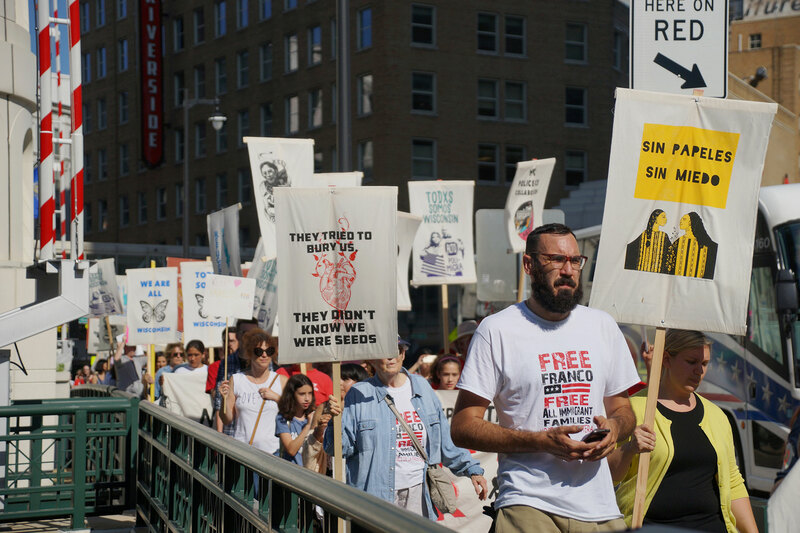 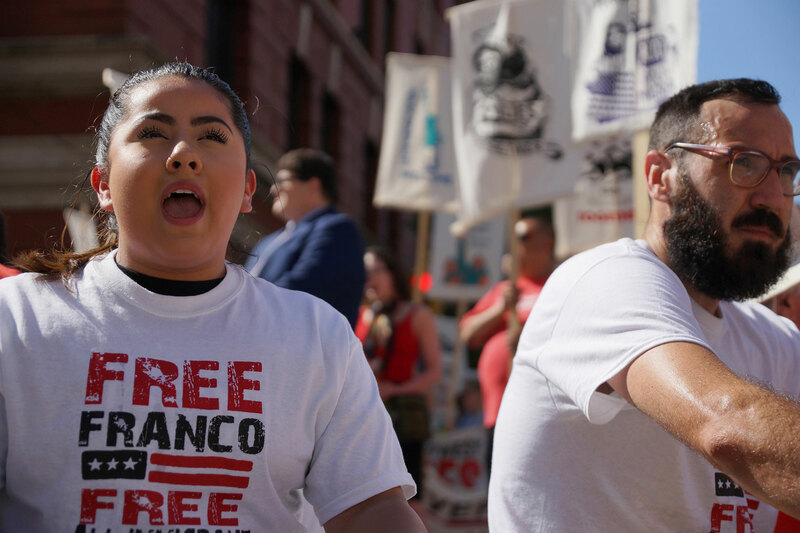 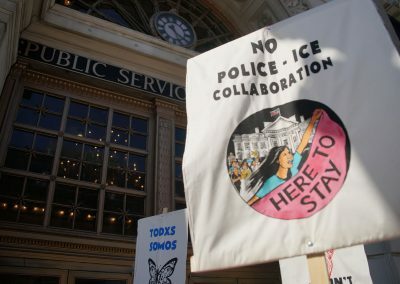 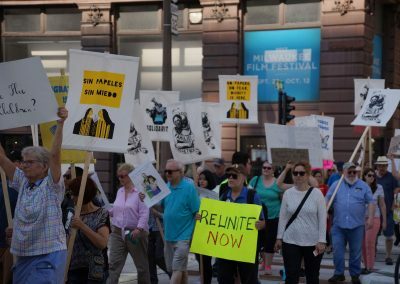 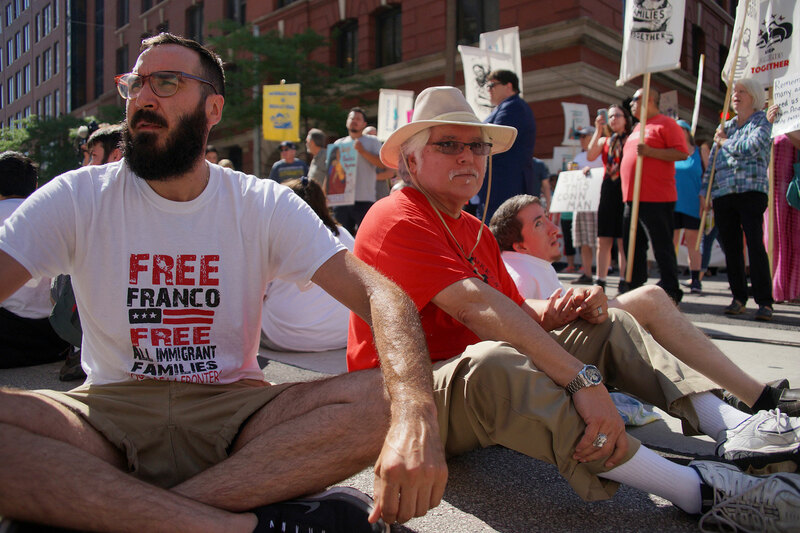 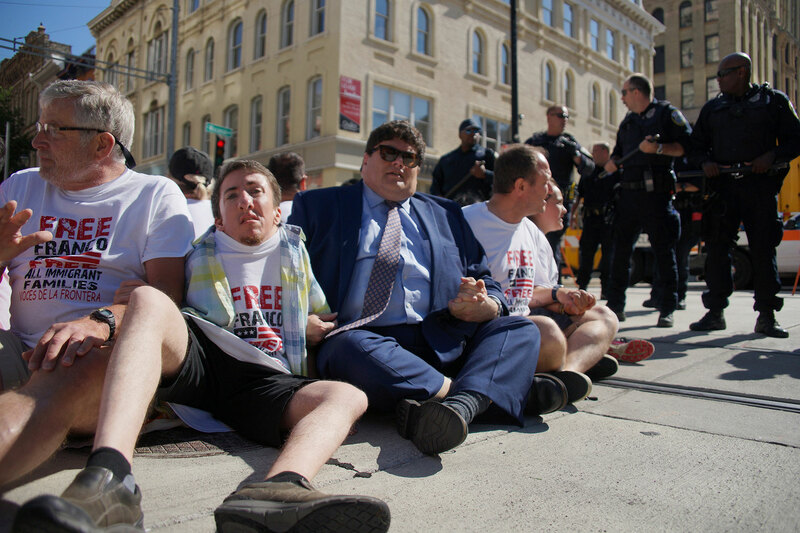 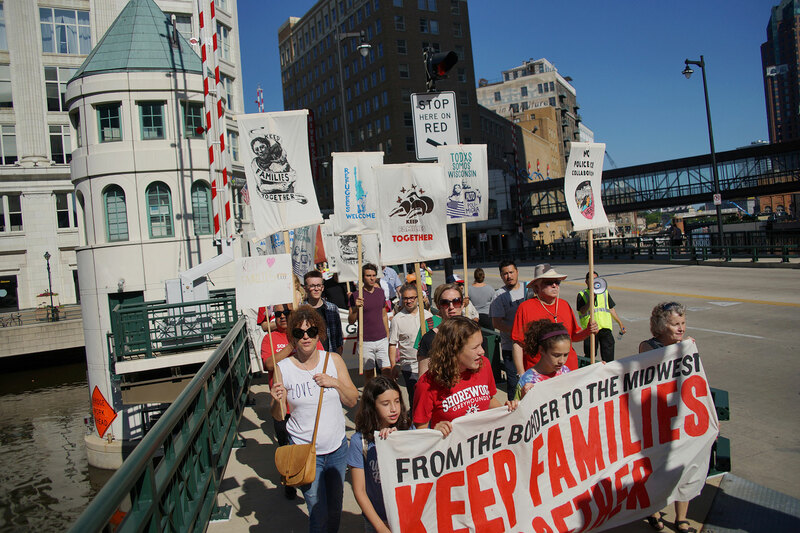 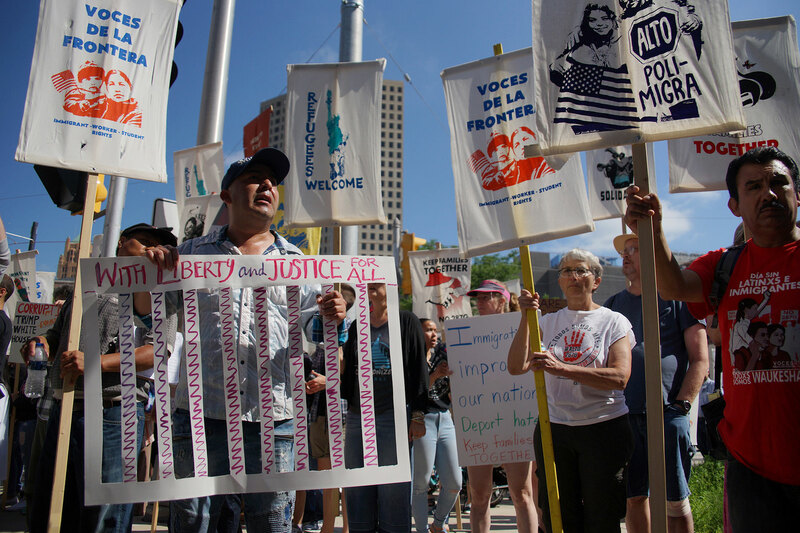 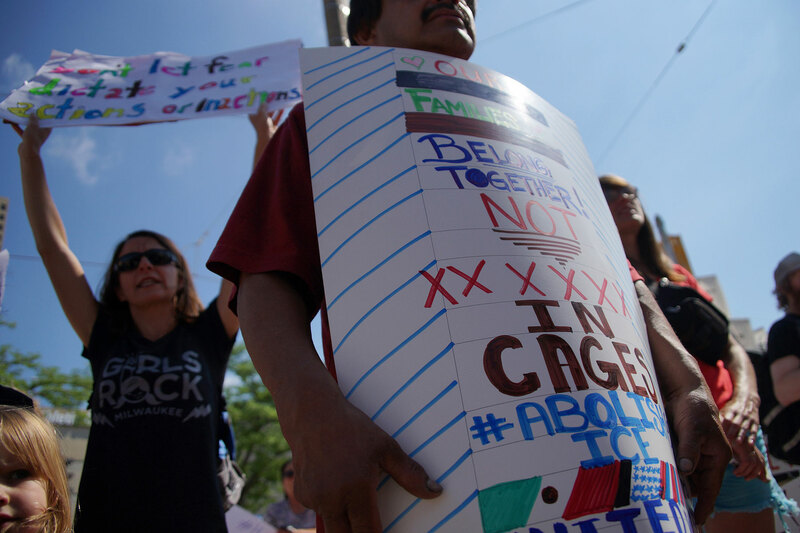 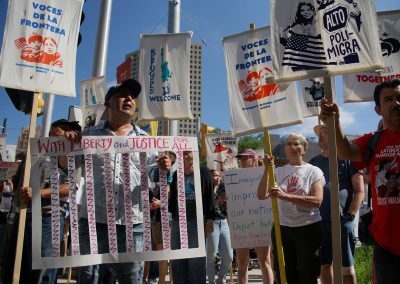 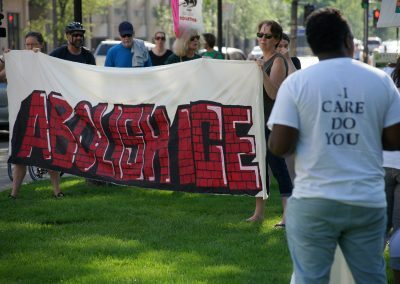 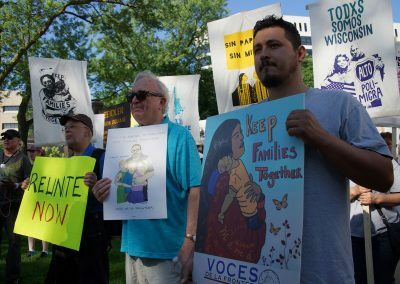 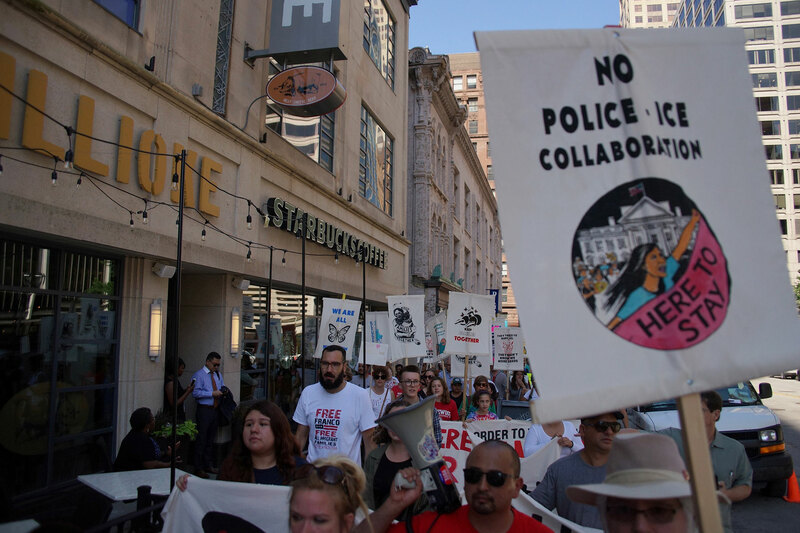 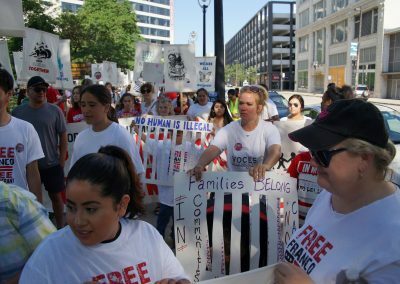 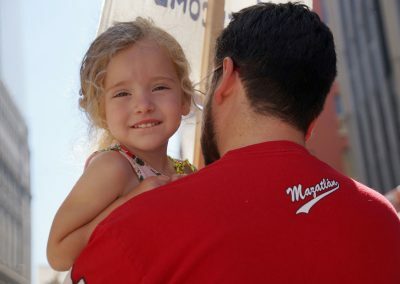 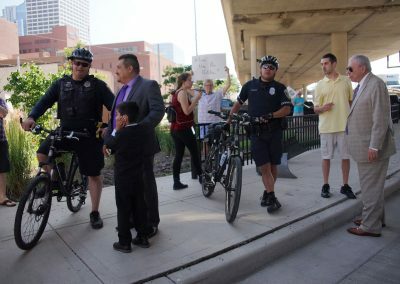 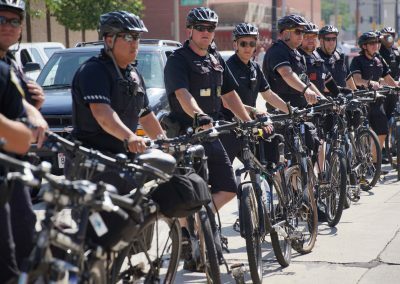 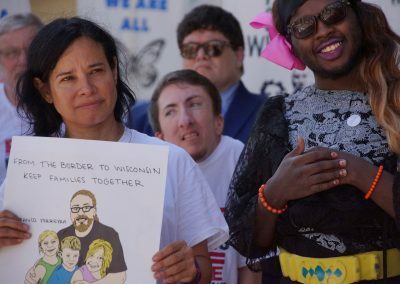 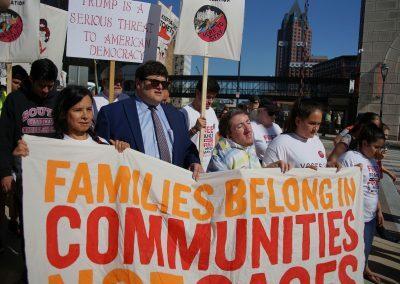 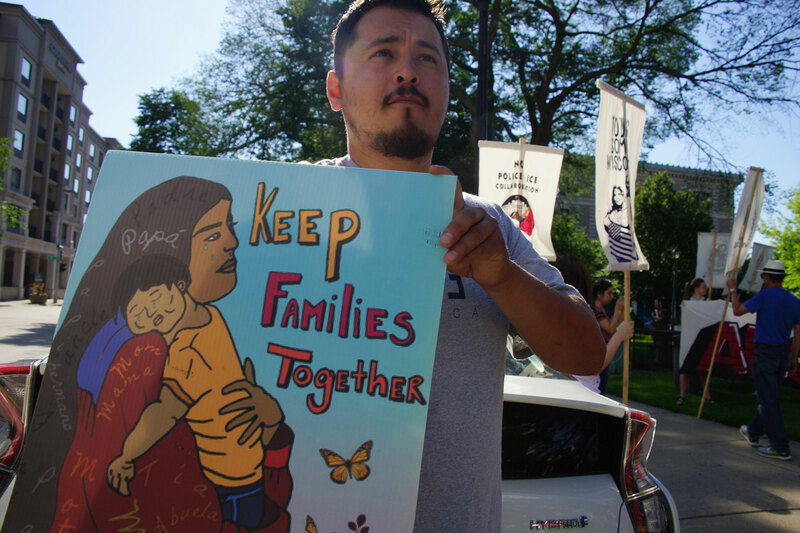 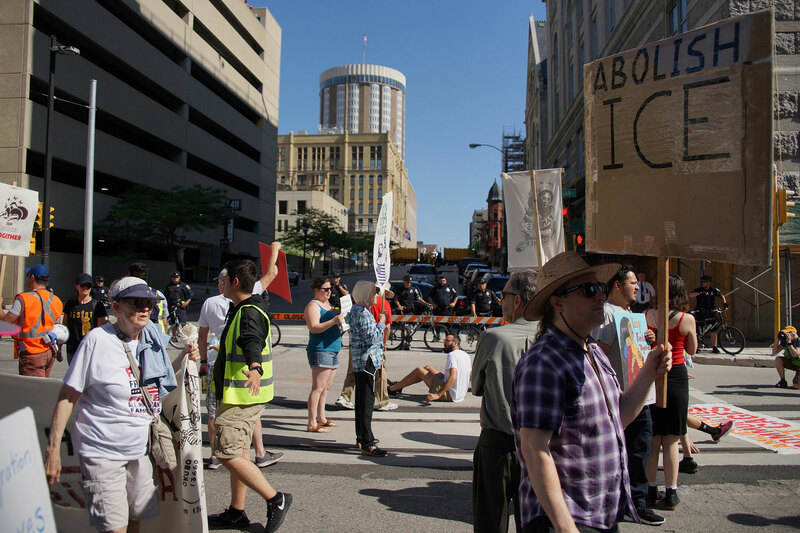 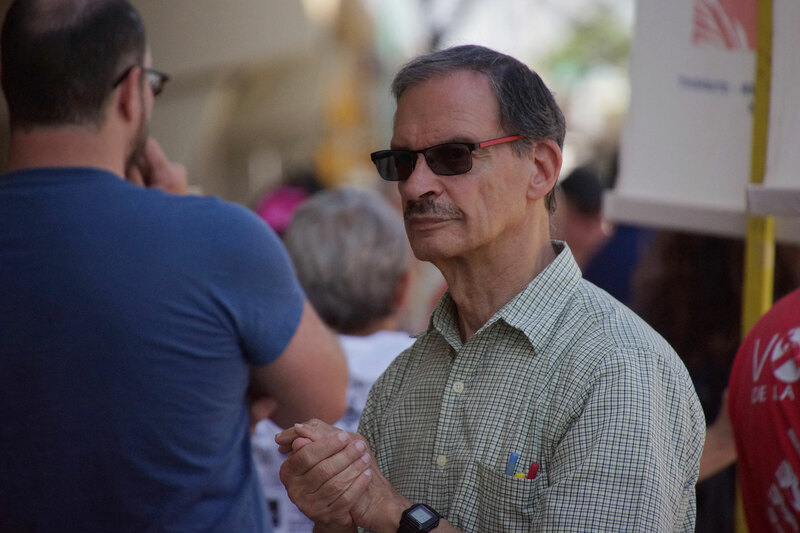 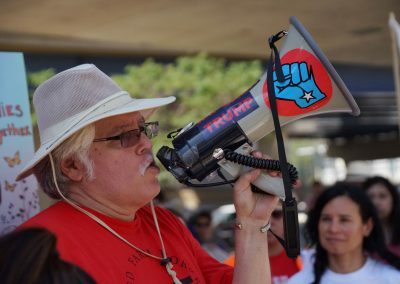 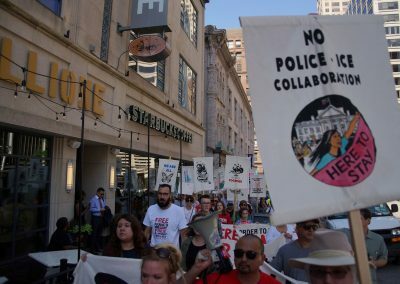 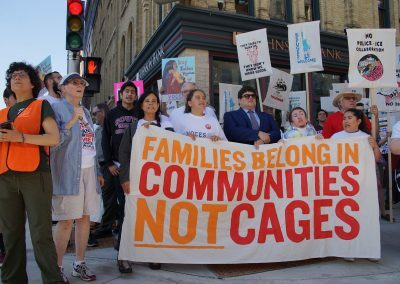 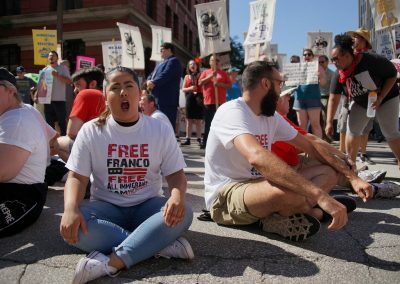 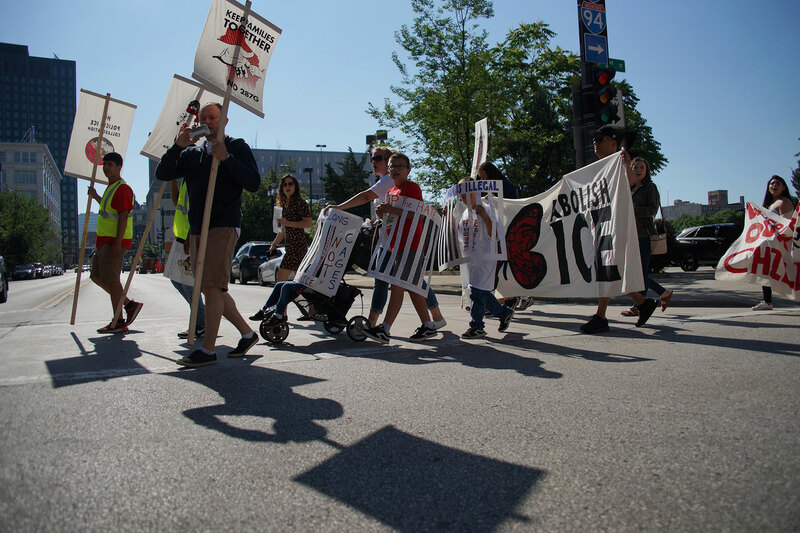 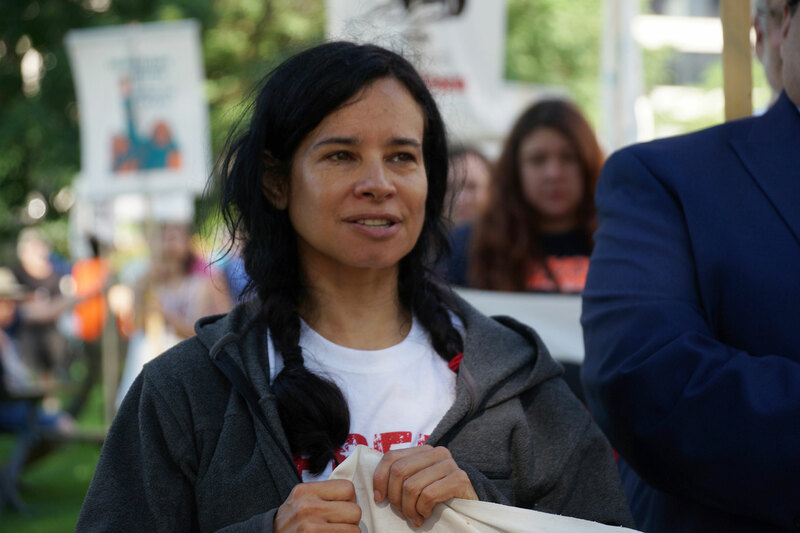 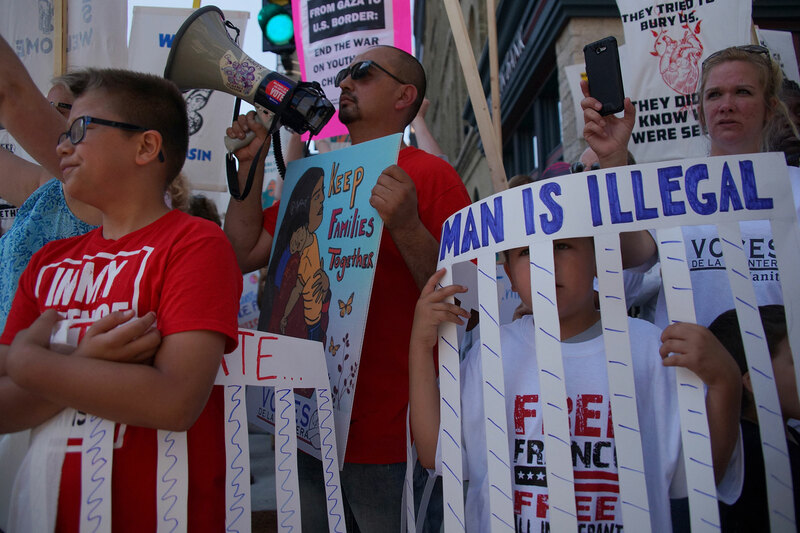 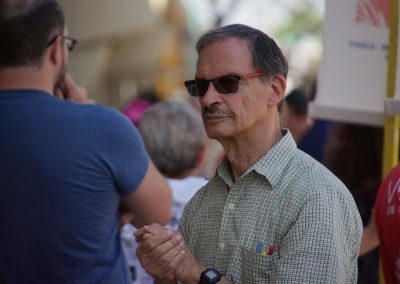 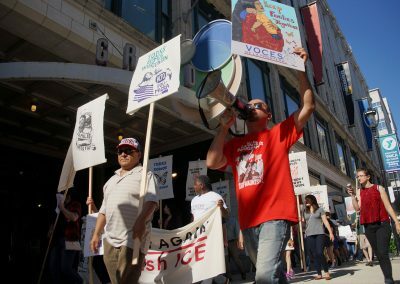 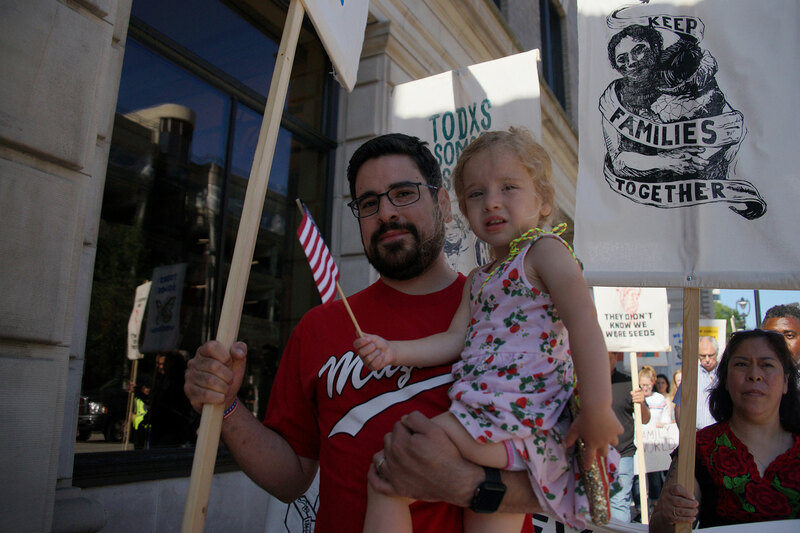 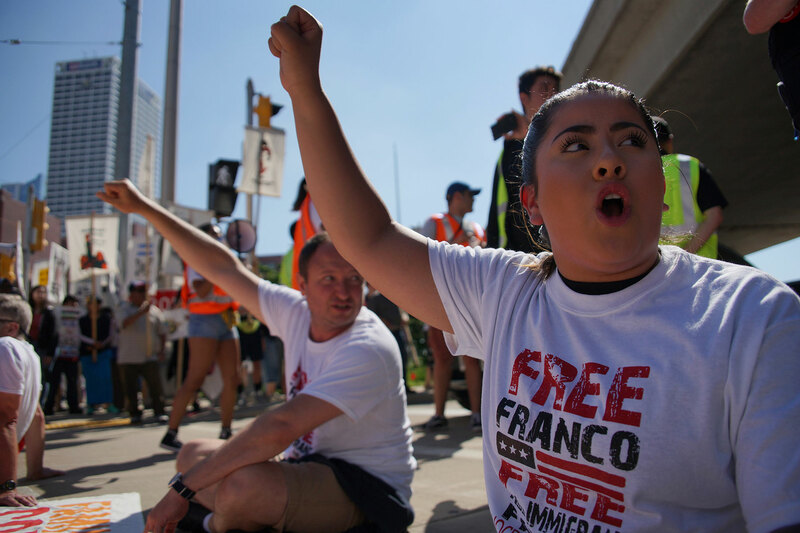 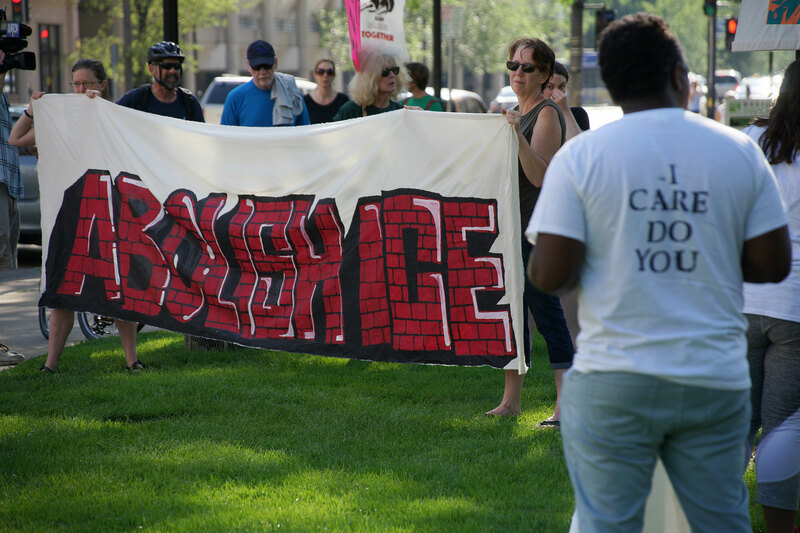 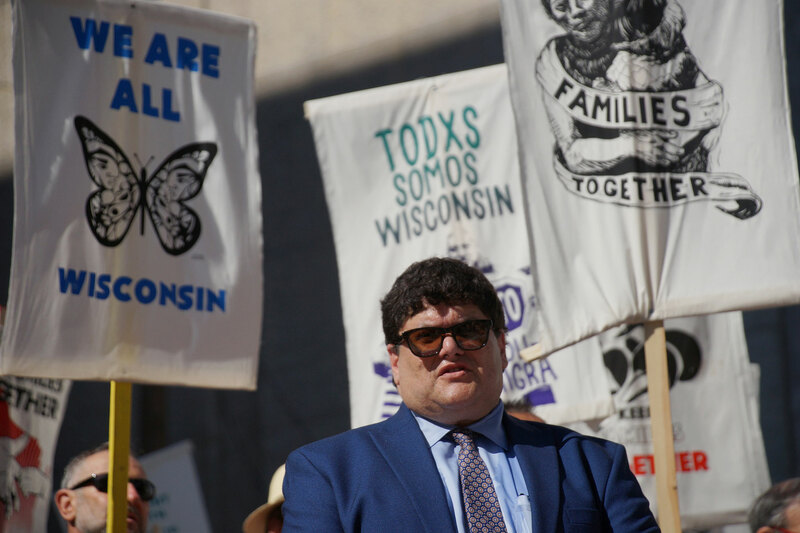 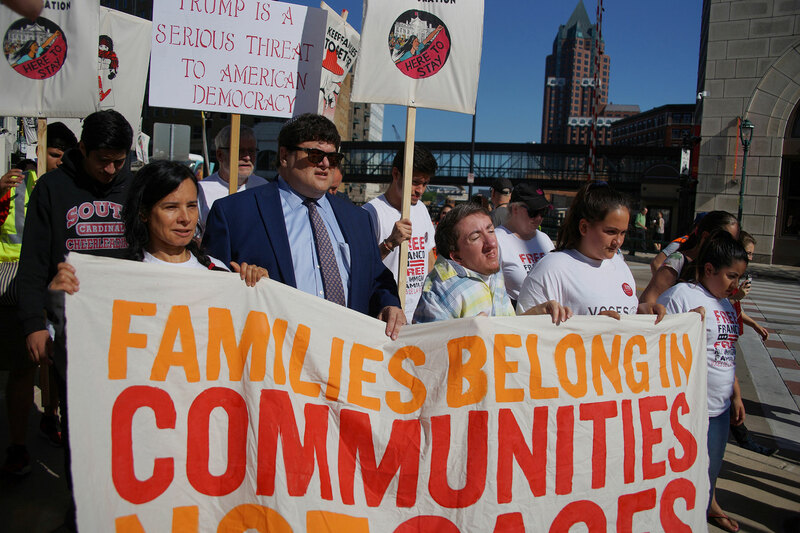 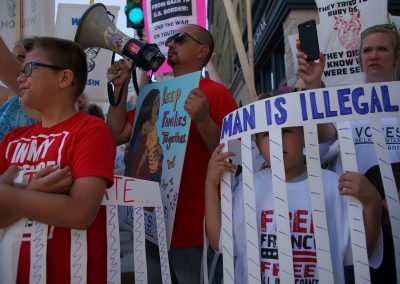 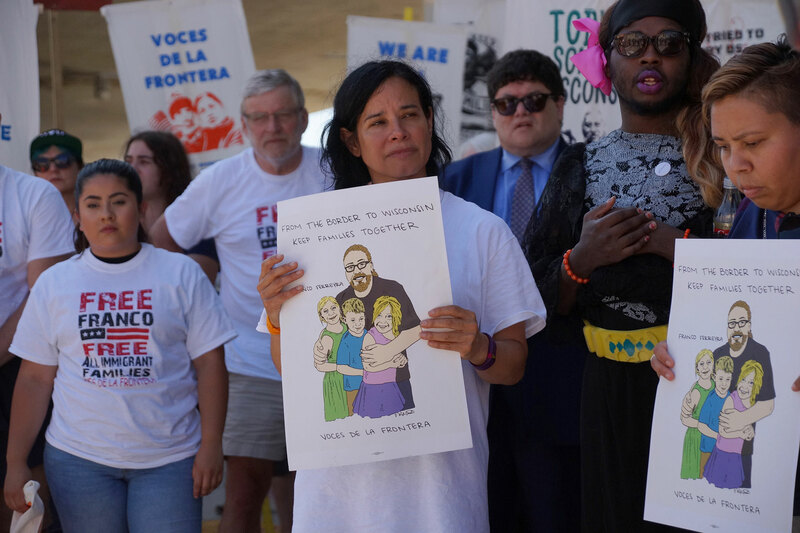 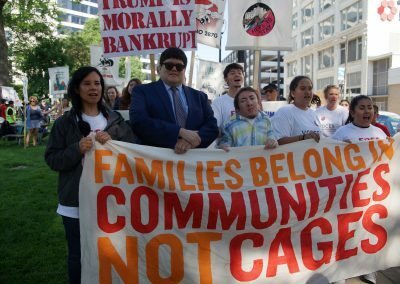 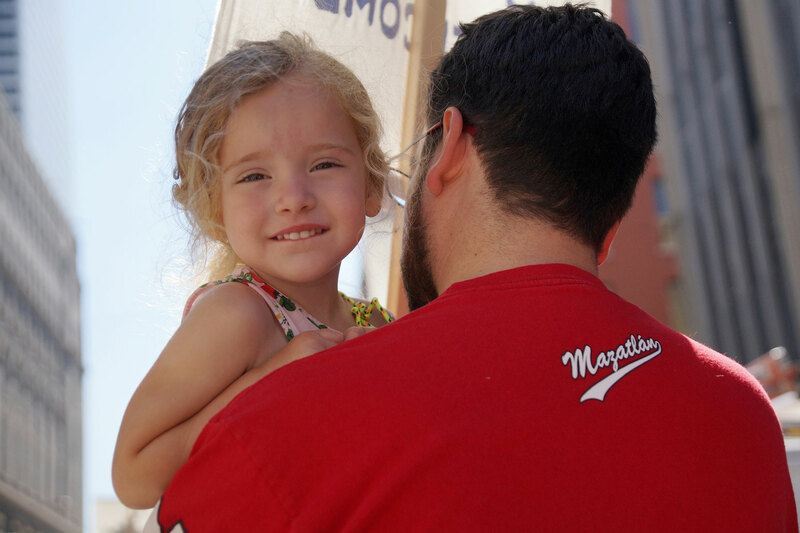 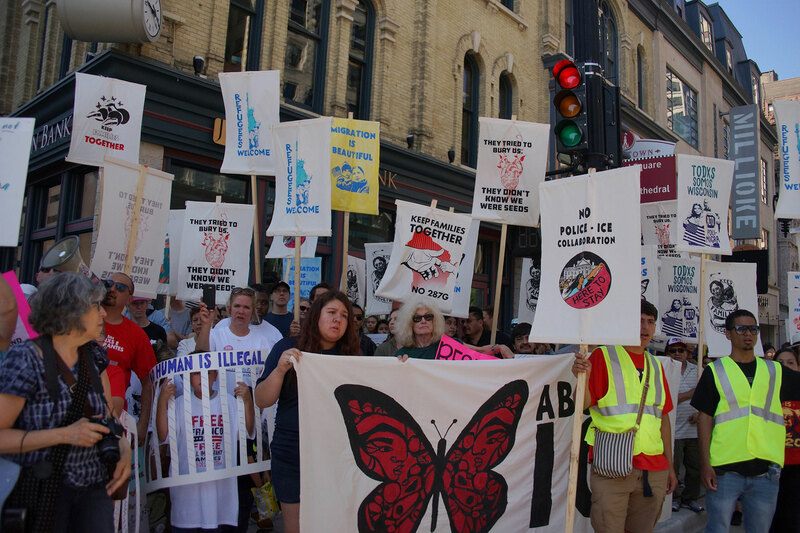 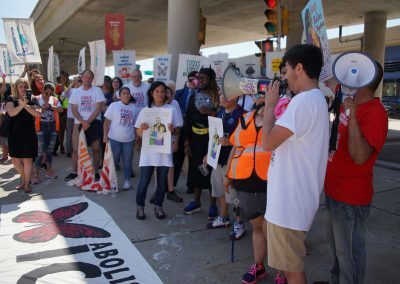 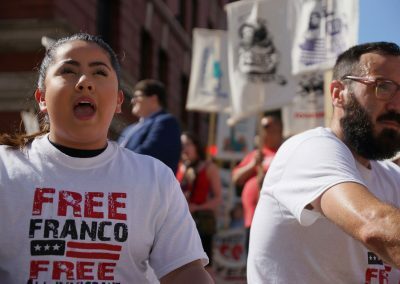 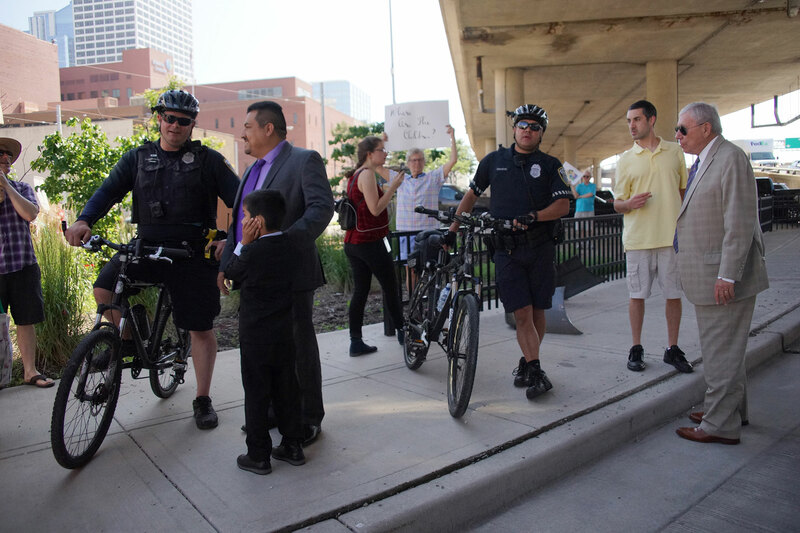 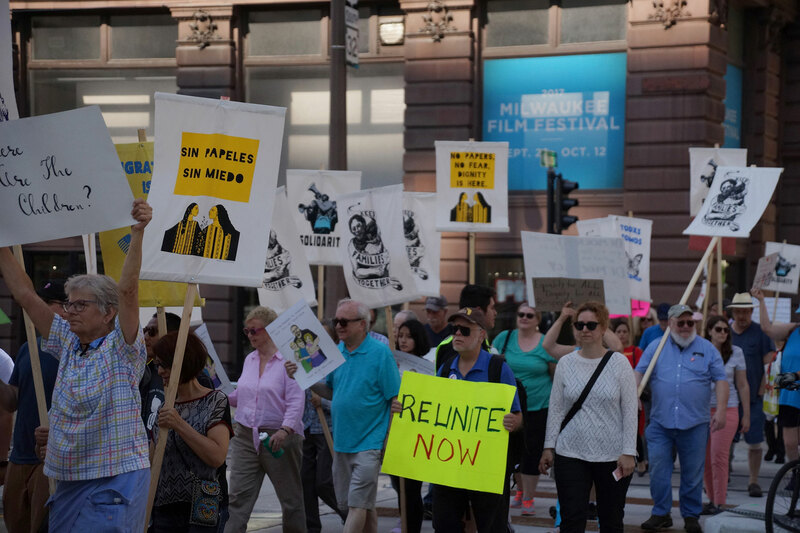 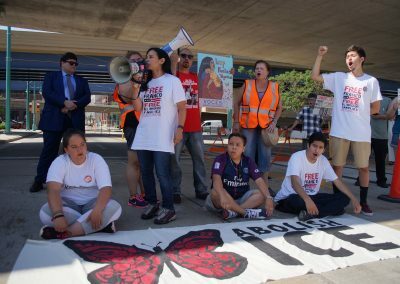 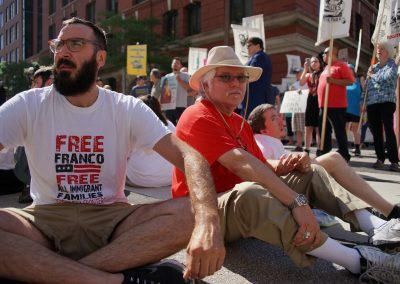 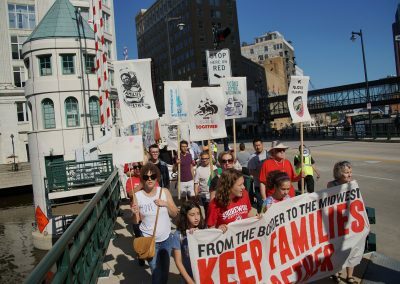 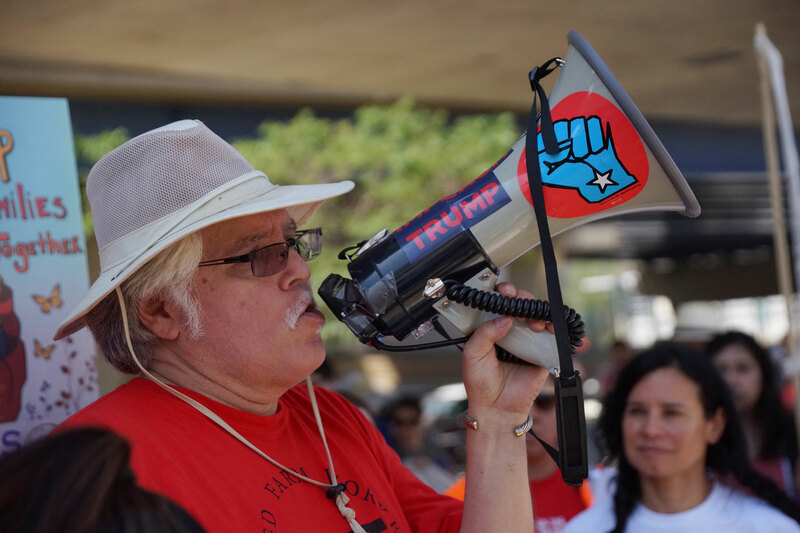 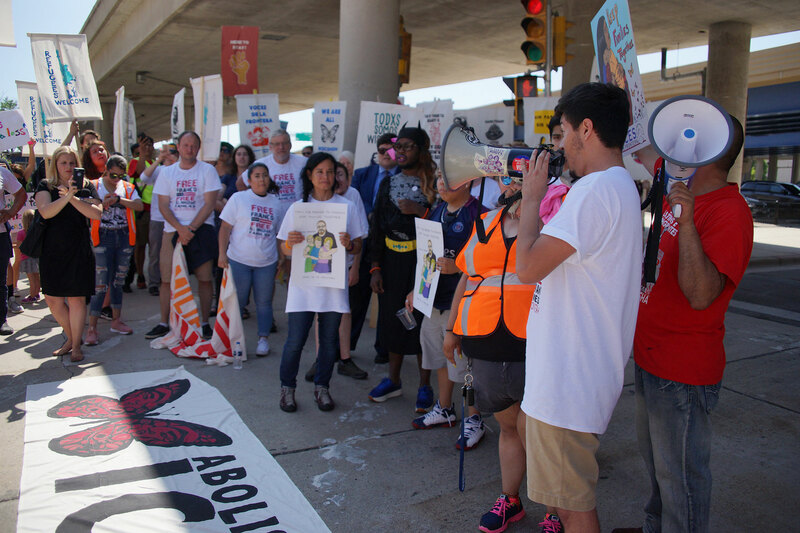 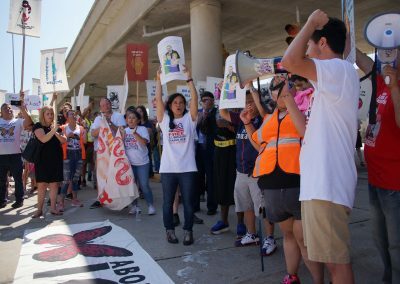 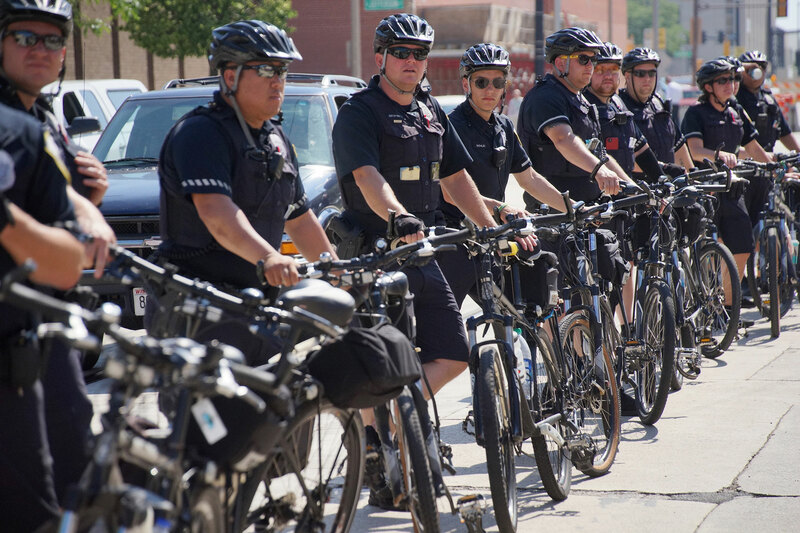 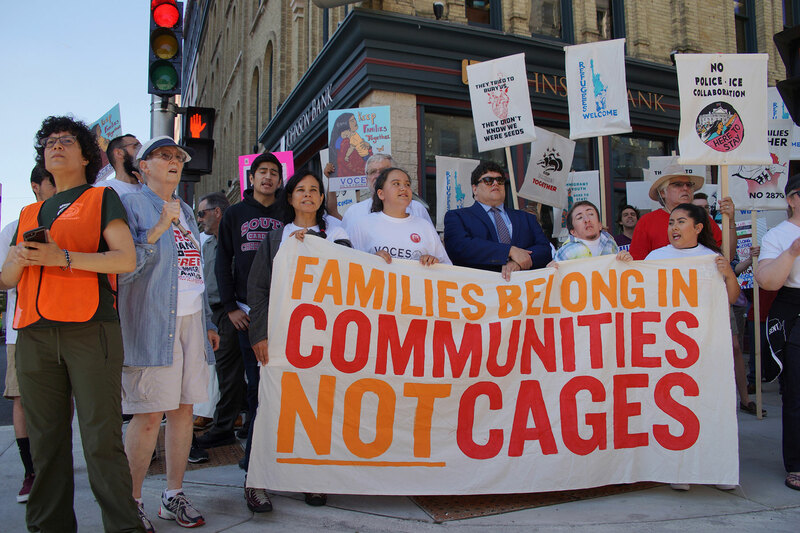 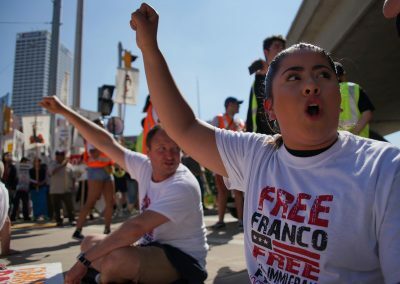 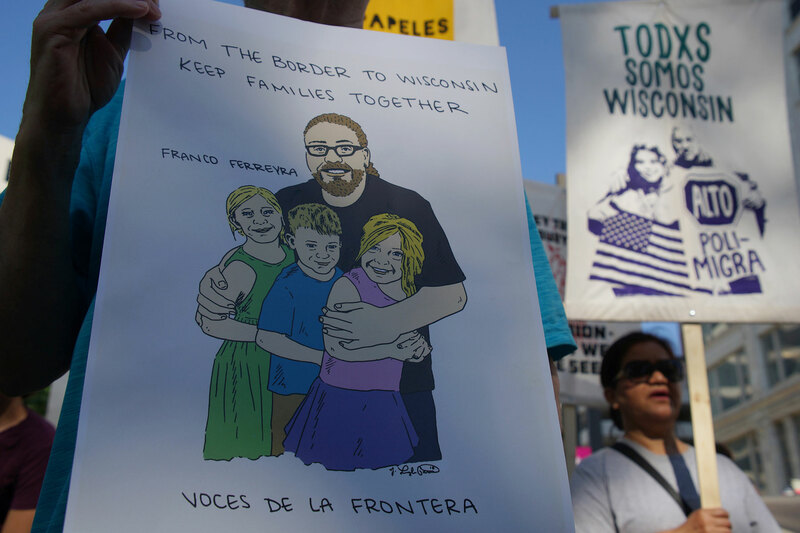 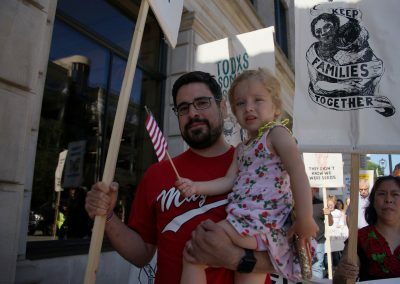 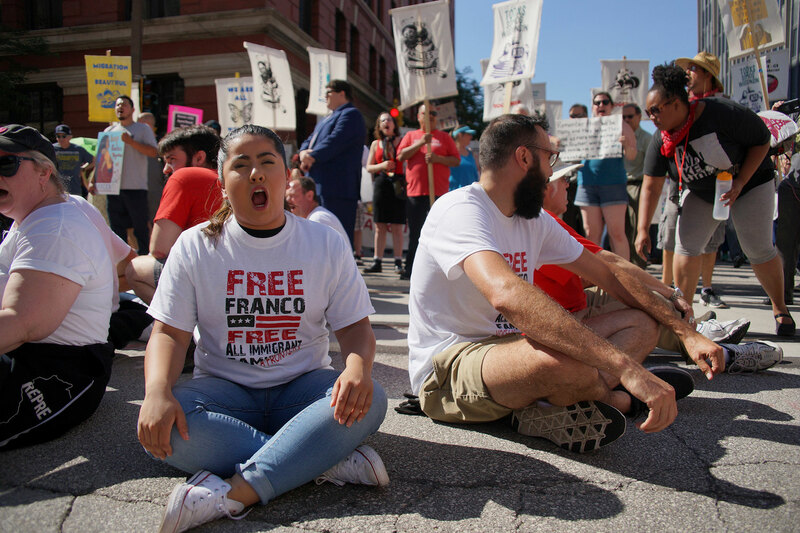 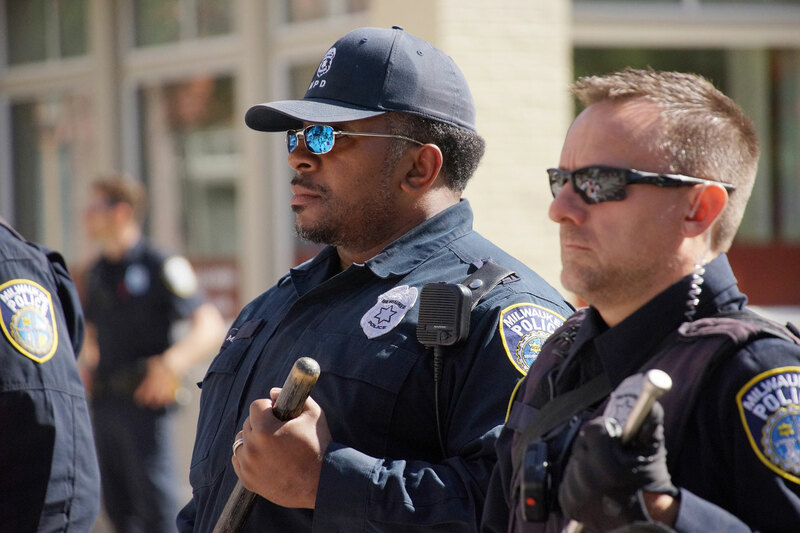 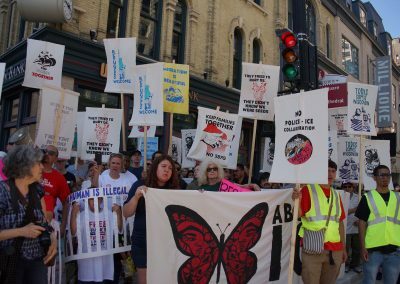 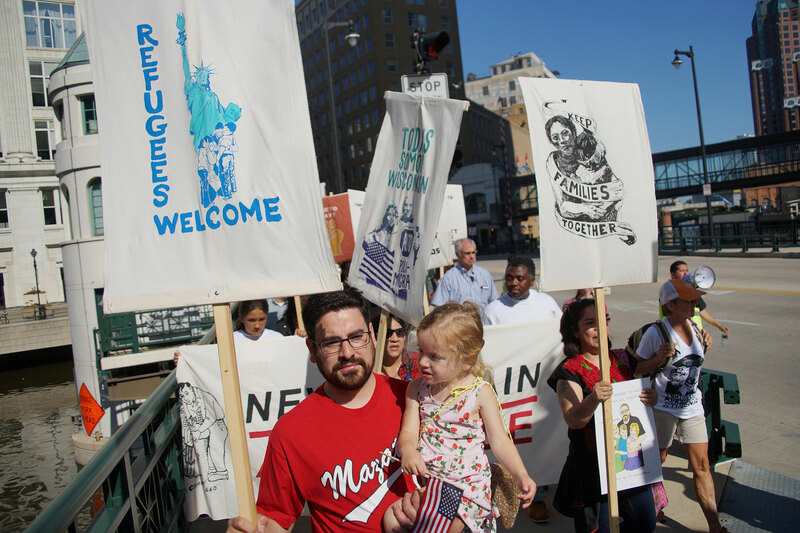 Marchers called for ICE and Customs and Border Patrol to be abolished and replaced by institutions that support and welcome immigrants, and demanded ICE close the case of Franco Ferreyra, a Waukesha father of 4 currently imprisoned by ICE. 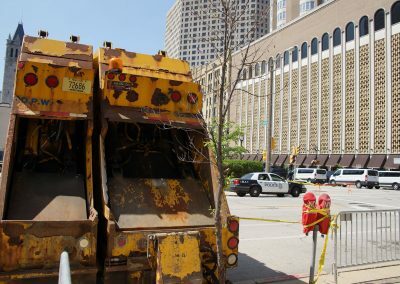 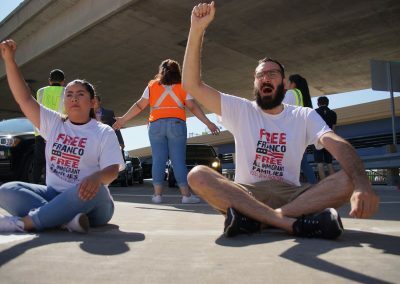 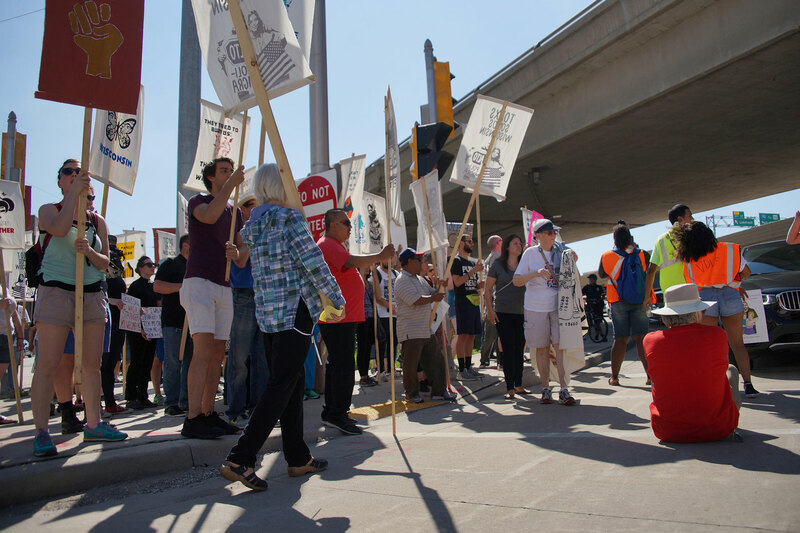 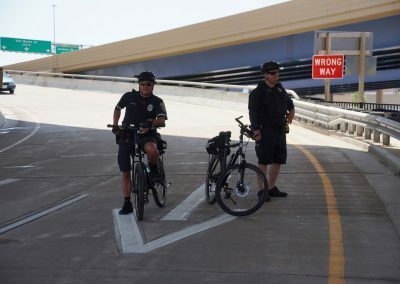 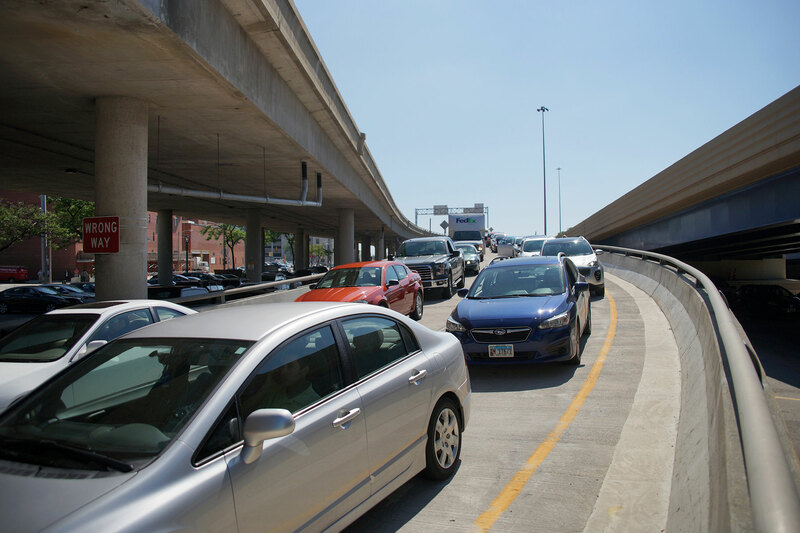 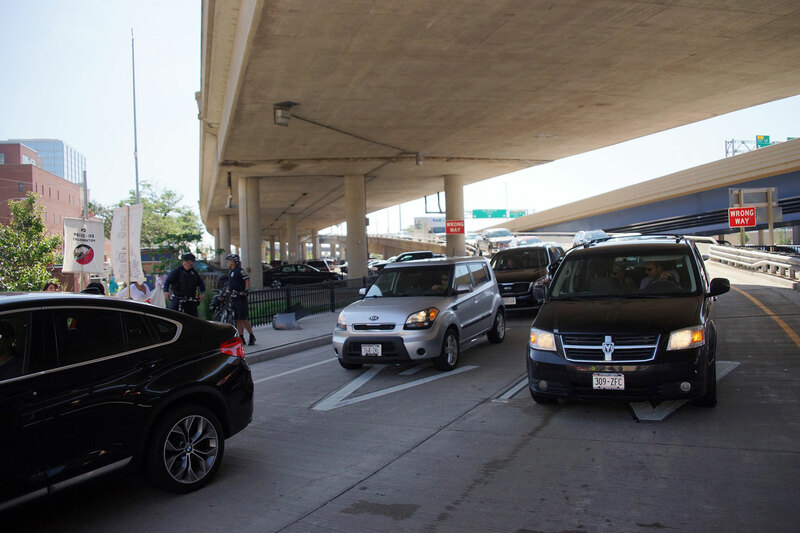 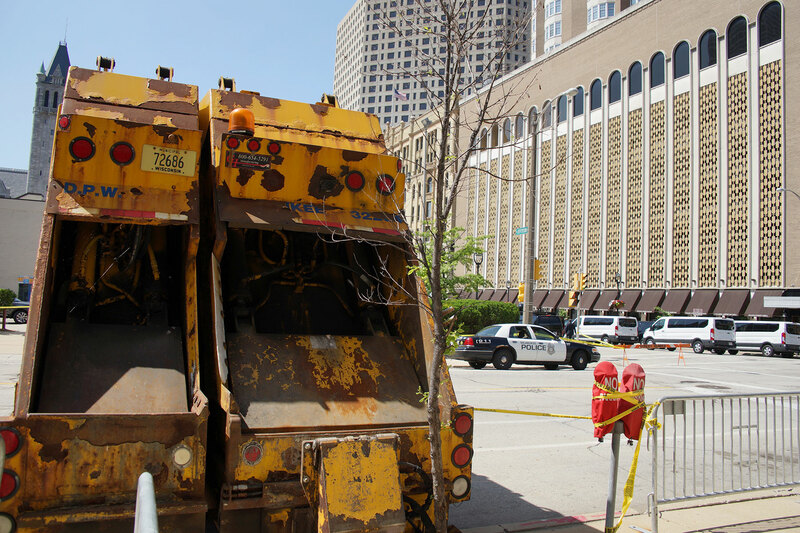 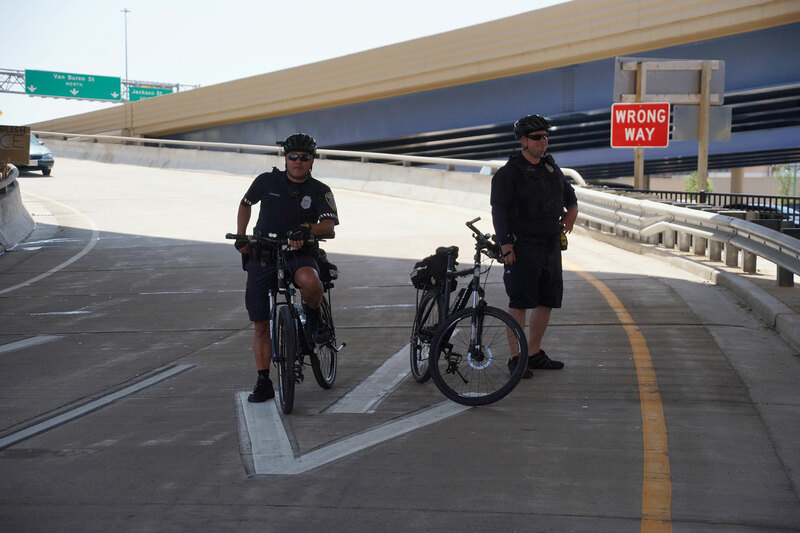 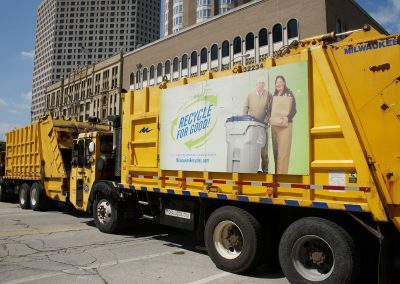 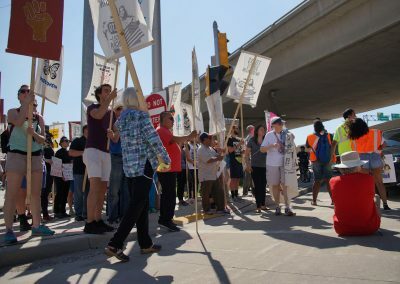 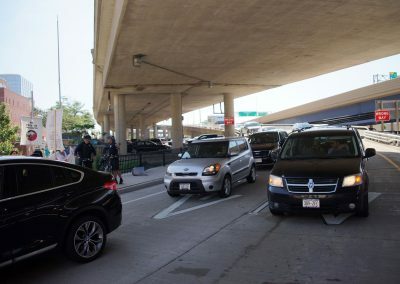 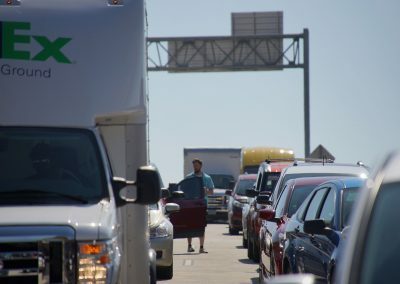 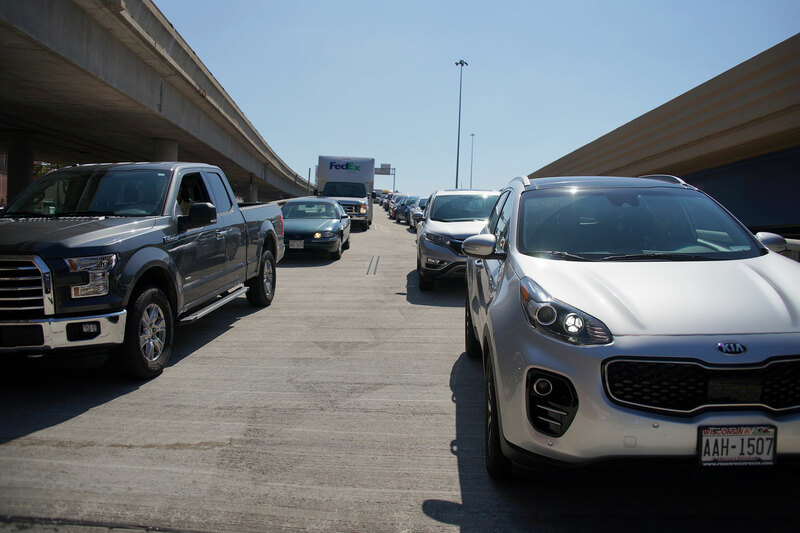 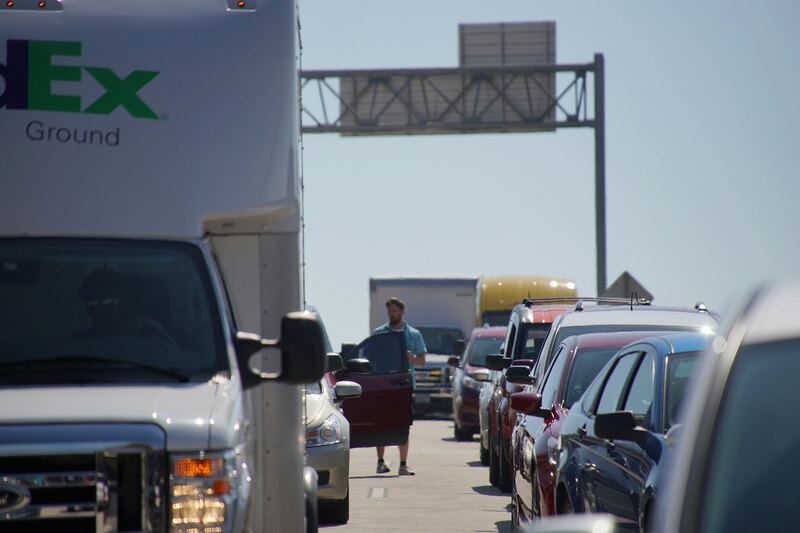 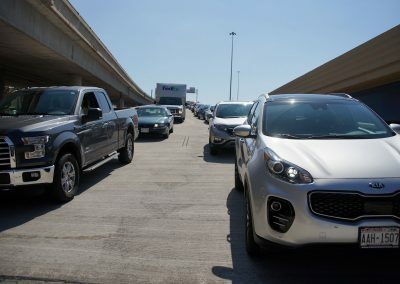 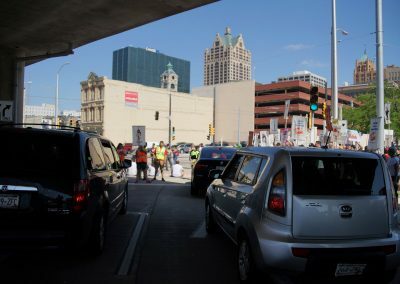 A dozen community members blocked an interstate off-ramp into downtown, backing up traffic for miles. 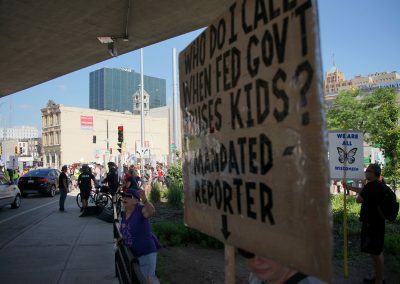 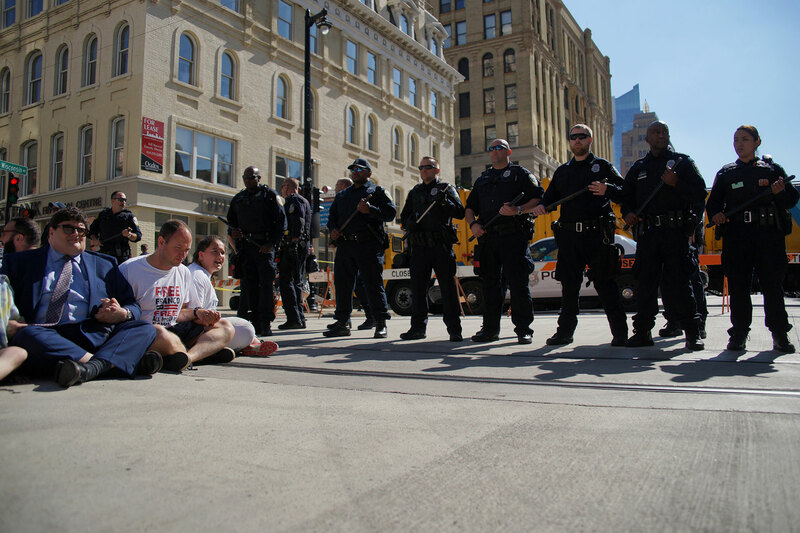 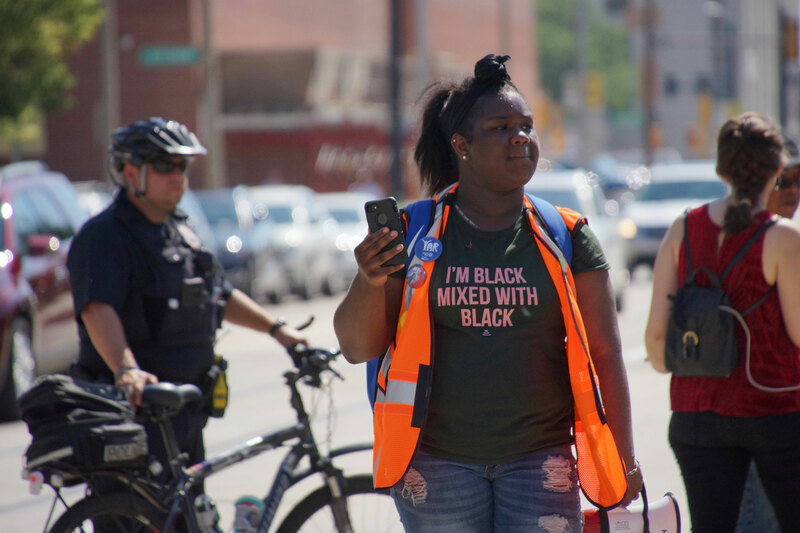 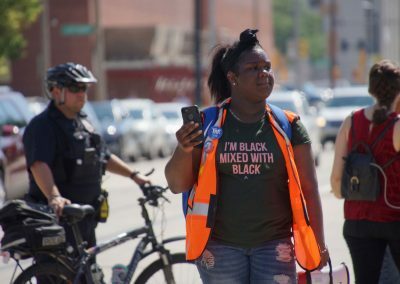 The group then moved to other street corners near the fundraiser before settling in front of the I-794 off ramp into downtown. 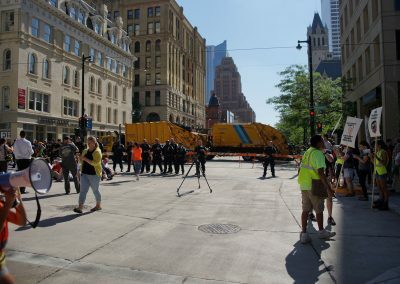 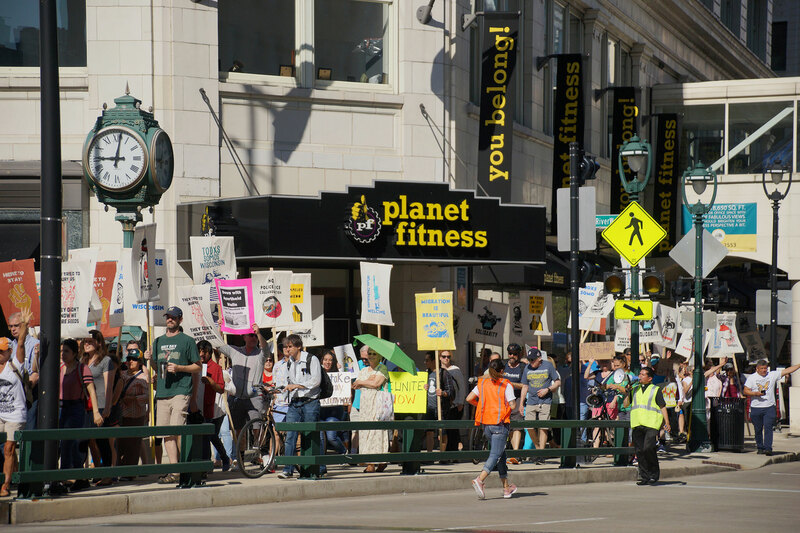 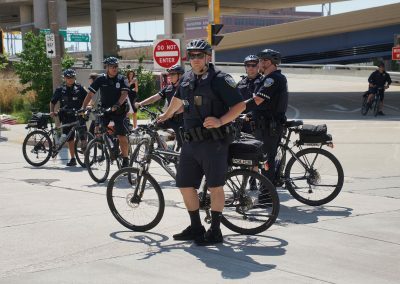 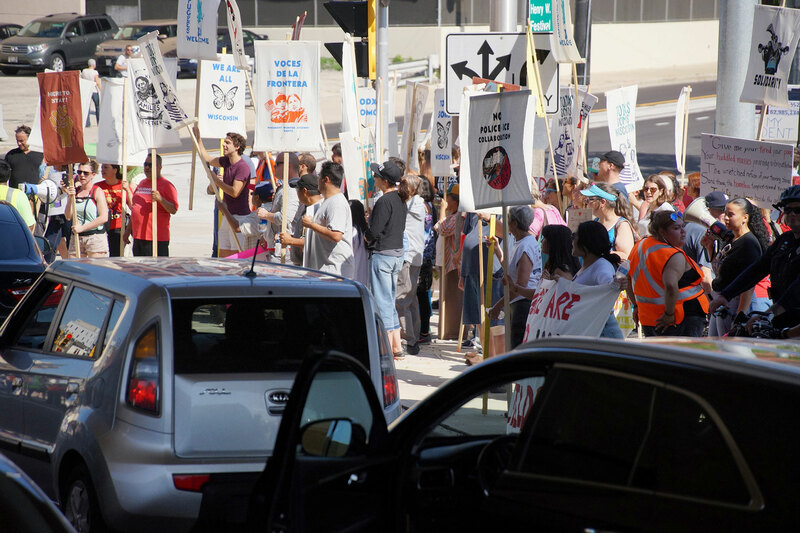 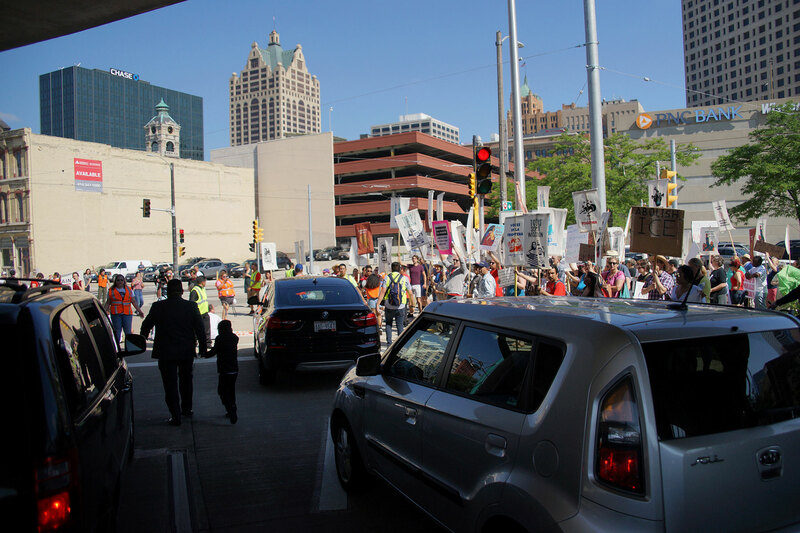 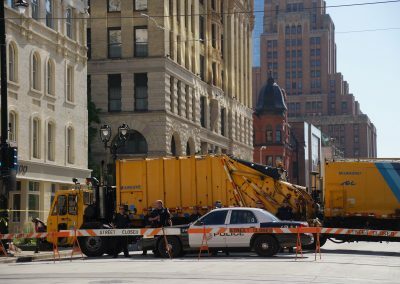 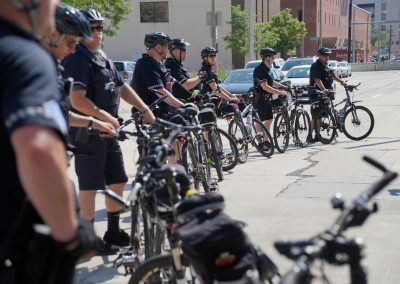 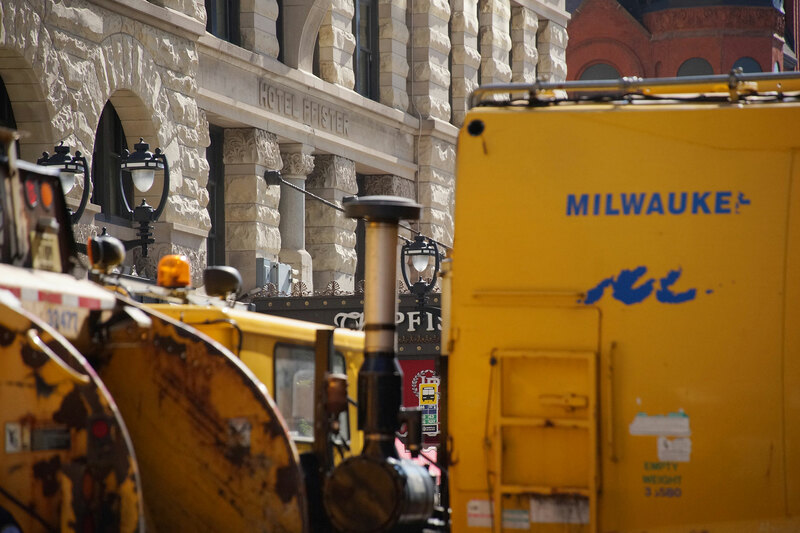 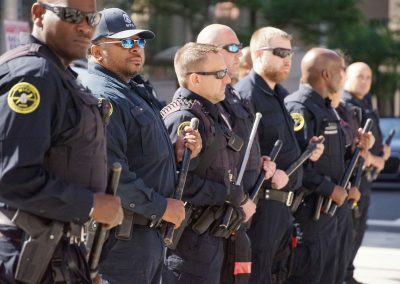 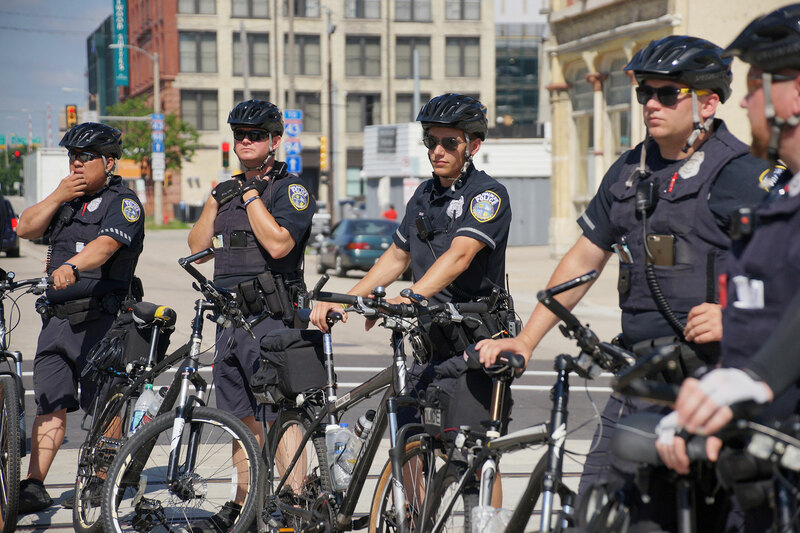 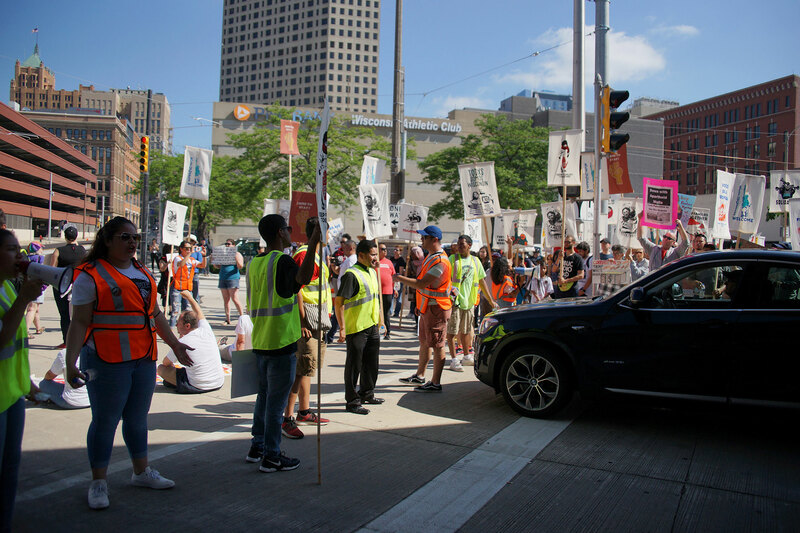 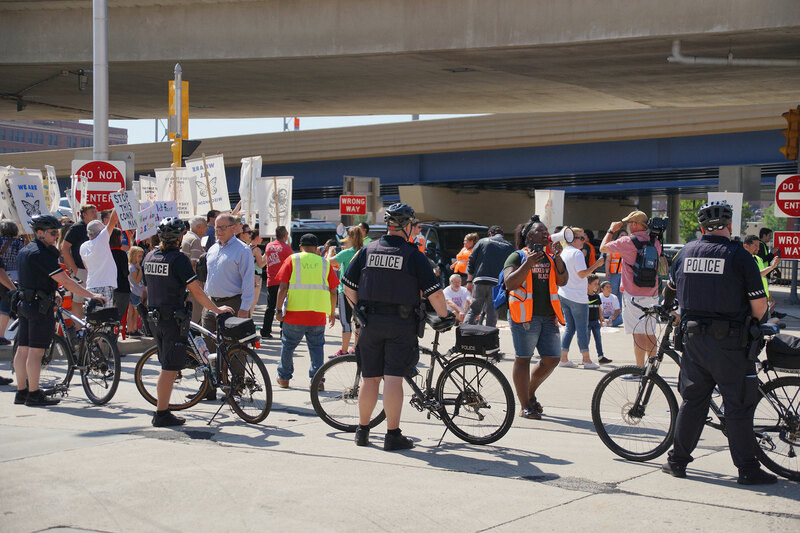 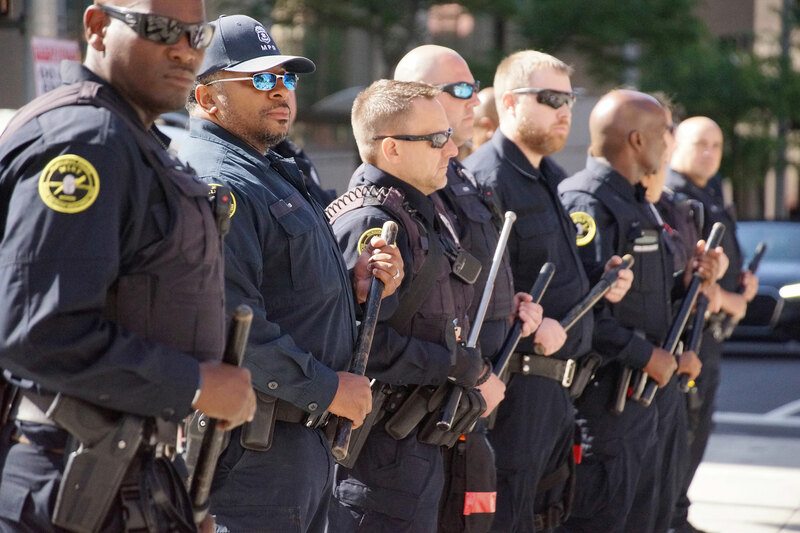 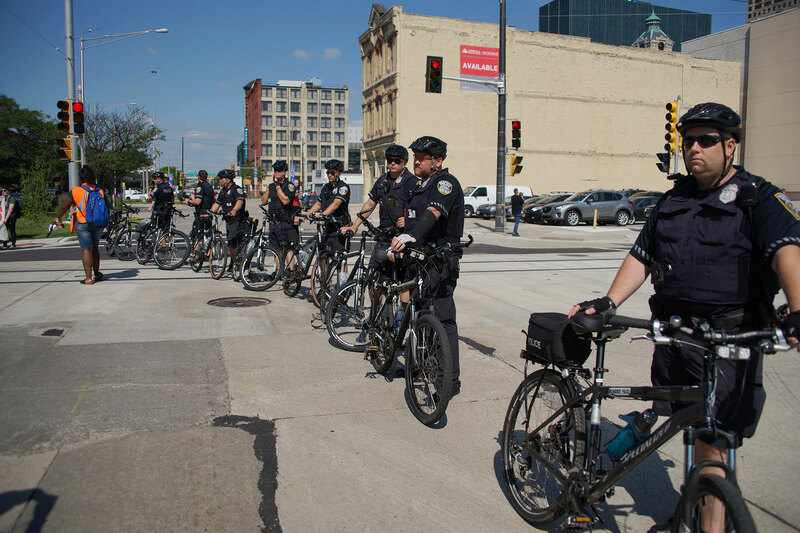 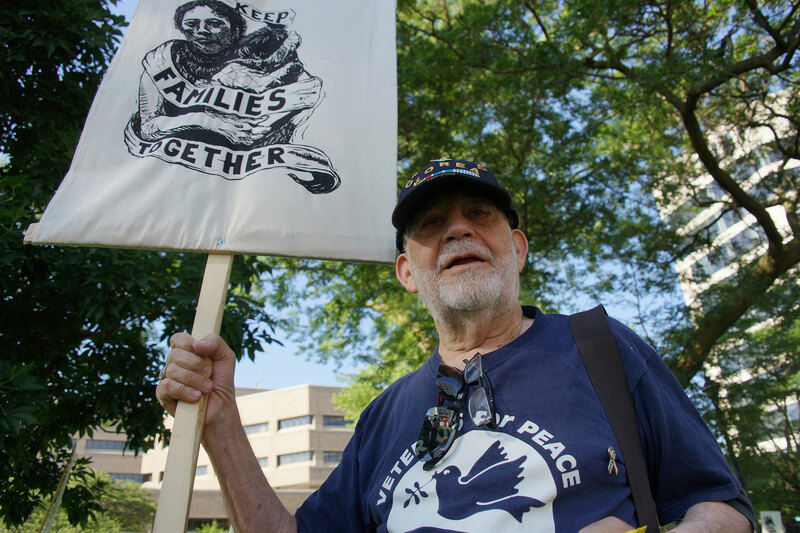 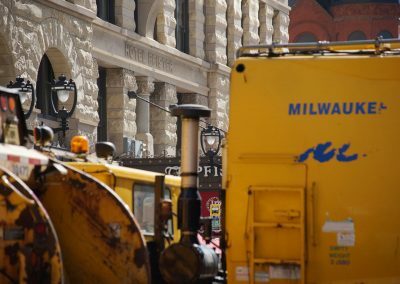 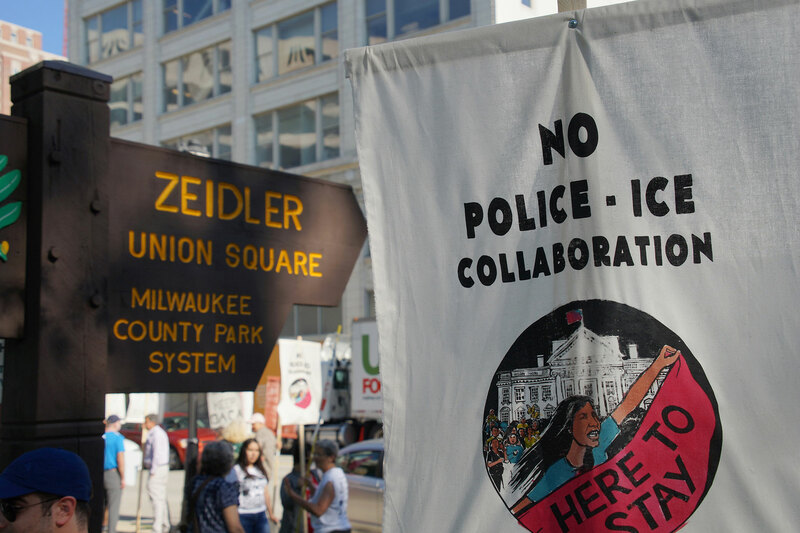 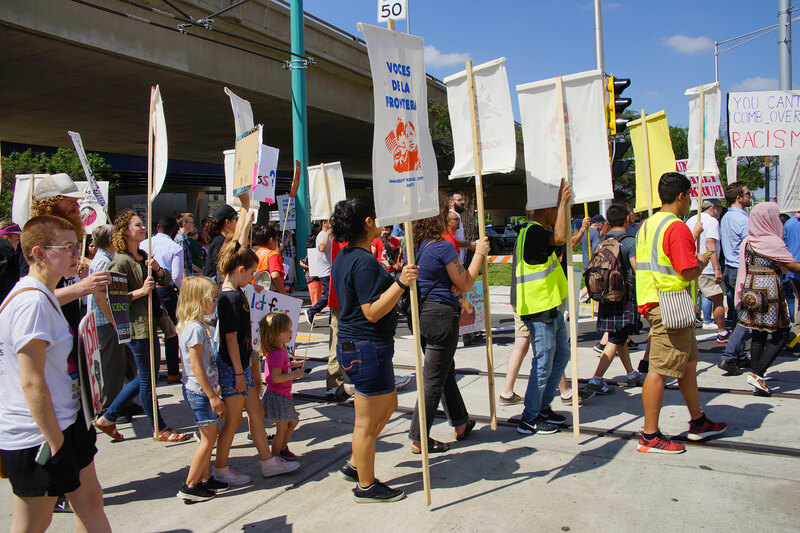 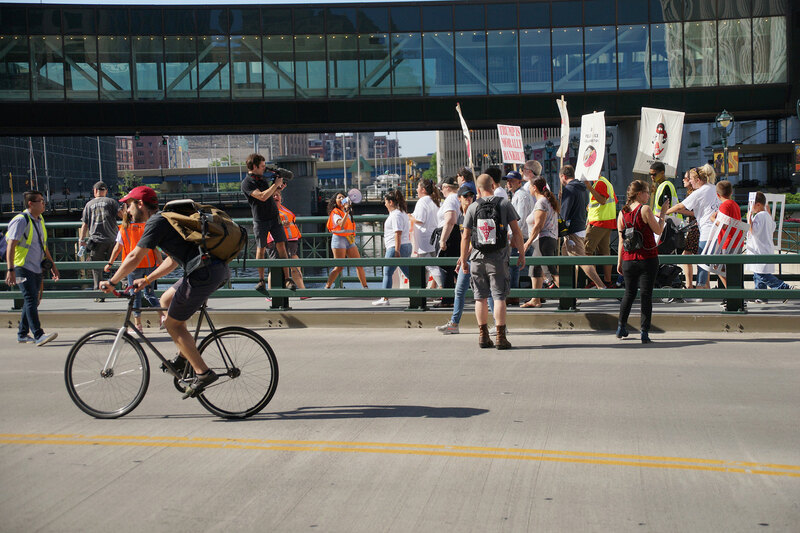 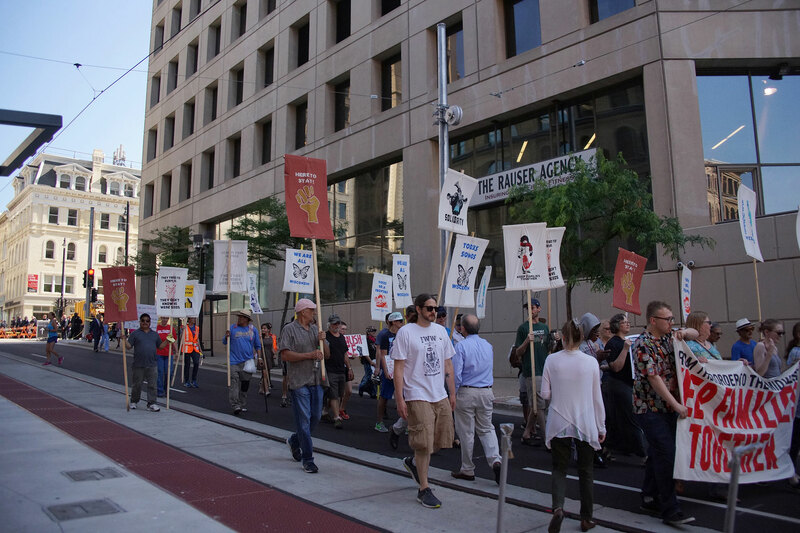 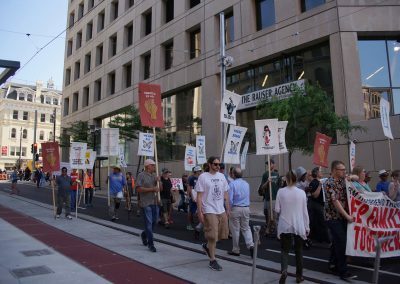 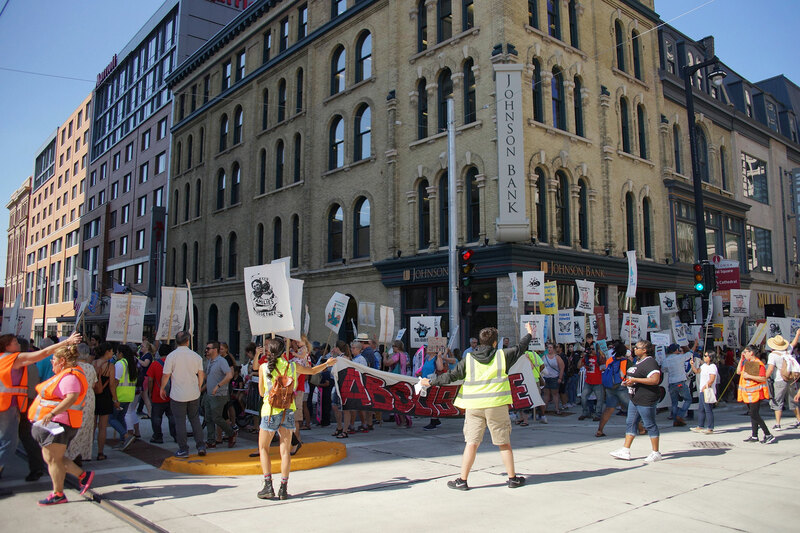 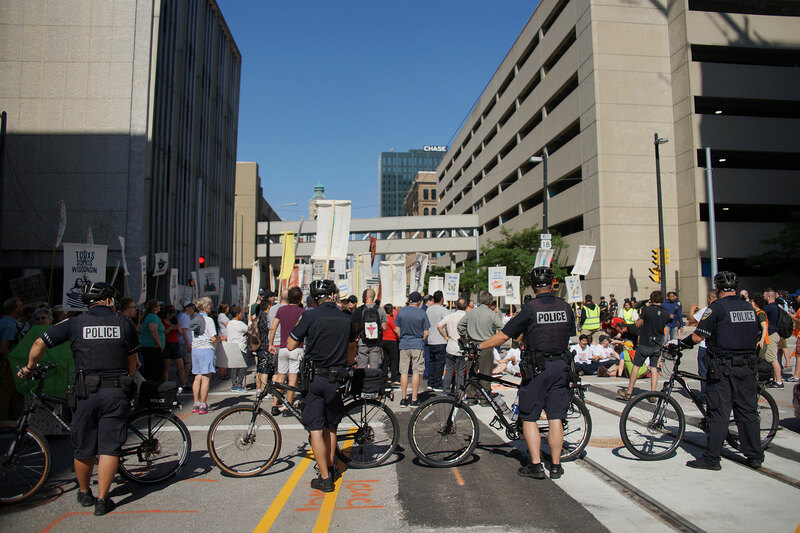 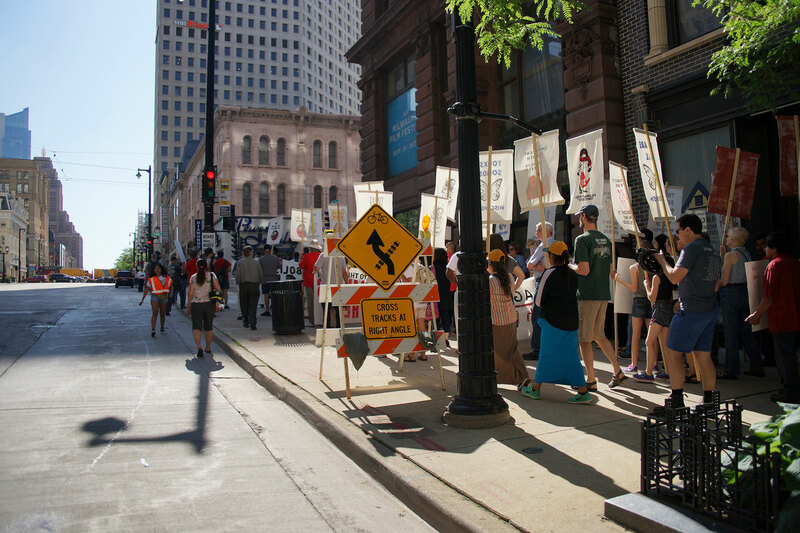 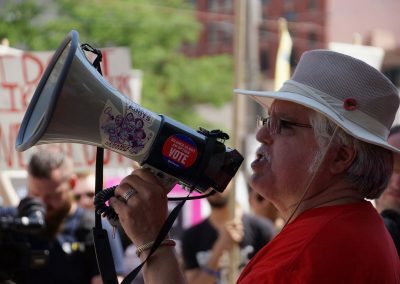 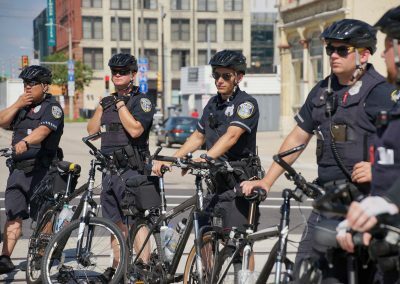 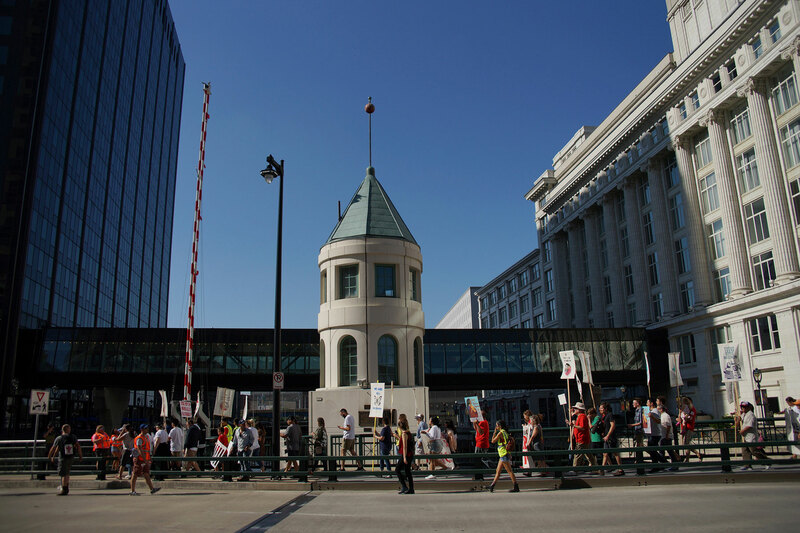 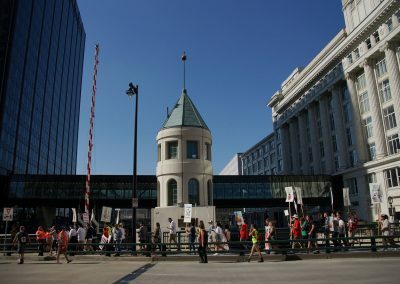 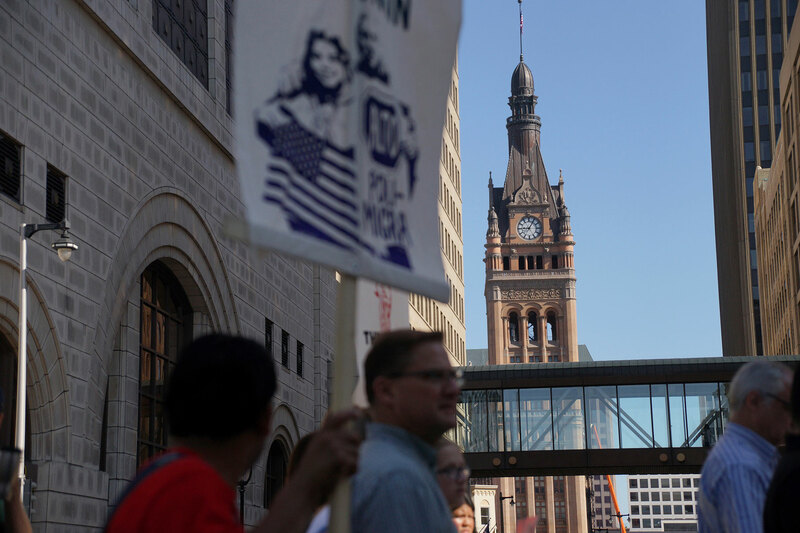 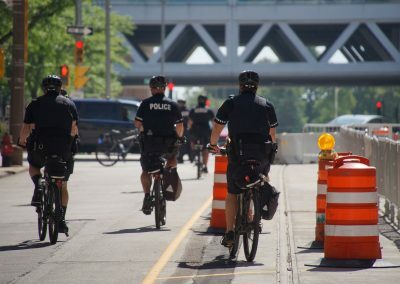 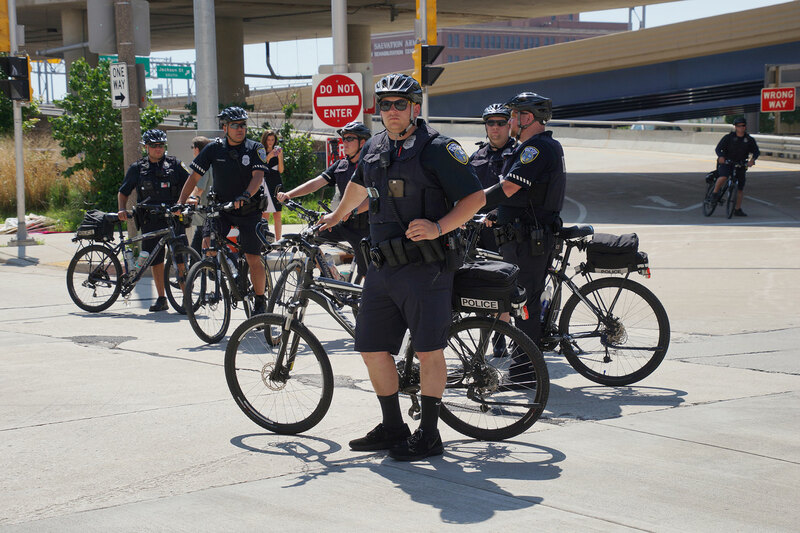 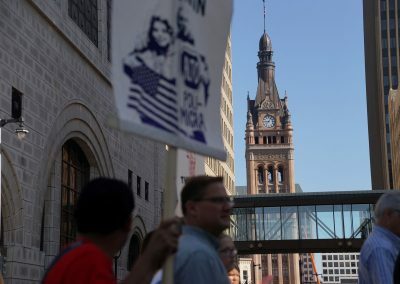 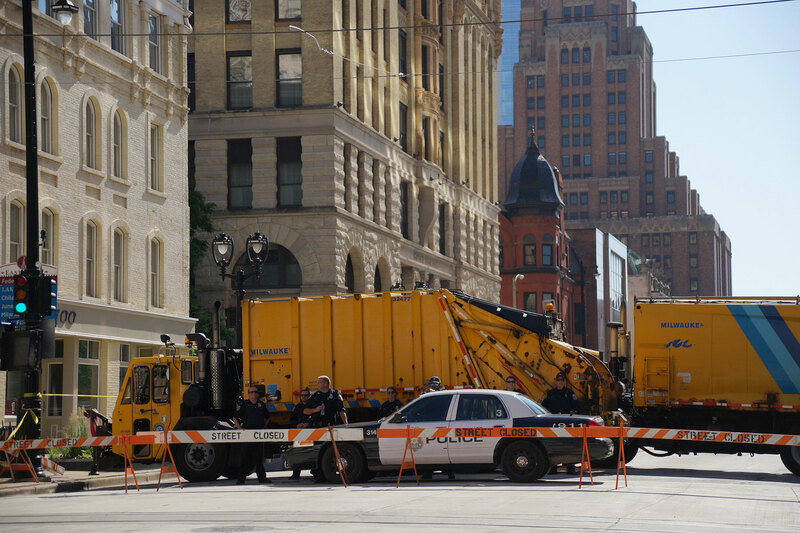 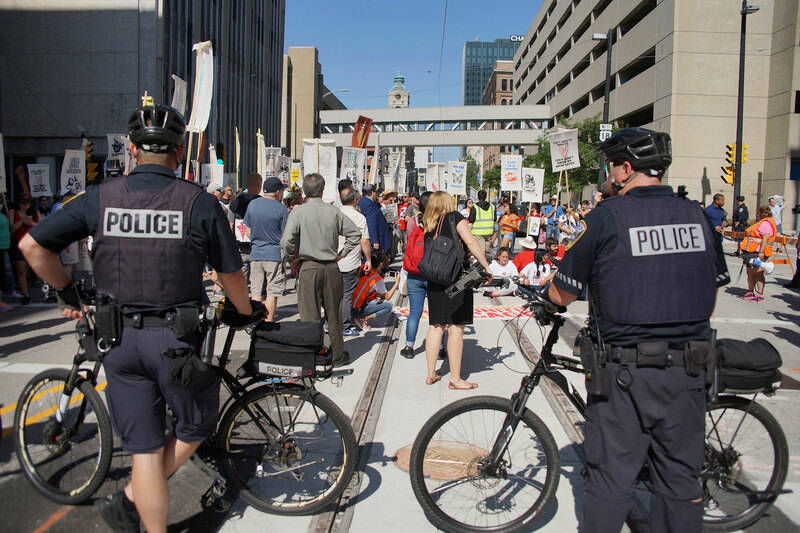 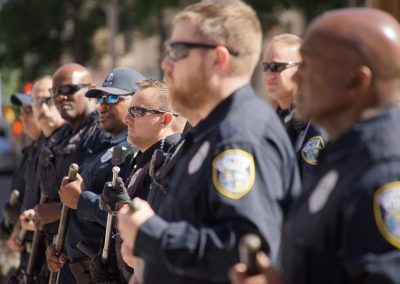 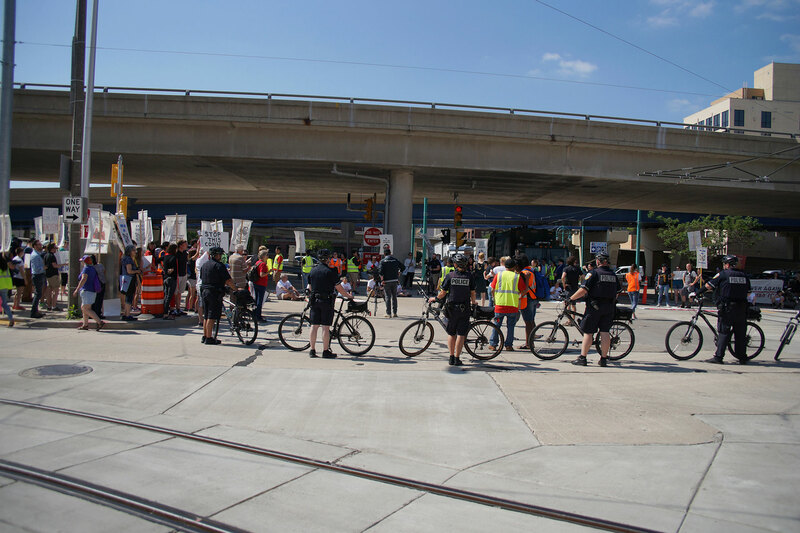 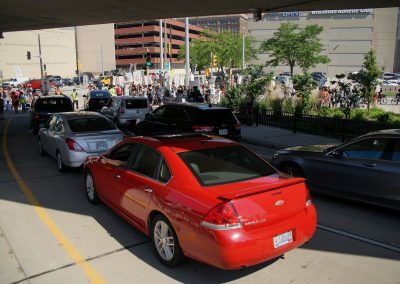 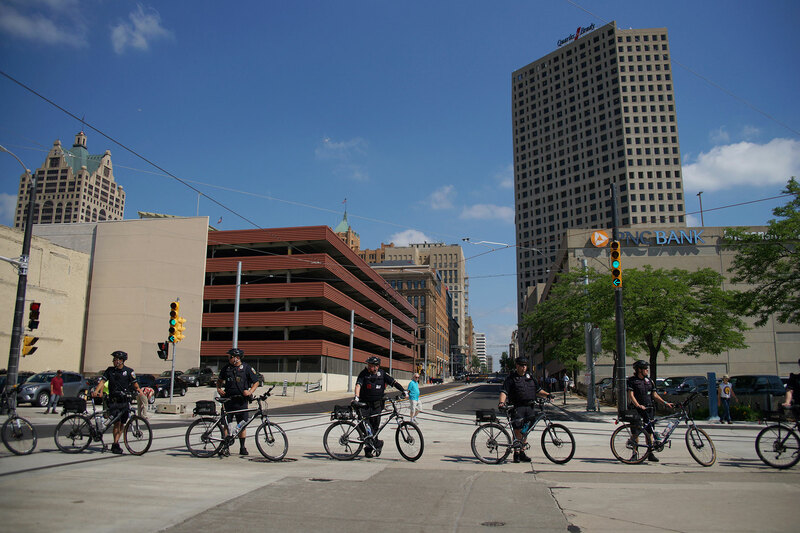 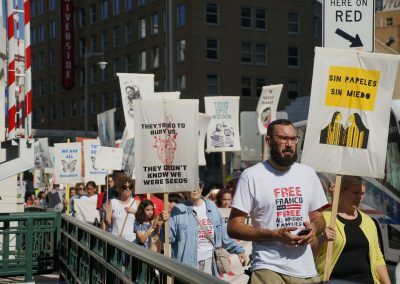 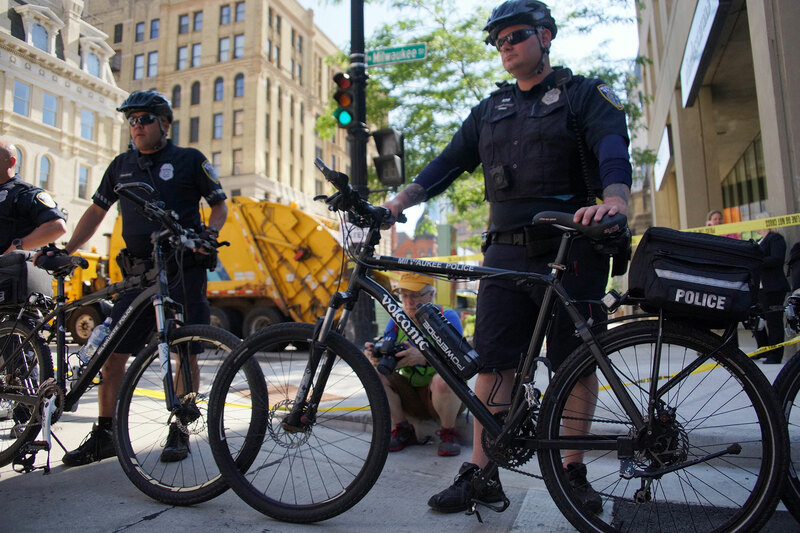 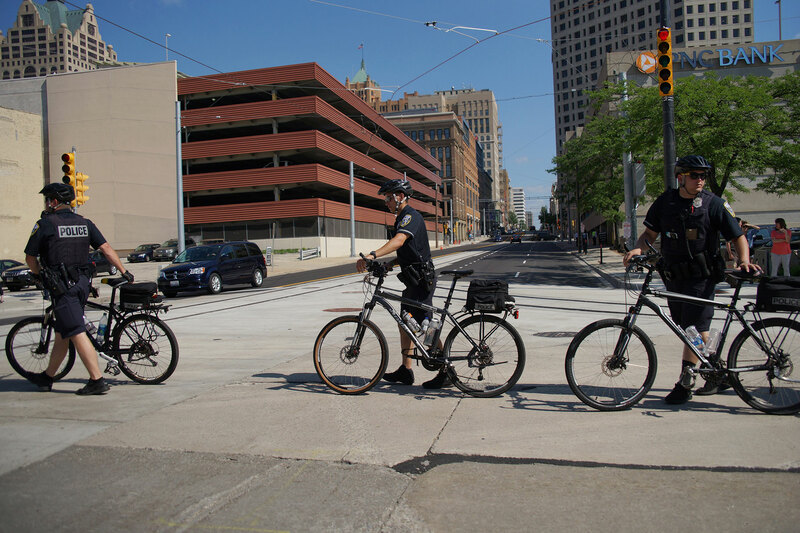 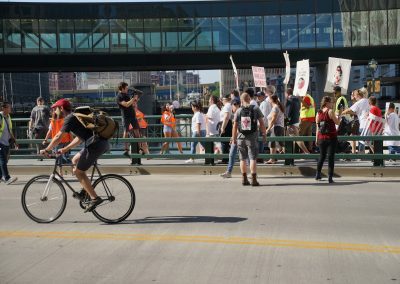 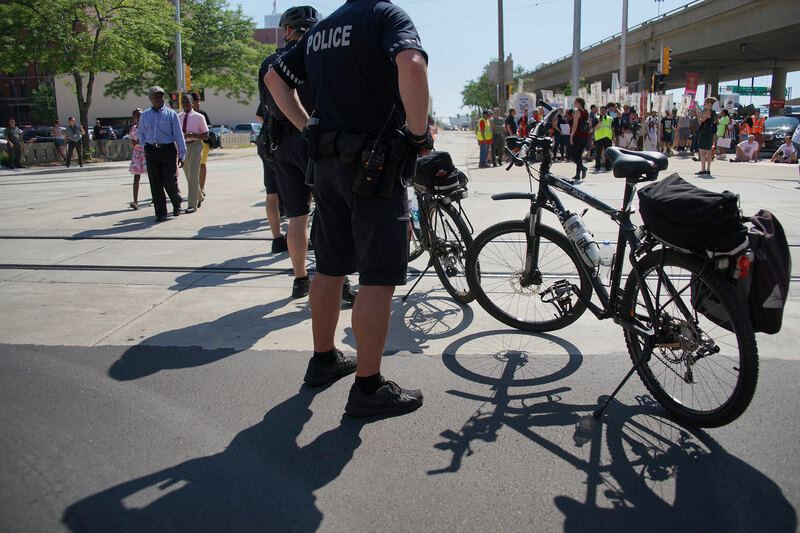 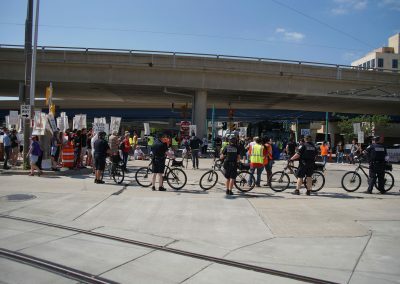 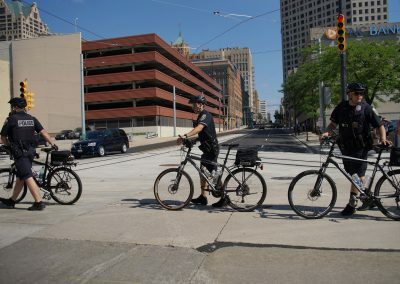 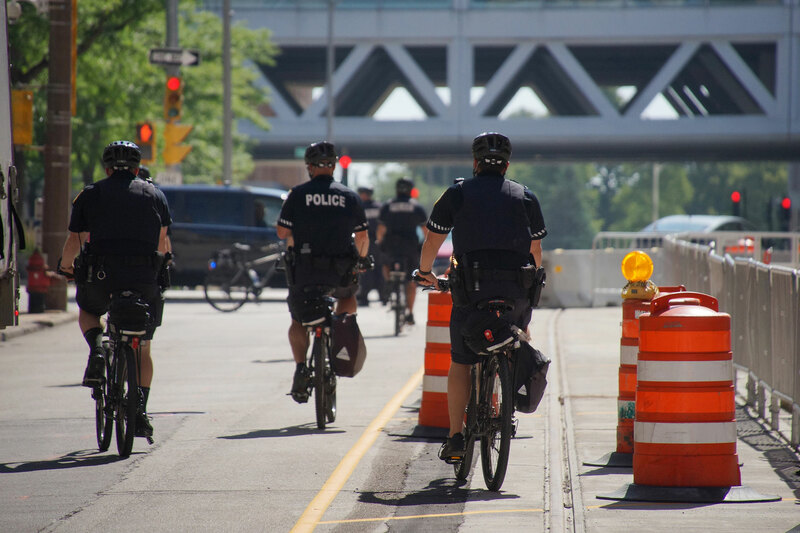 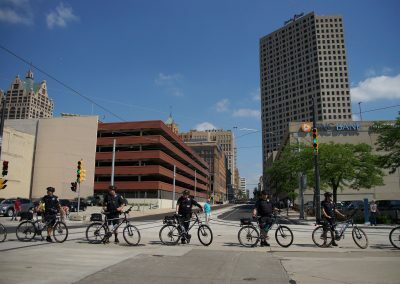 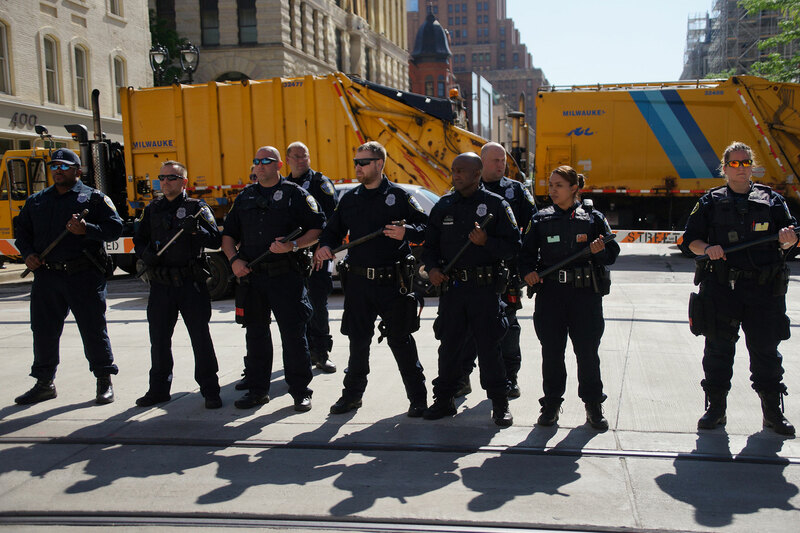 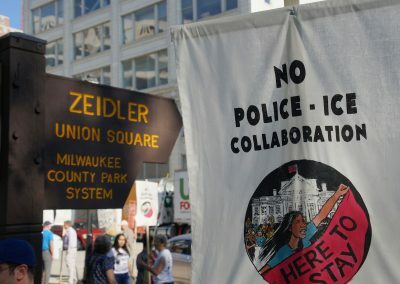 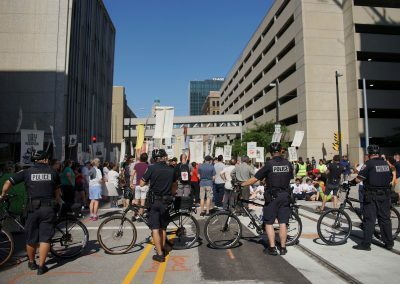 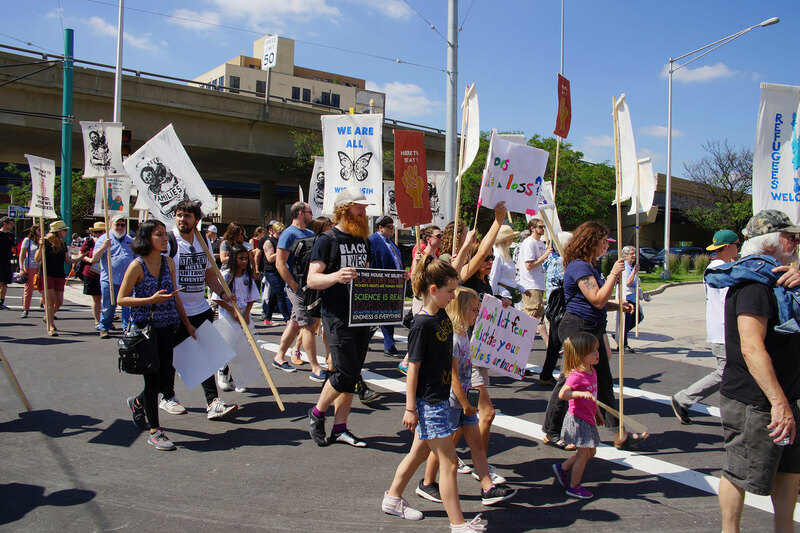 After blocking the interstate for over half an hour, the protesters held a program before marching back to Zeidler Park. 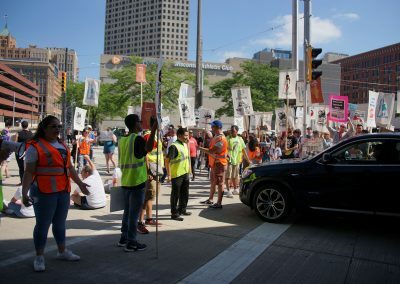 From the park, many left for Racine for the continued protests against Trump and Foxconn. 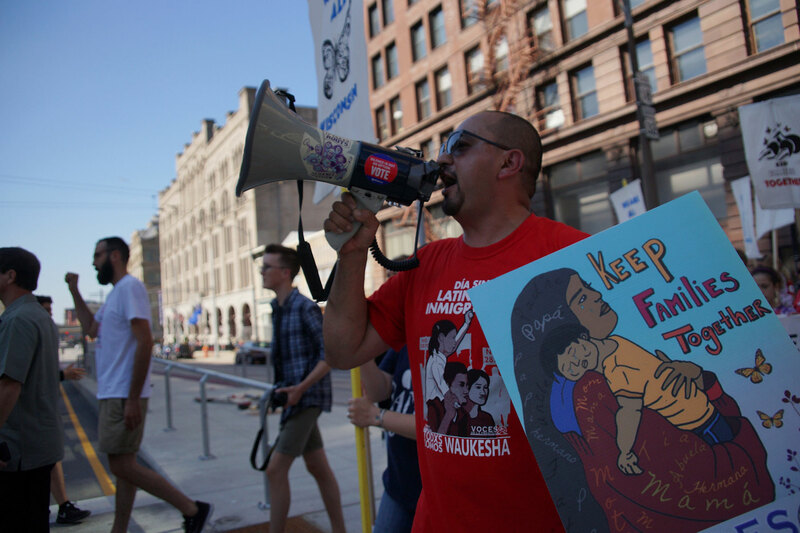 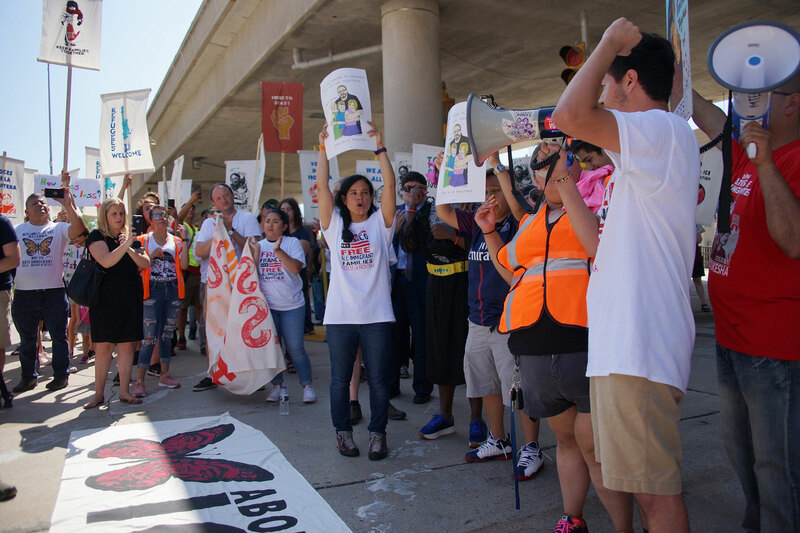 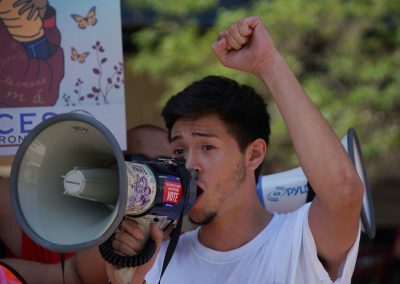 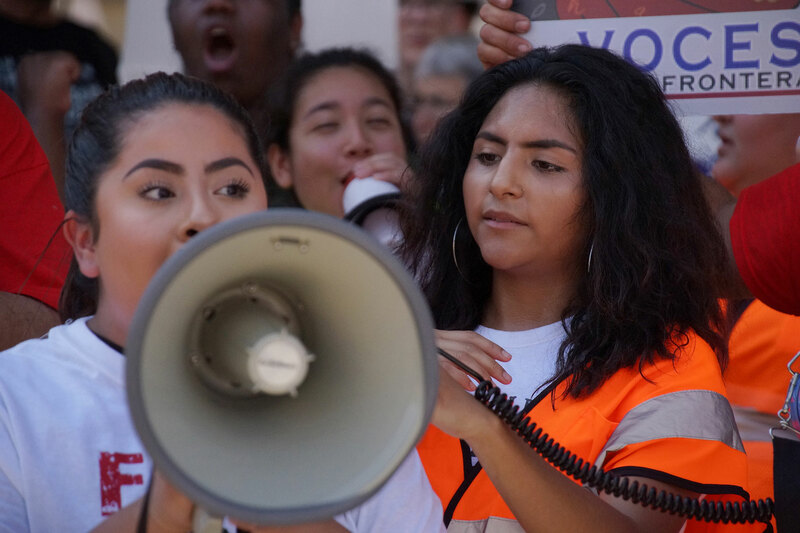 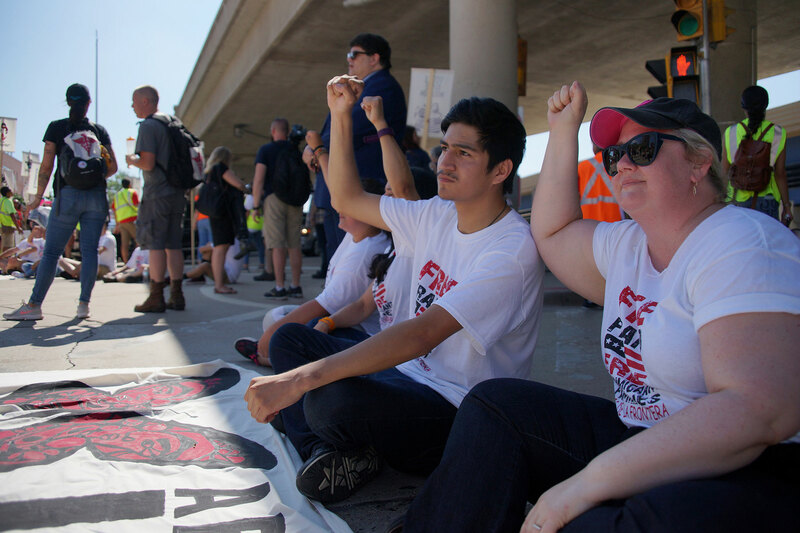 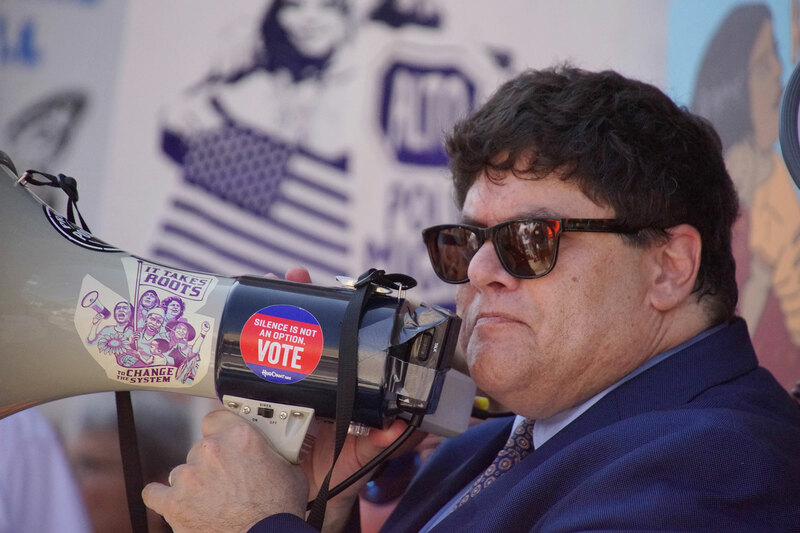 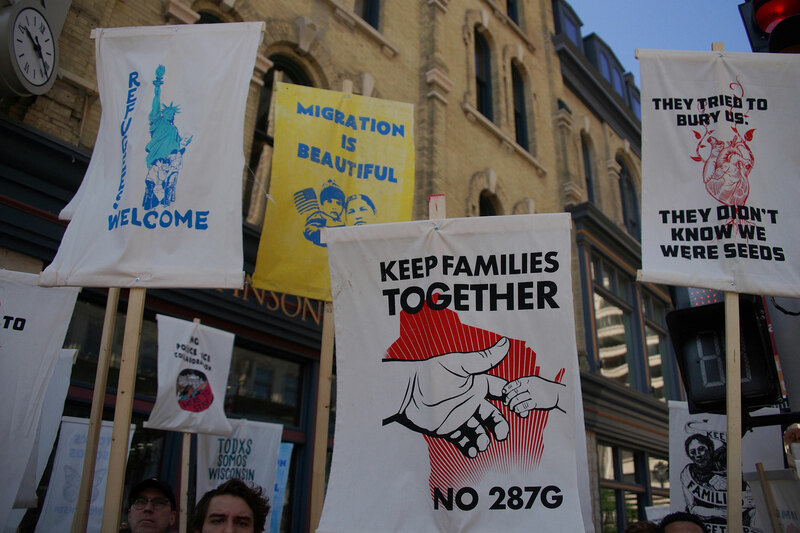 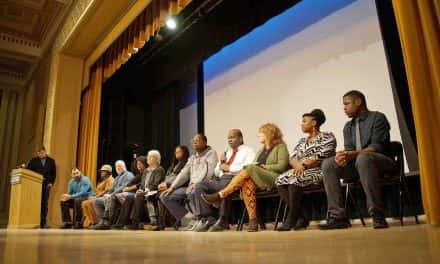 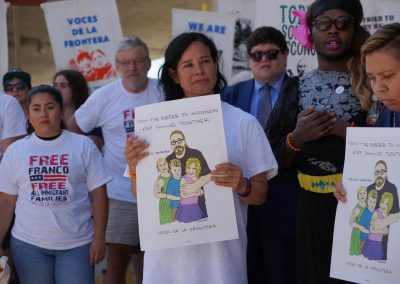 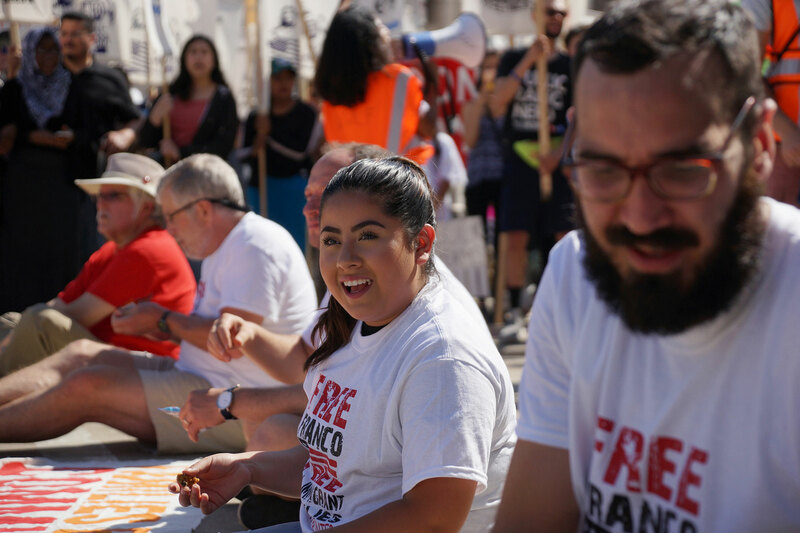 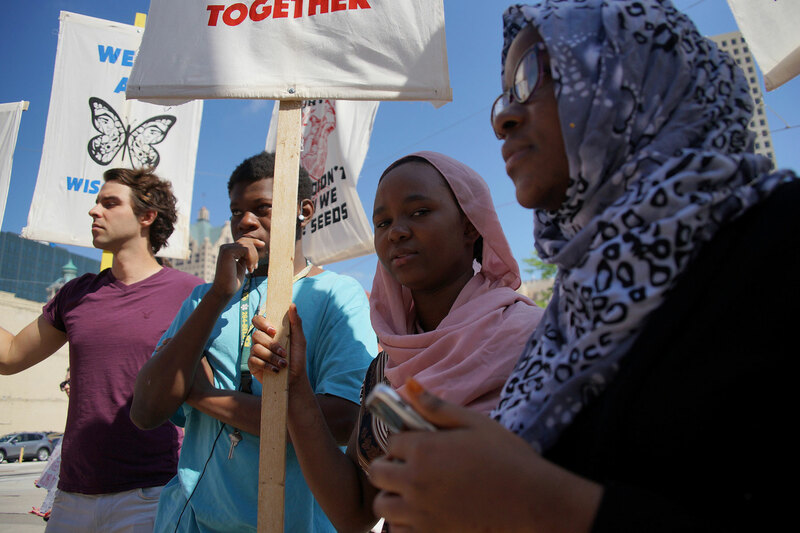 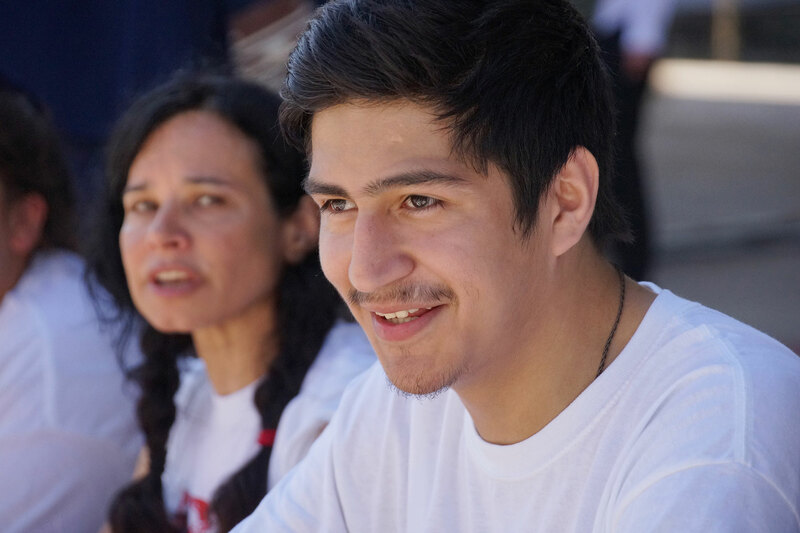 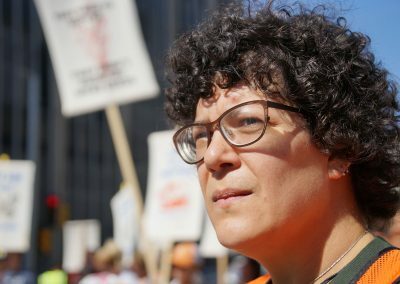 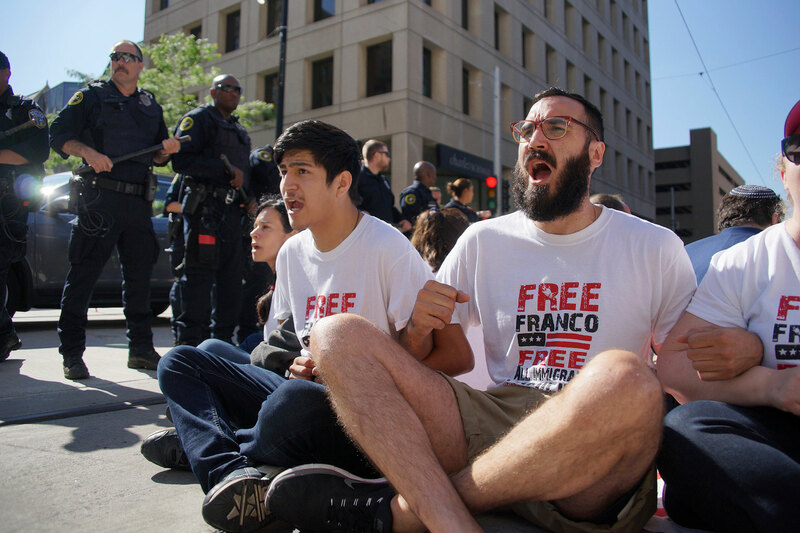 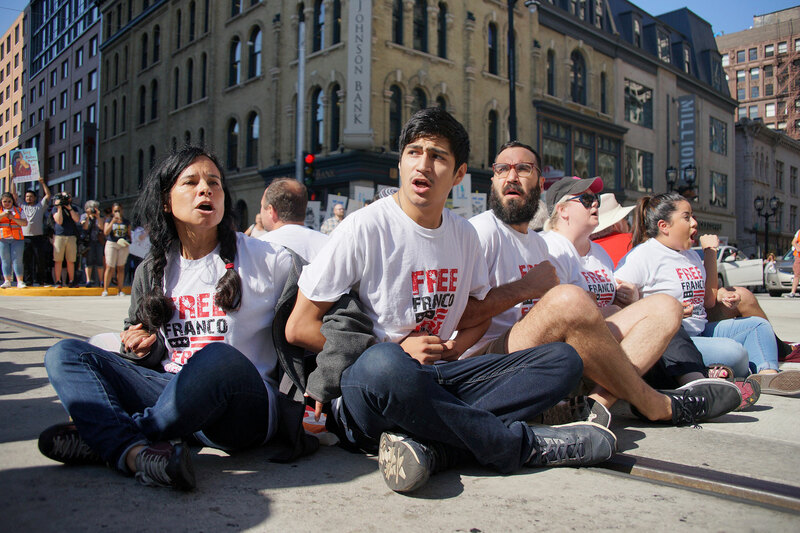 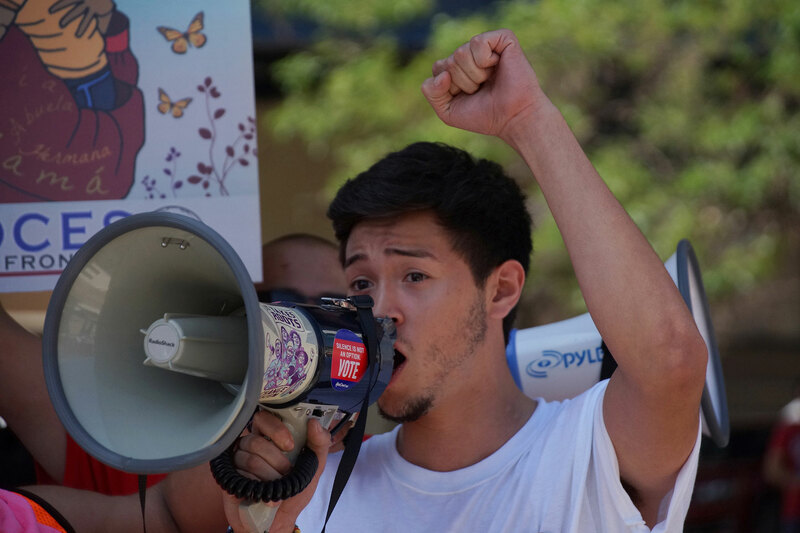 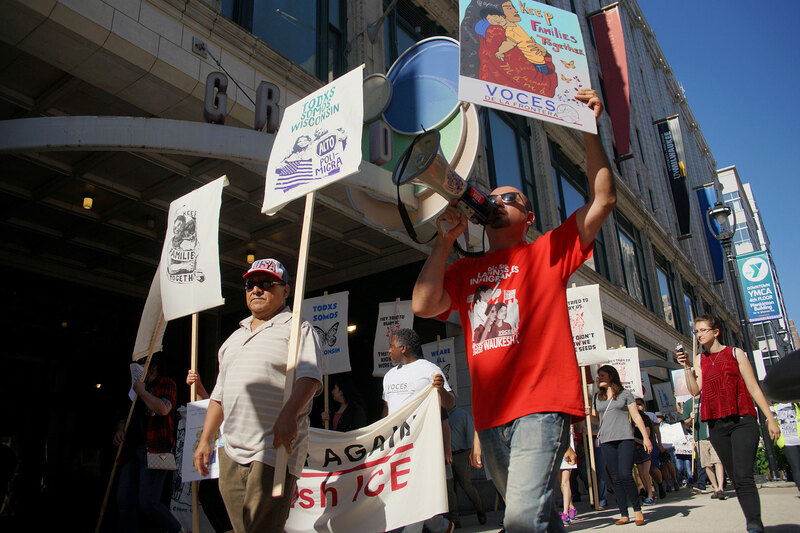 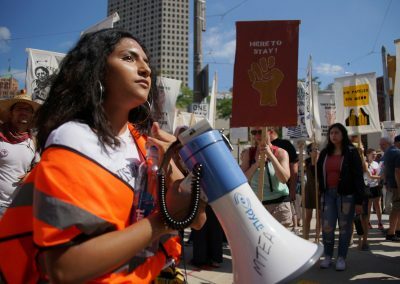 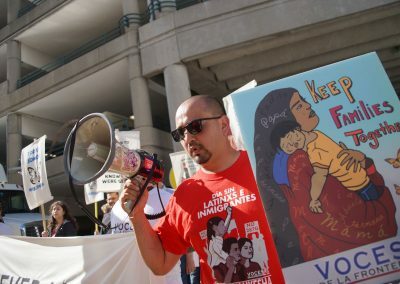 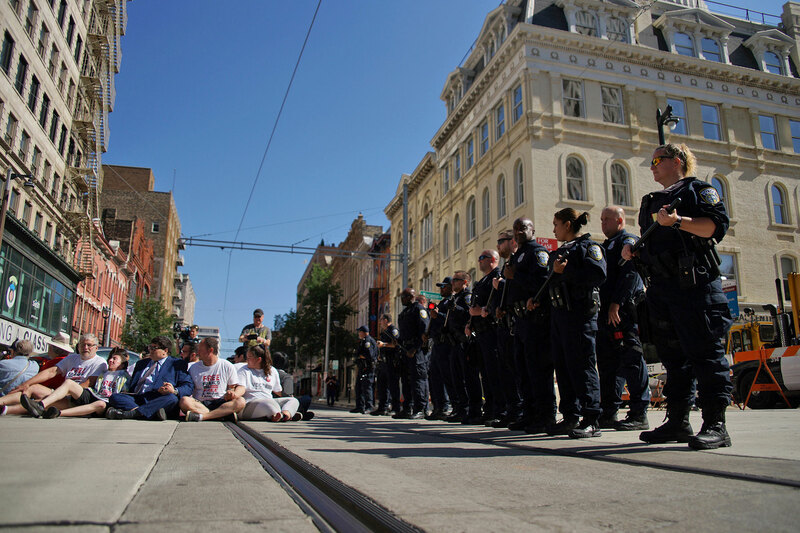 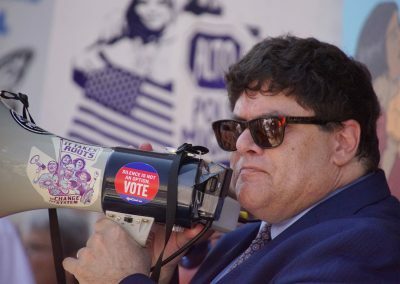 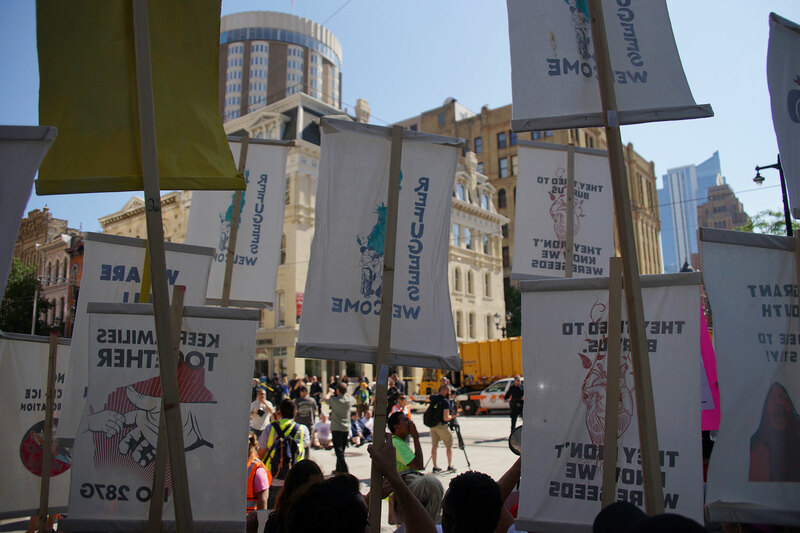 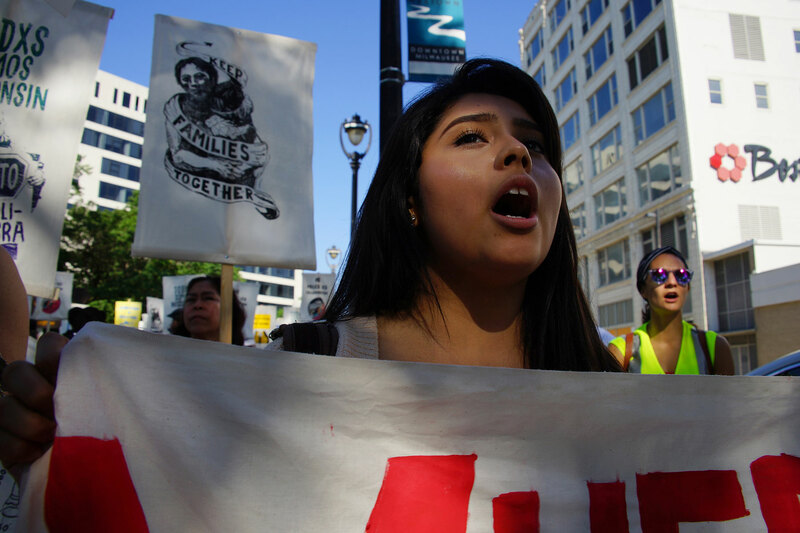 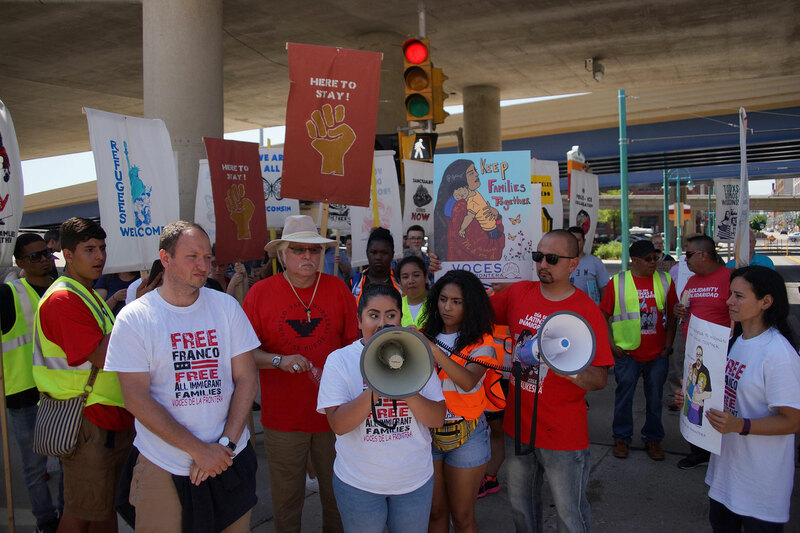 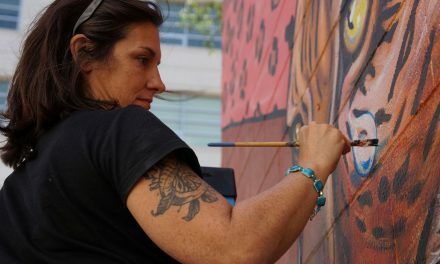 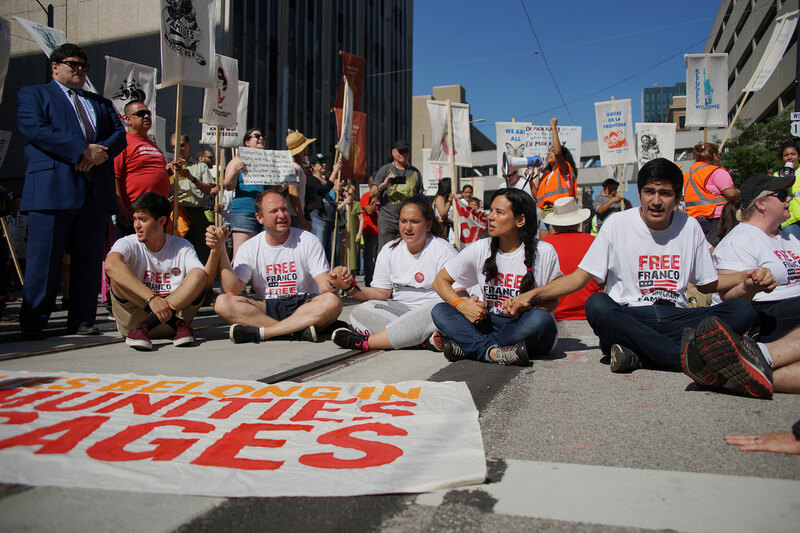 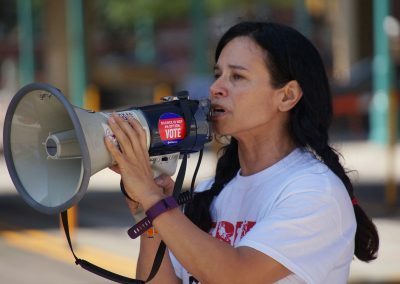 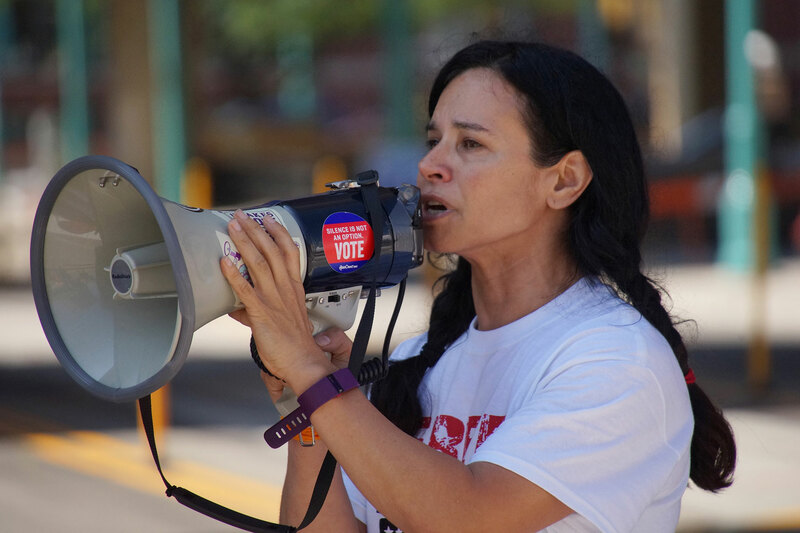 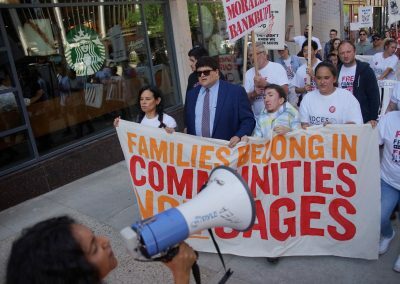 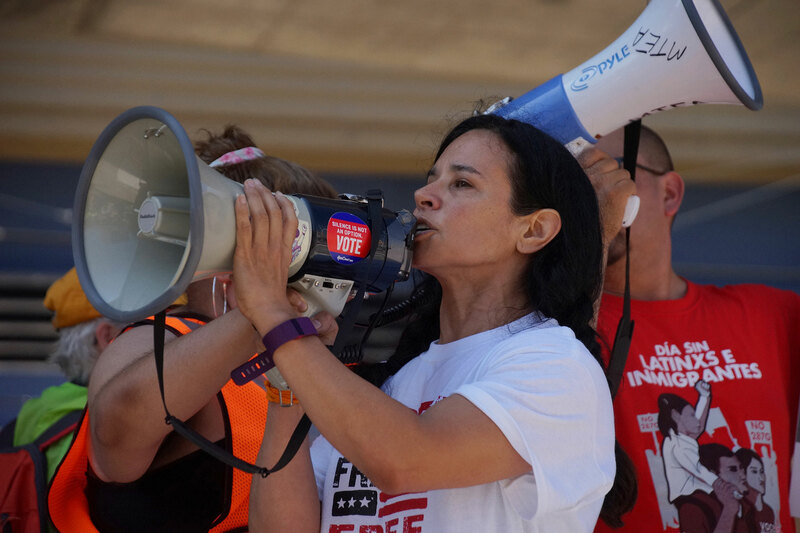 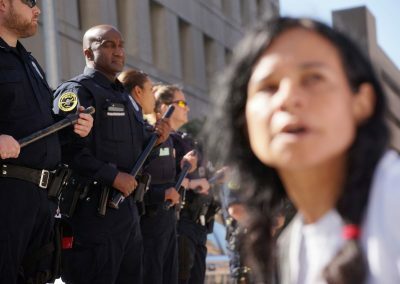 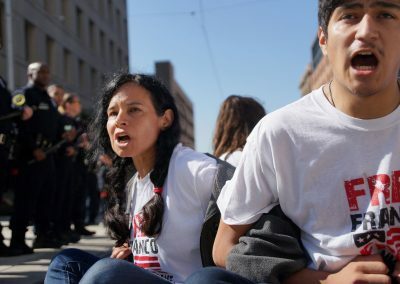 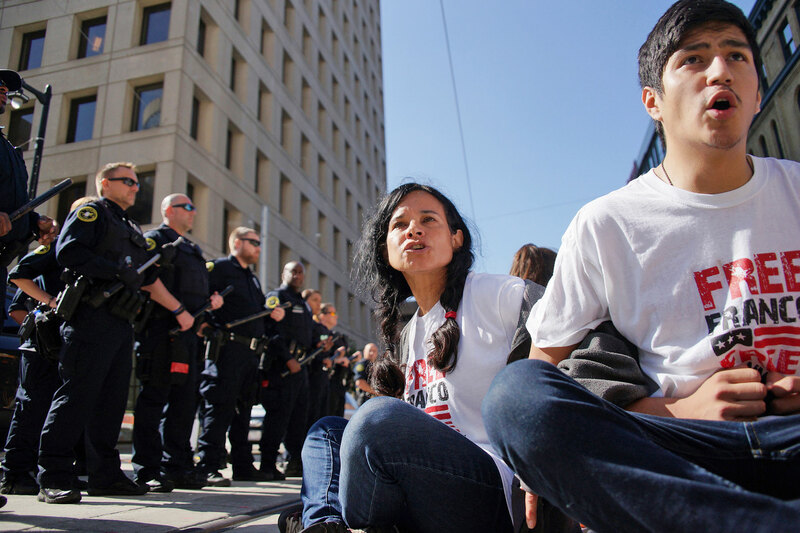 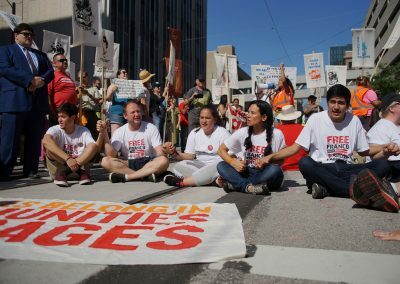 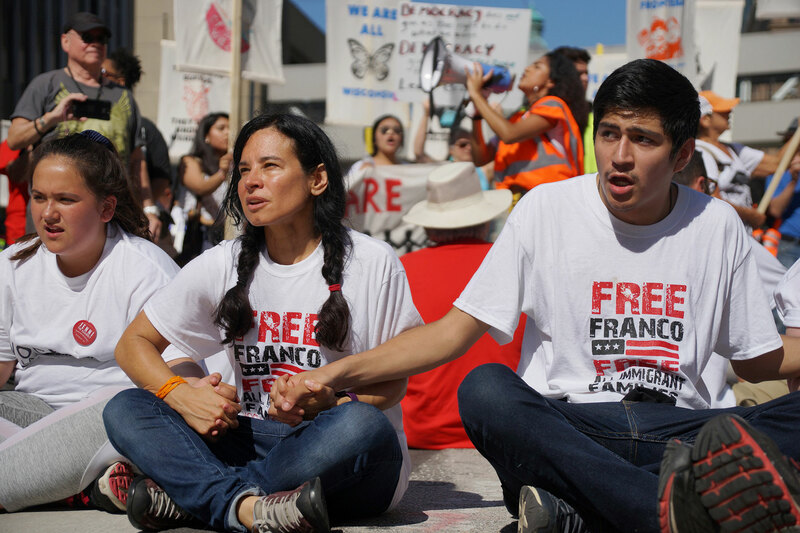 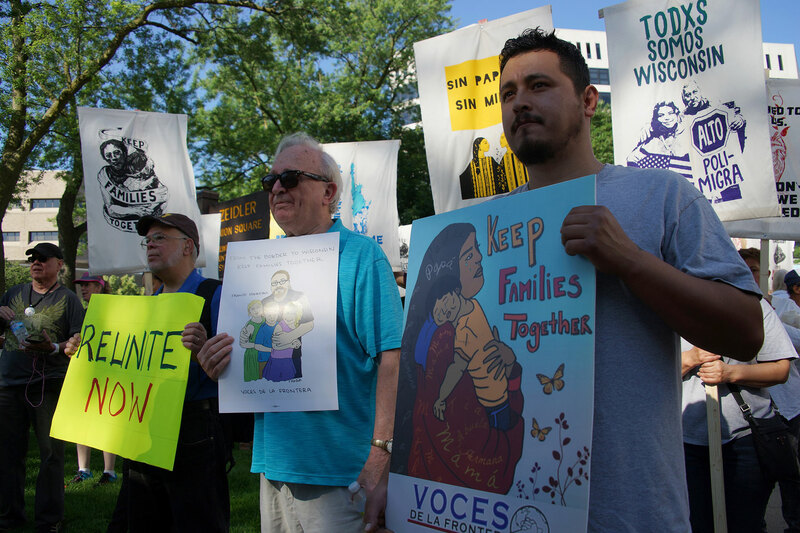 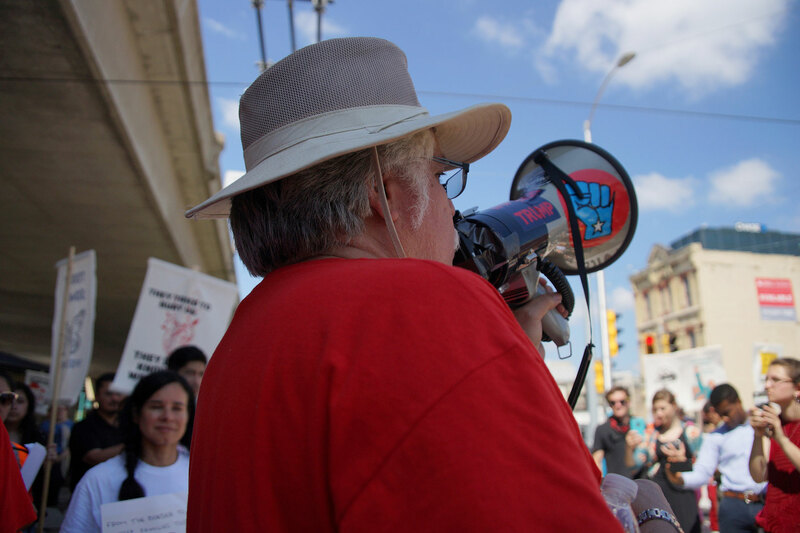 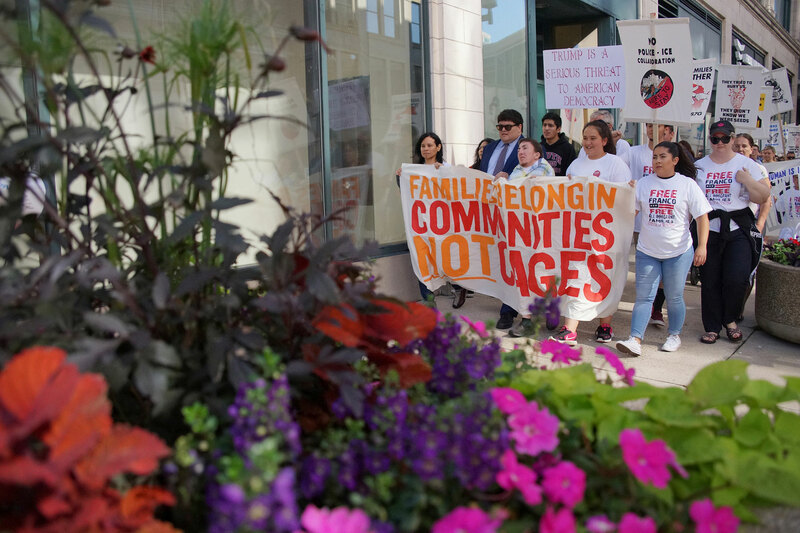 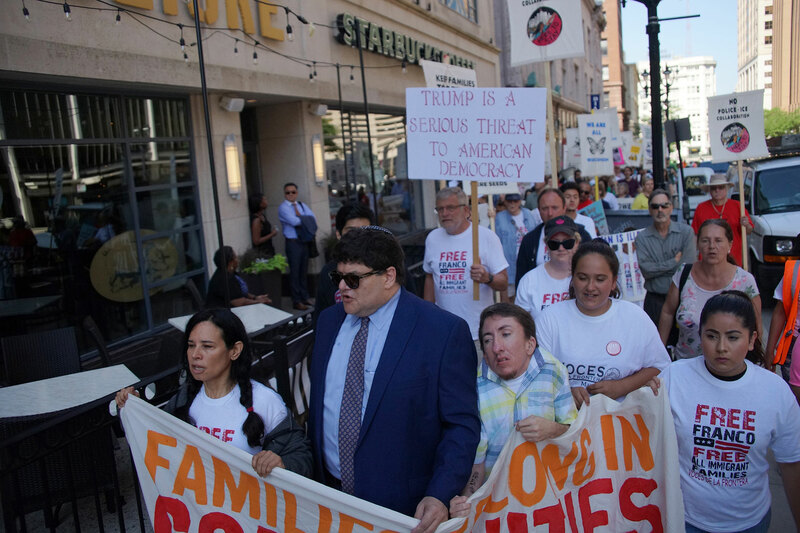 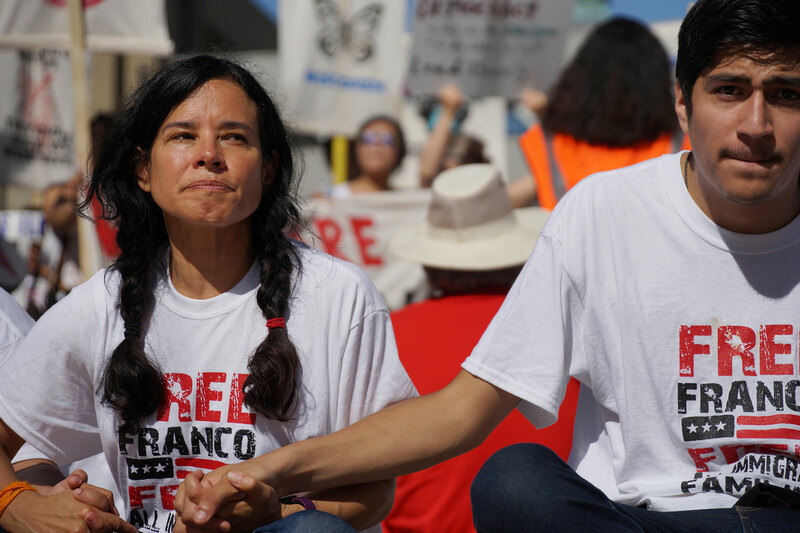 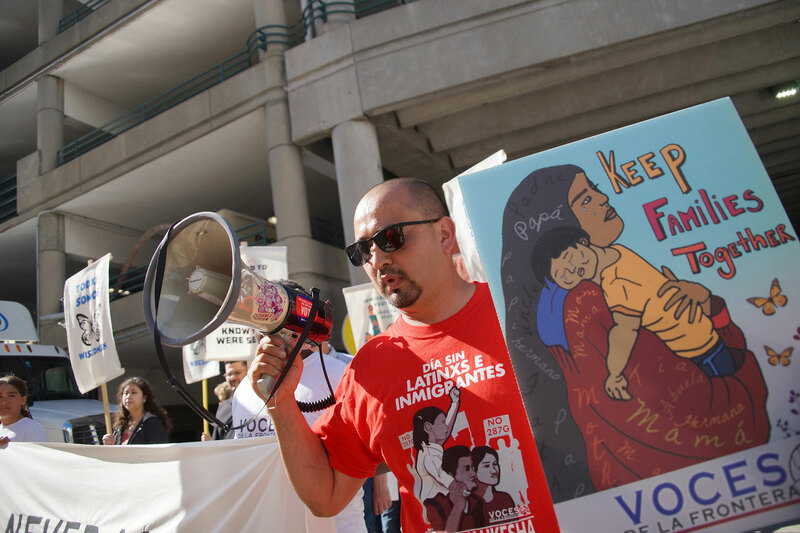 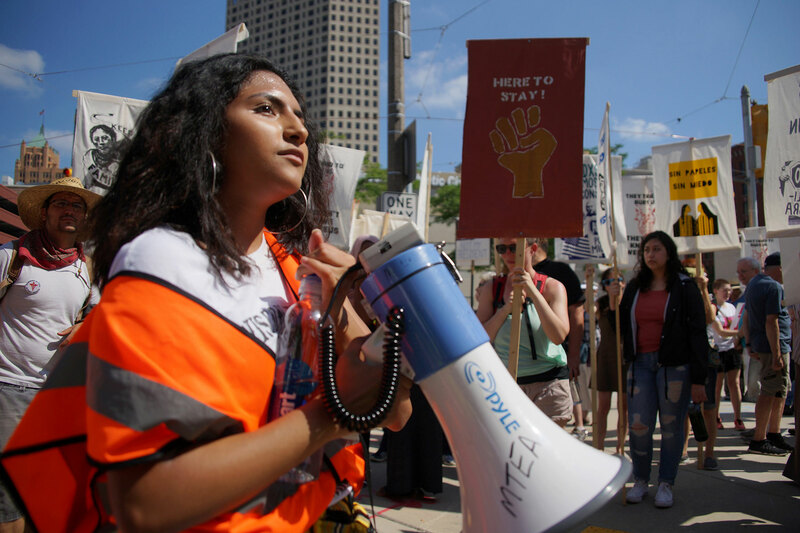 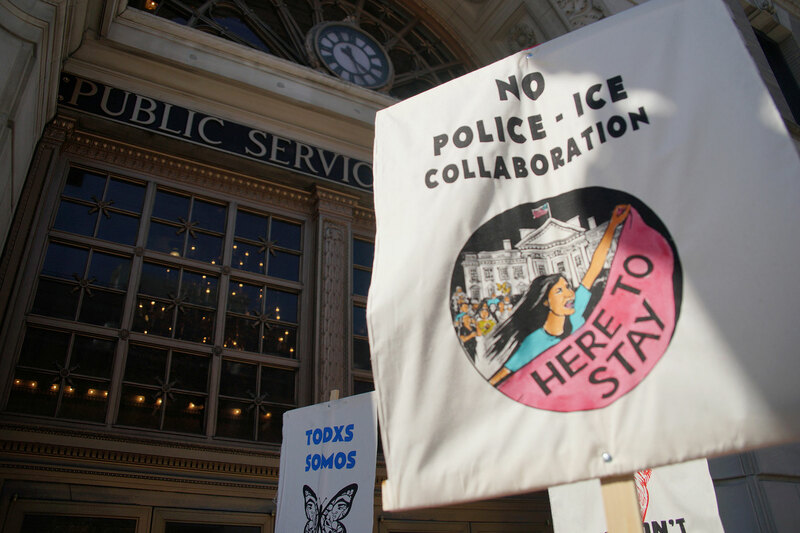 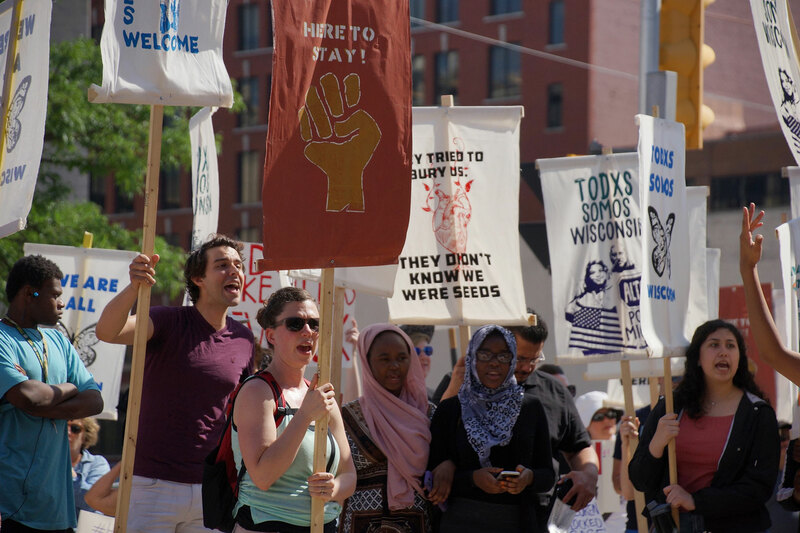 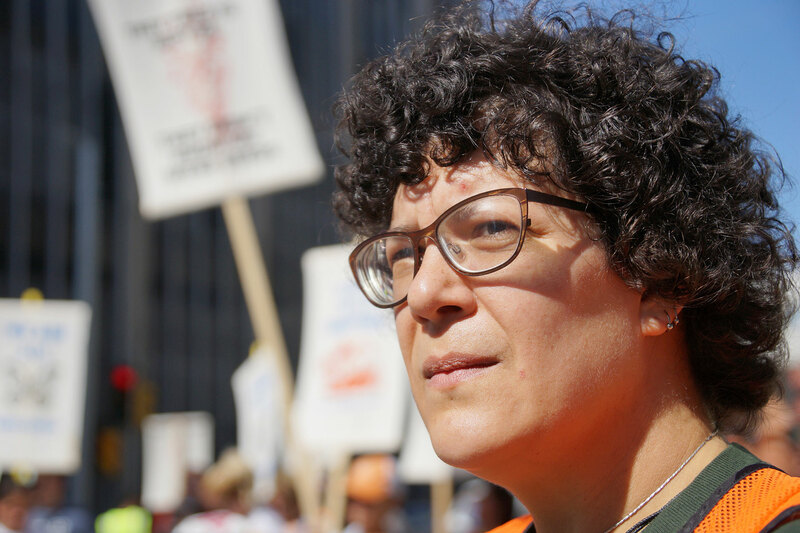 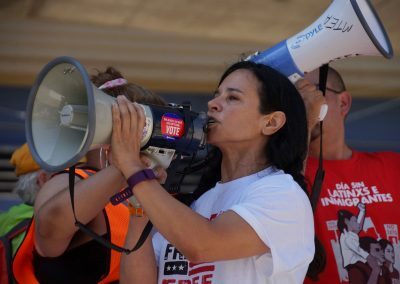 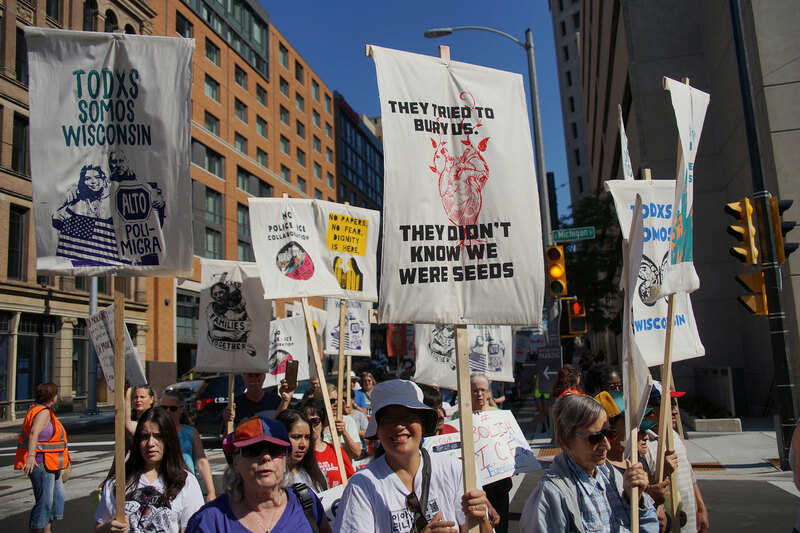 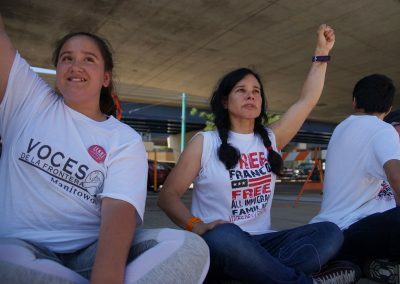 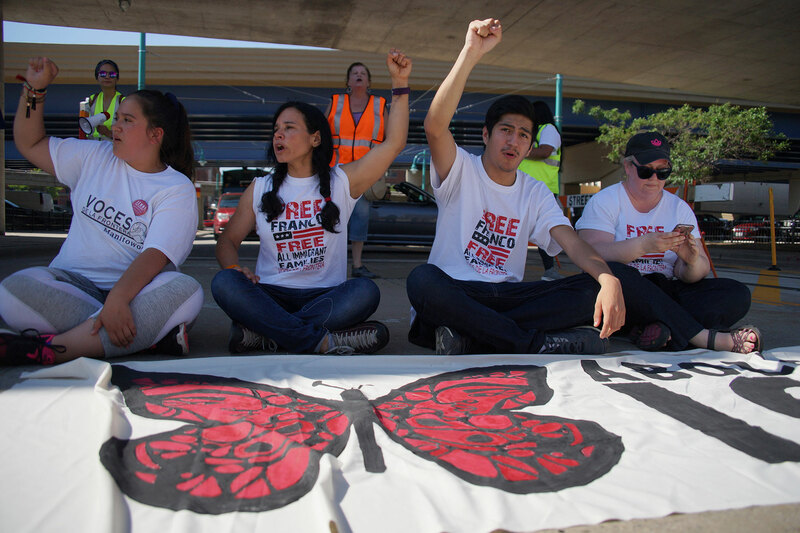 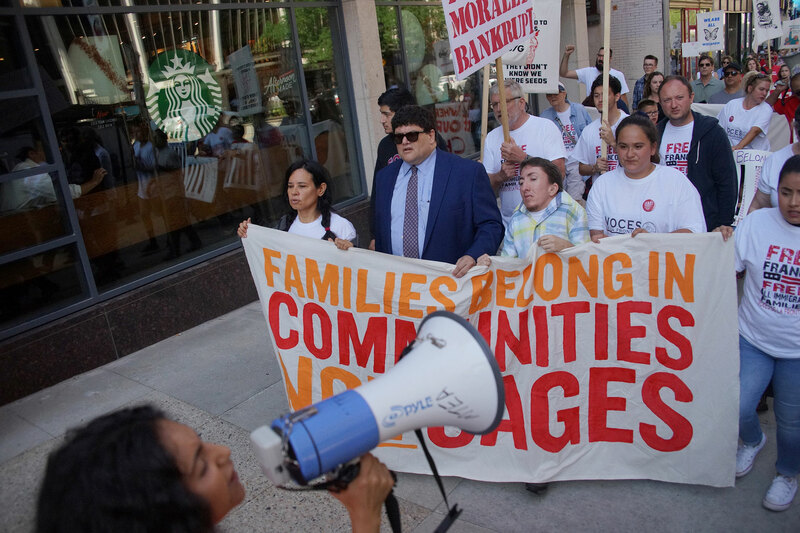 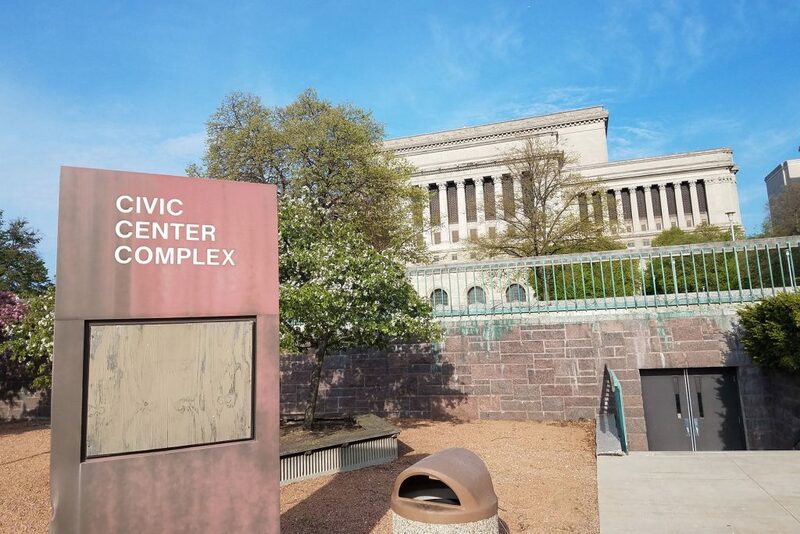 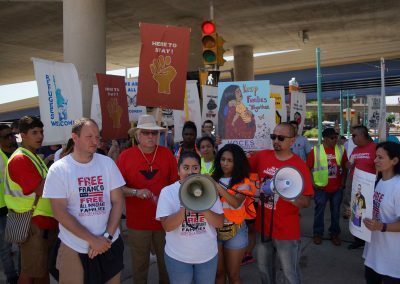 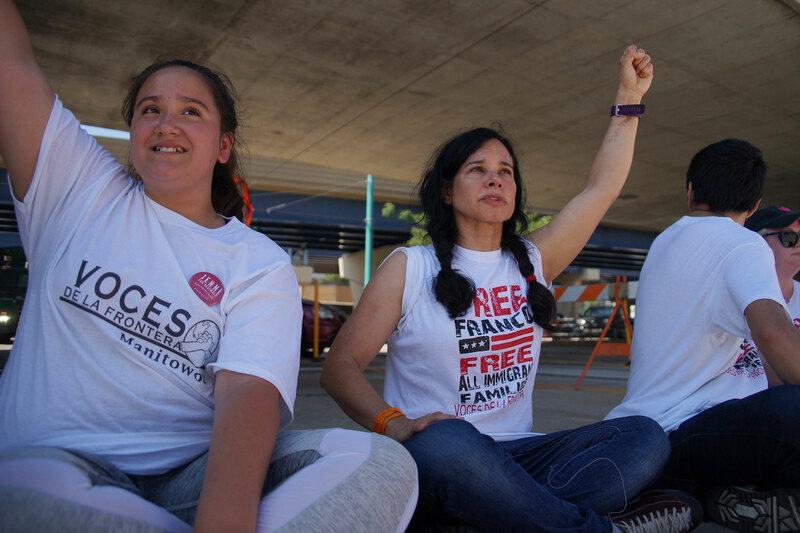 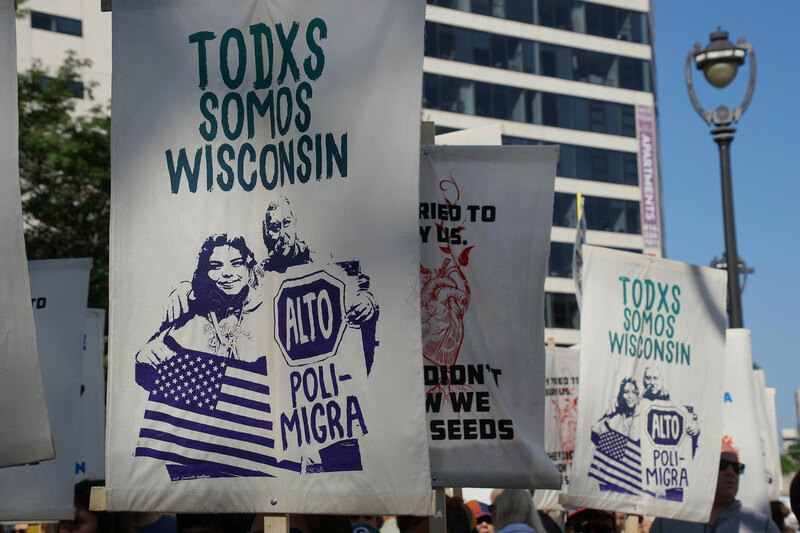 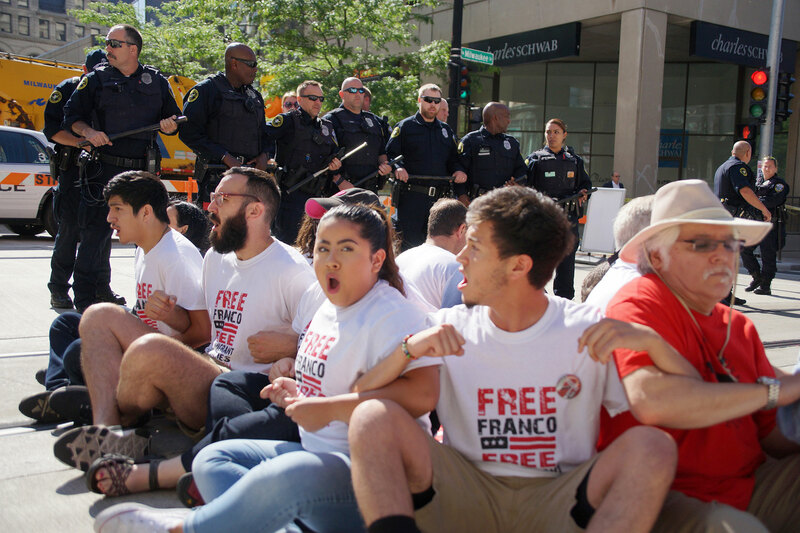 Voces de la Frontera is a membership-based community organization led by low-wage workers, immigrants and students, whose mission is to protect and expand civil rights and workers’ rights through leadership development and community organizing.